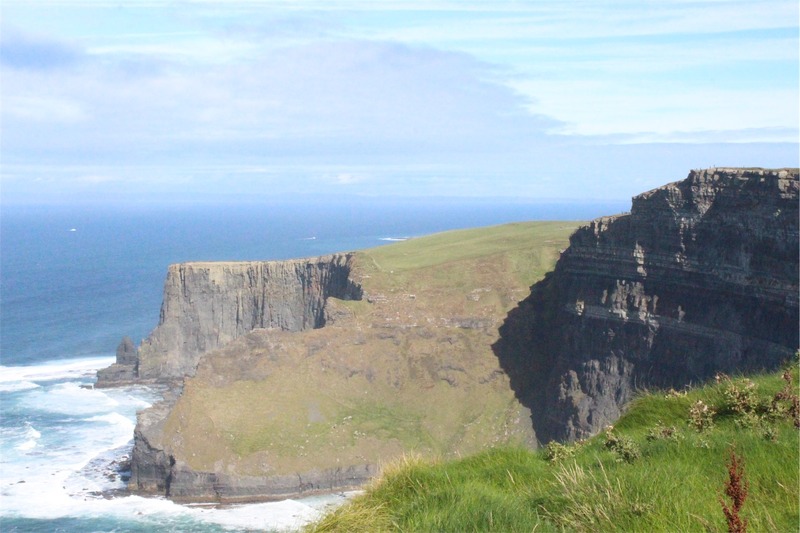 Today’s trip takes us from Sligo to Limerick – a five hour trip via Galway, the Cliffs of Moher and Ennis. 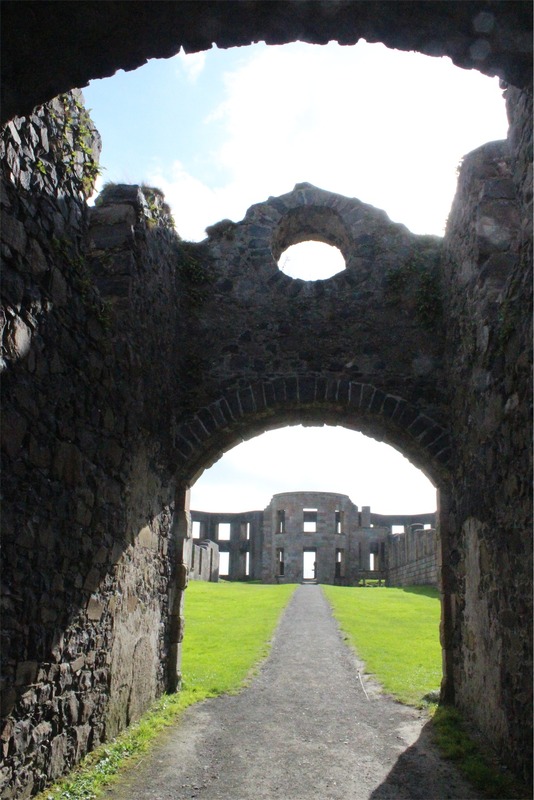 After a good nights sleep we were up super early and made our way to Sligo Abbey, built in the 13th century. 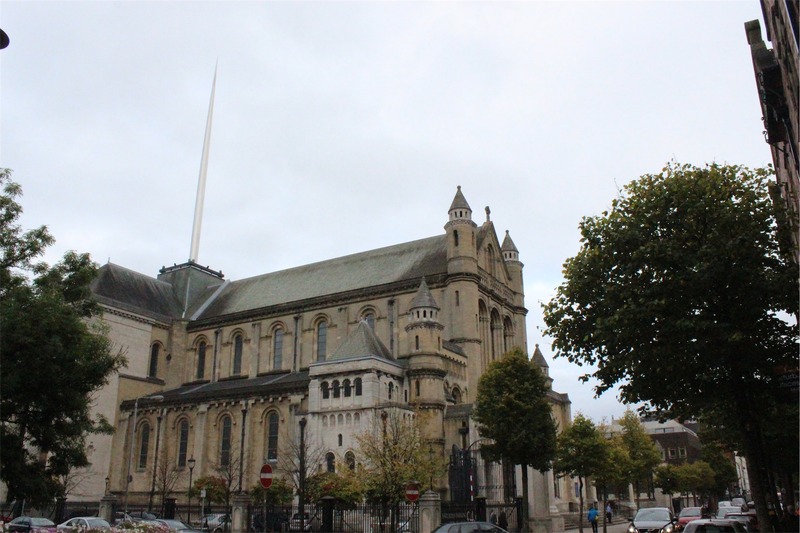 On our way out of Sligo, we stopped to have a look at a beautiful church – the Cathedral of the Immaculate Conception. 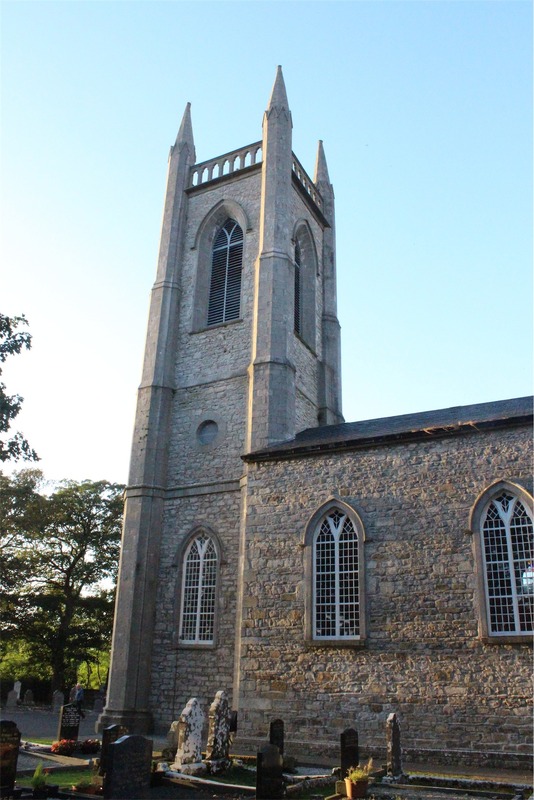 A relatively new church, opened in 1874, it is the only Norman style church in Ireland. 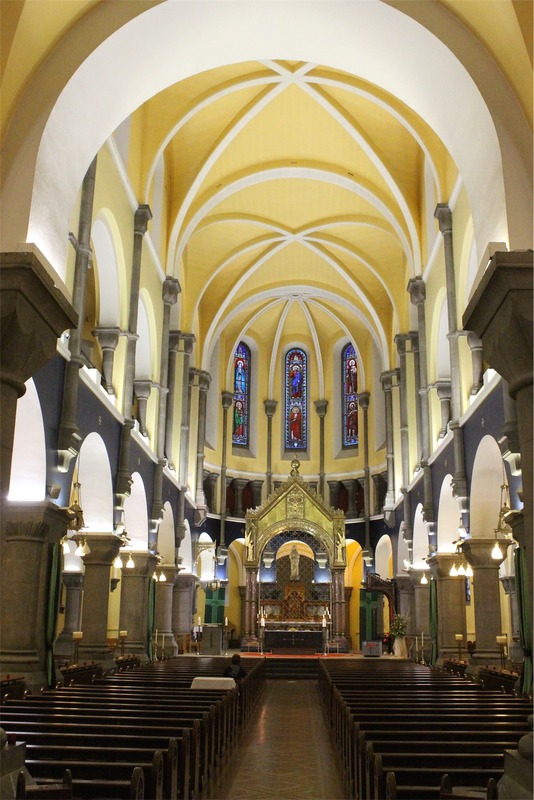 We had a brief look inside, as the morning mass was about to start. 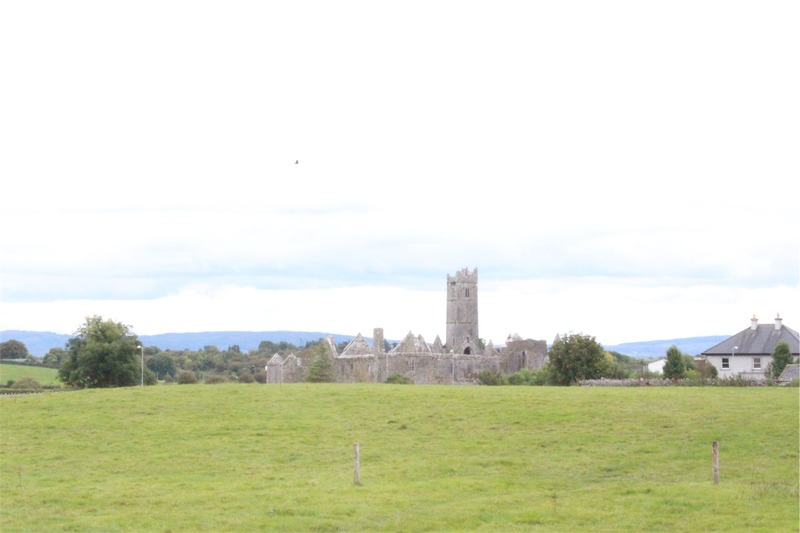 Over the next two hours, we really enjoyed the drive through country Ireland as the scenery was incredible. 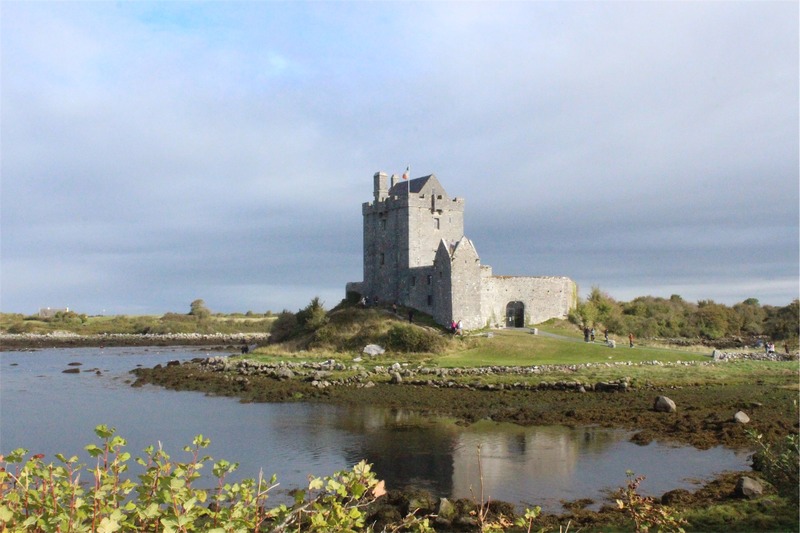 We came across Dunguaire Castle which was not on our itinerary, but simply too picturesque to drive past. We didn’t pay the entry to go inside, but did look around the gift shop. 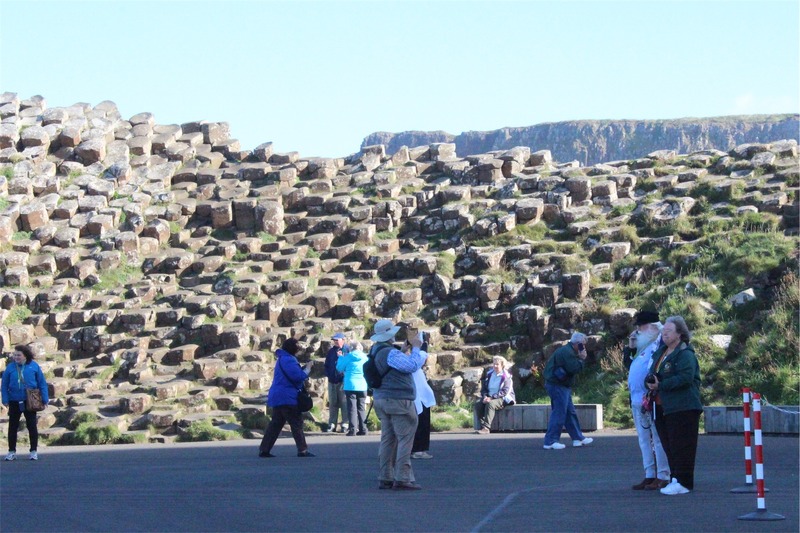 This place seemed to be a major tourist attraction – we knew this from the incredible number of coaches arriving as we left. 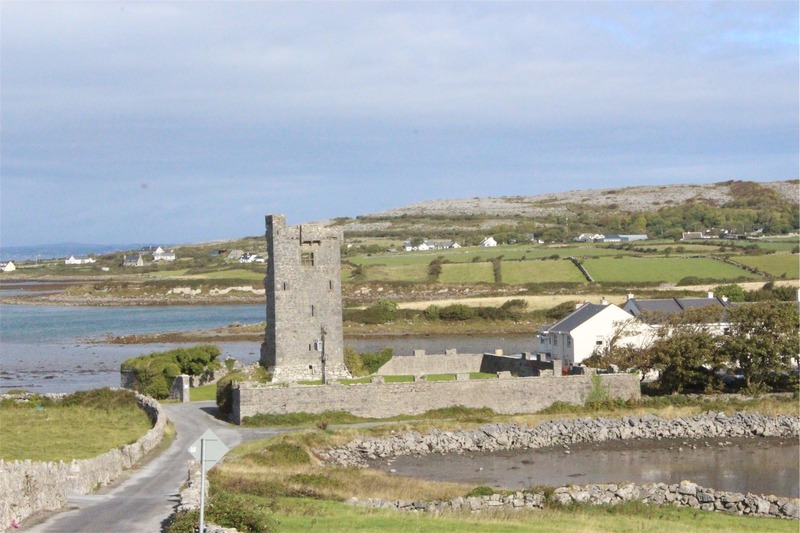 On the coast road just outside of Ballyvaughan we spotted a large keep of a castle and decided to explore. Upon further investigation, it turned out that only one of the walls was intact! 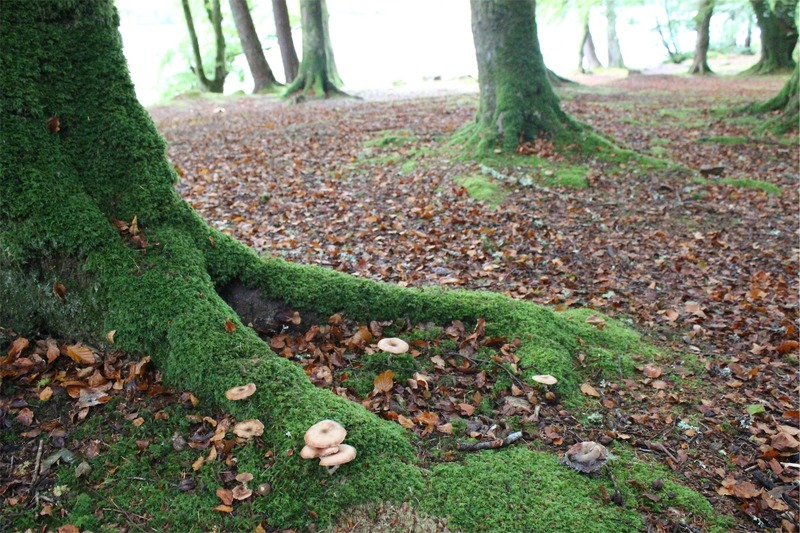 The others had fallen away over the years. 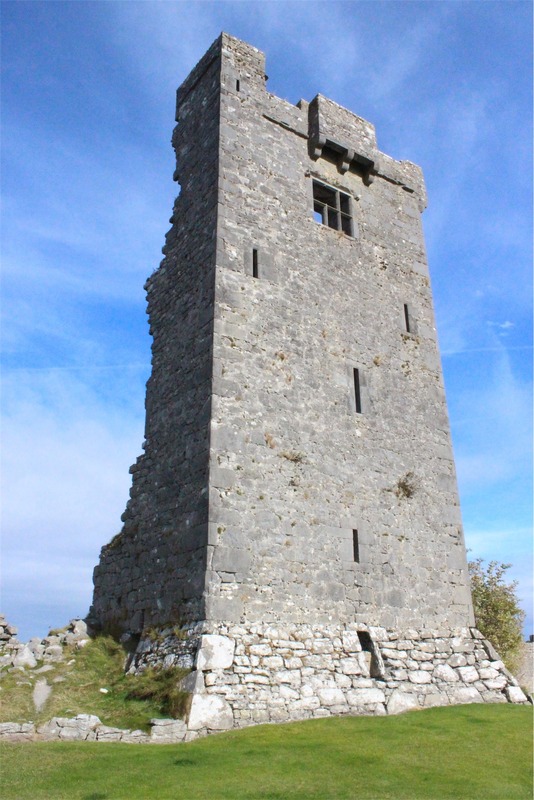 We later found out that it was Muckinish West Tower House built around 1350. 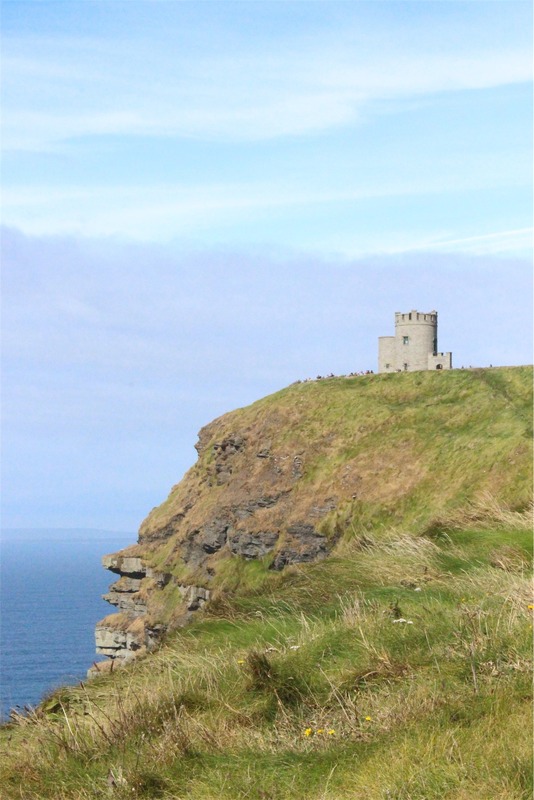 We were only an hour away to our next destination, the Cliffs of Moher. This part of our journey was amazing and it was an incredible day – one of the warmest we’d had since returning to the UK. 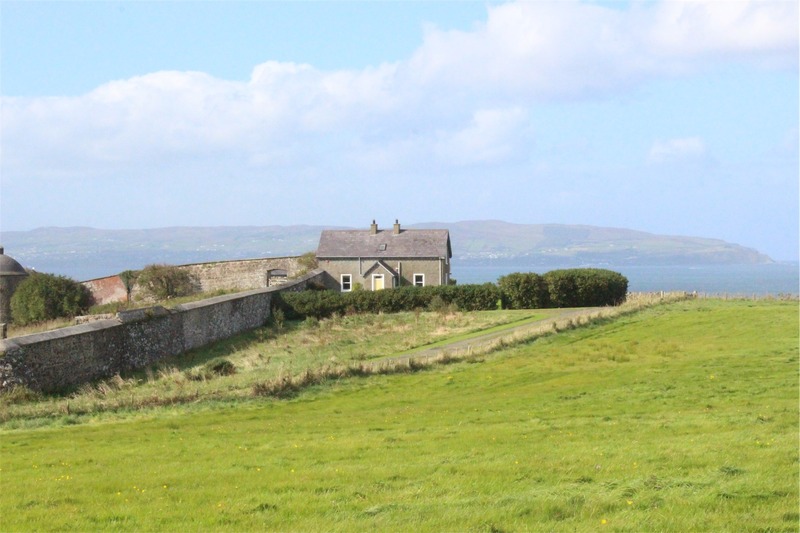 The rolling hills along the coastal road along with the blue sky and green fields partitioned by traditional Irish stone walls were perfect. Along the road we also encountered spectacular views. 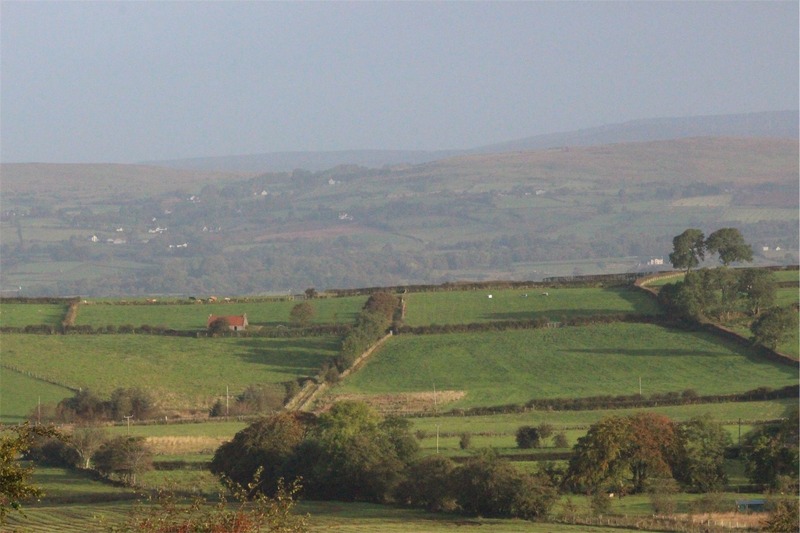 One of them (below) was of a place called The Burren. 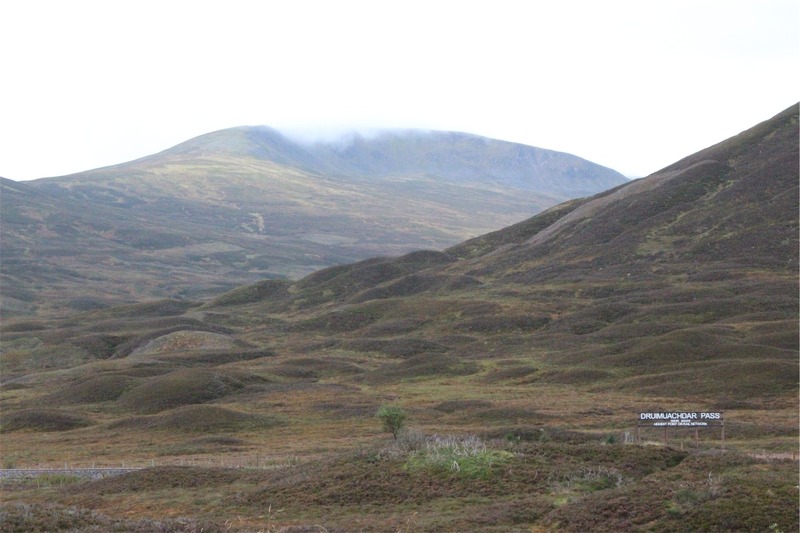 It is within a national park, and has an almost alien landscape on top of the mountains there – a huge contrast to the green everywhere else. 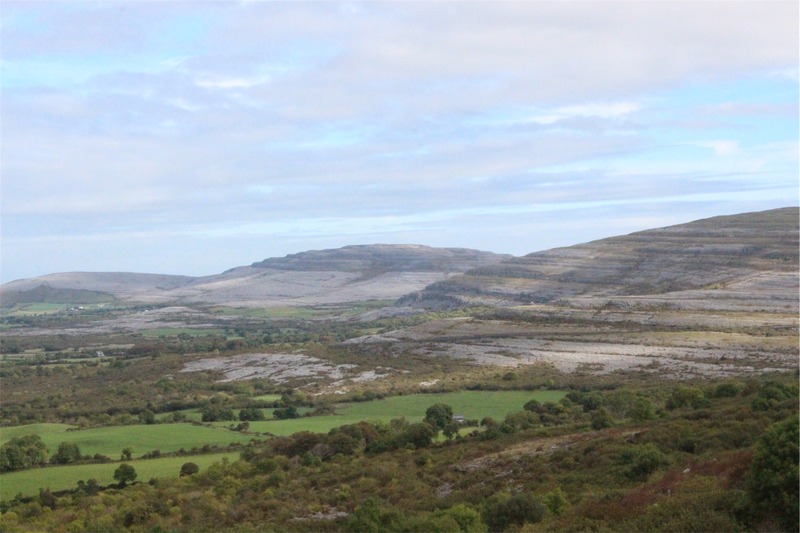 We didn’t have time to explore further, but seeing The Burren in the distance was great! 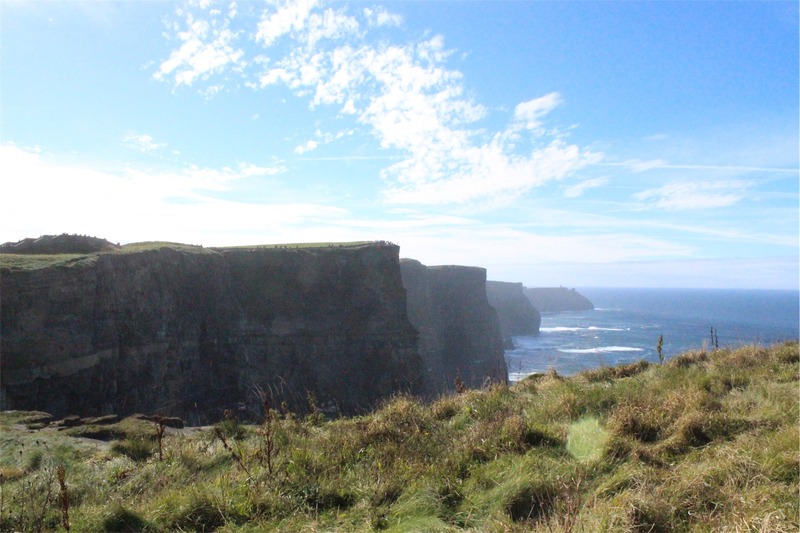 One of the most iconic places to visit in Ireland is the Cliffs of Moher. 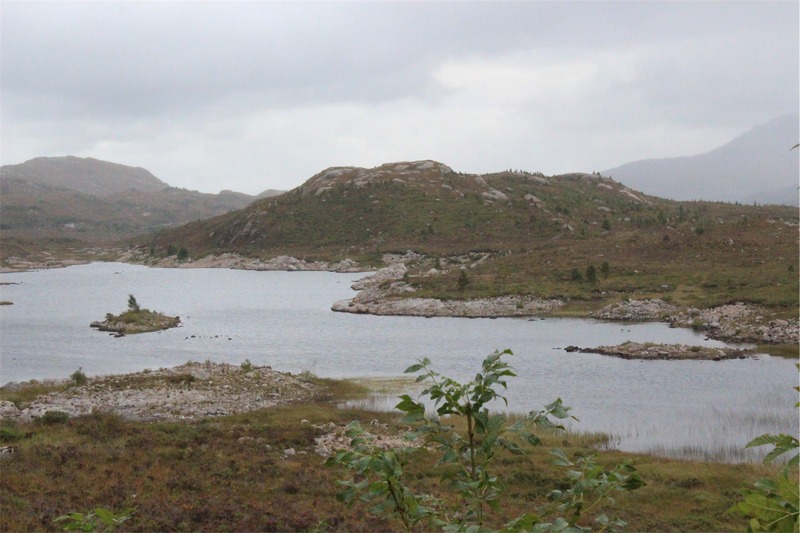 The site itself is visited by a million people per year and is well built to cater for the numbers. 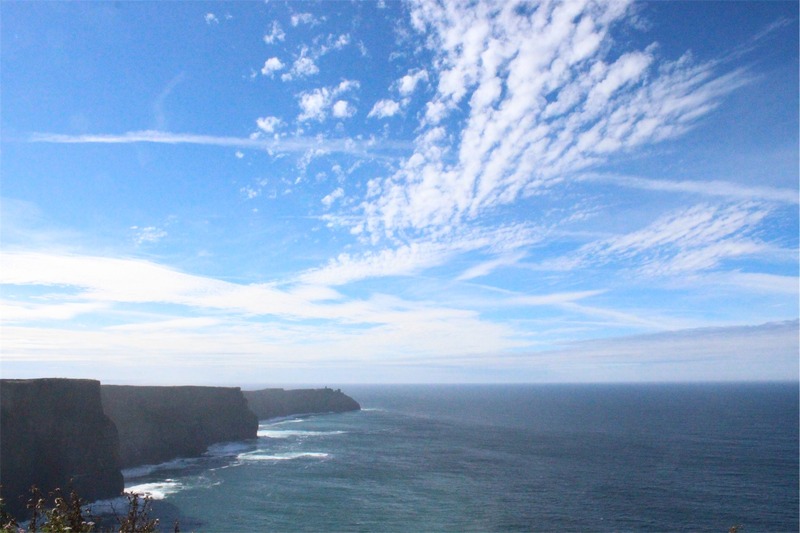 They have a great car park, visitors centre and walks around the cliffs – all for six euro per person (including parking). One of the best value locations we visited on our trip. 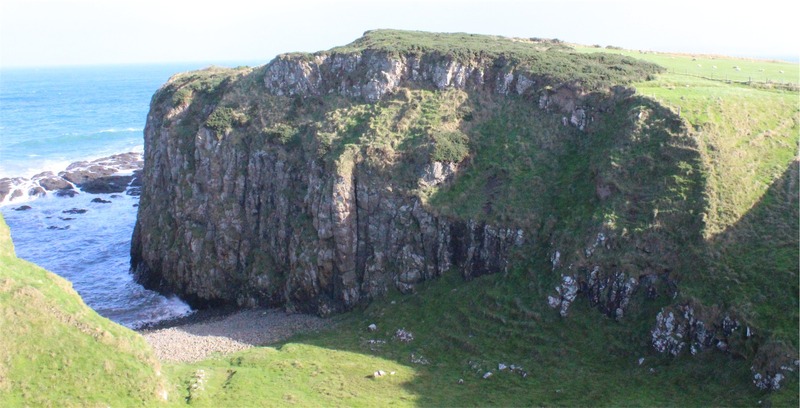 At about 215 metres high and going for 8 kms, the Cliffs are so impressive – 320 million years in the making! 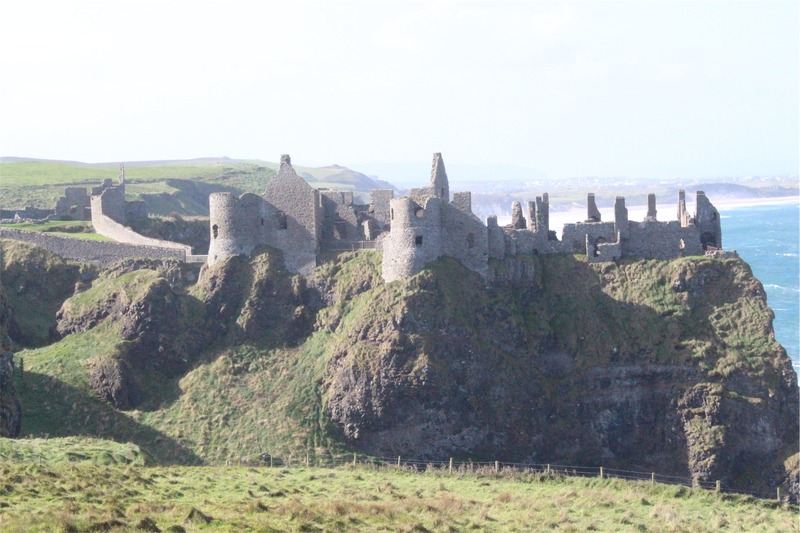 Many films have been made here including a couple of our favourites: The Princess Bride and Harry Potter and the Half Blood Prince. Throughout the UK we had problems finding Air BnB’s so we staying at a lot of hotels. This means we’ve been accumulating loads of washing! 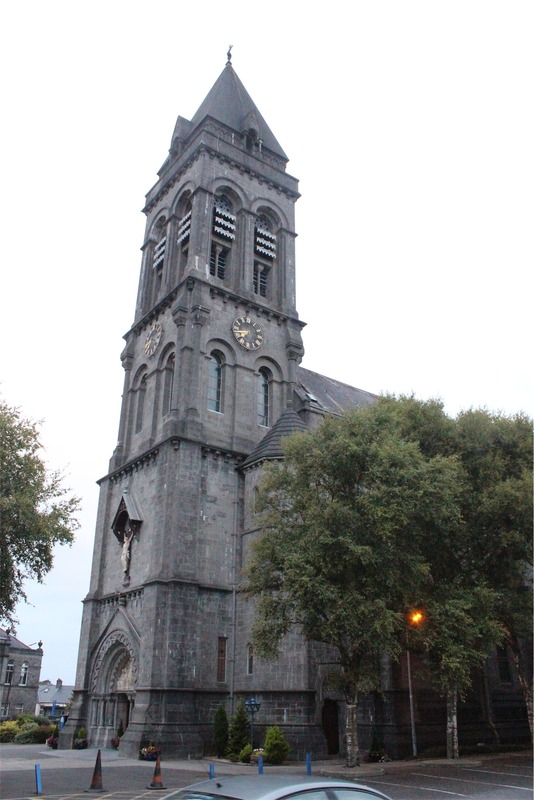 We managed to find a laundromat in a place called Ennis – en route to our hotel. We have to plug Fergus Dry Cleaning, they were really lovely people and after we explained we were travelling, had 8 days worth of washing and an hour to get it sorted, they agreed to prioritise us! We were really surprised with the price as well. While they washed our clothes, we went and had a traditional Irish lunch (including real Guinness) at the local pub, Brogans Bar and Restaurant. Back on the road, we continued toward Limerick, on the way we saw some horses with a new foal that Bec just had to feed an apple to. 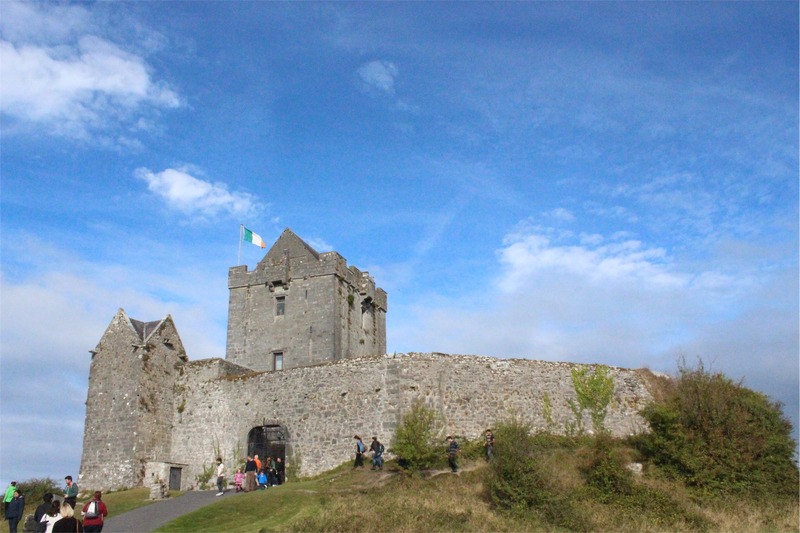 Unfortunately time had gotten away from us, we drove around Bunratty Castle, however couldn’t look around too much as it was closed. 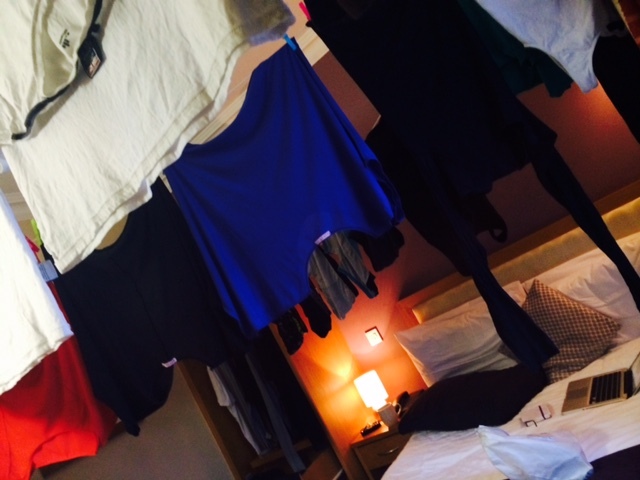 Once at the hotel, we hung all our wet washing up in the room and slept under our drying clothes that night. 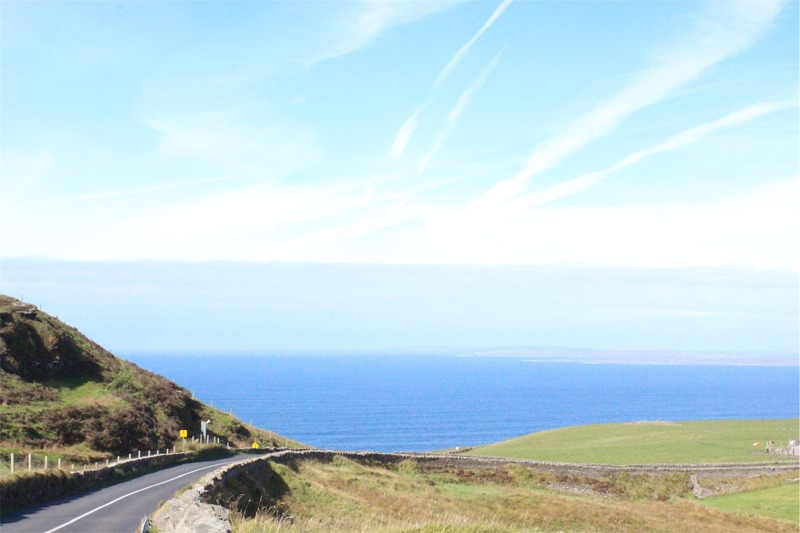 We had a huge day of driving and sightseeing ahead of us in our trip from Belfast to Sligo via the North Coast so we had an early start. 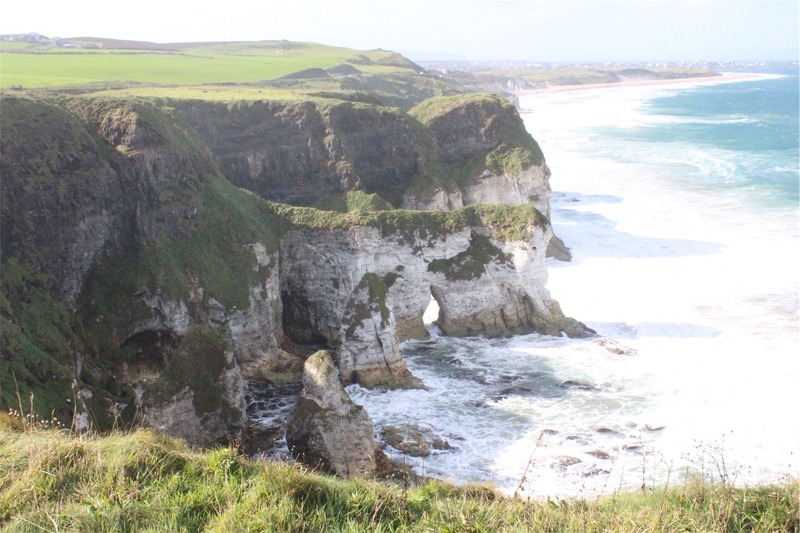 Everywhere you look in Northern Ireland the scenery is breathtaking. 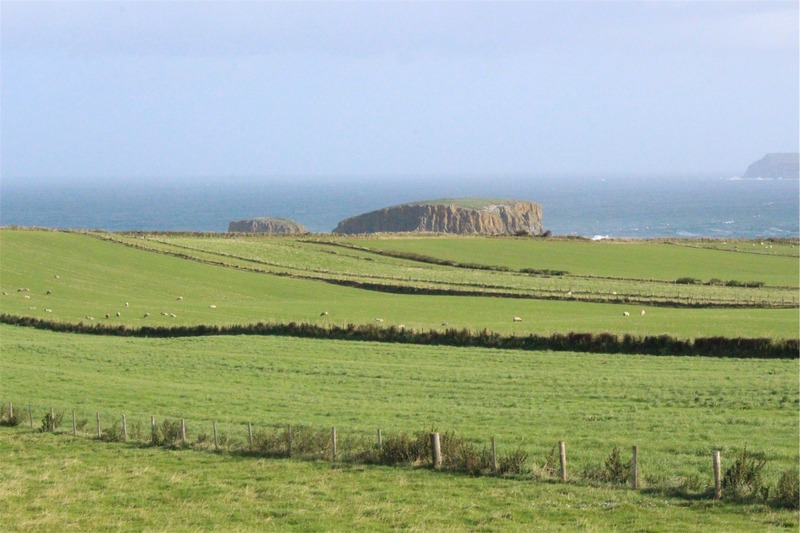 The bright blue sky and the emerald green of the fields are only broken up by rough cliffs and sea glimpses. 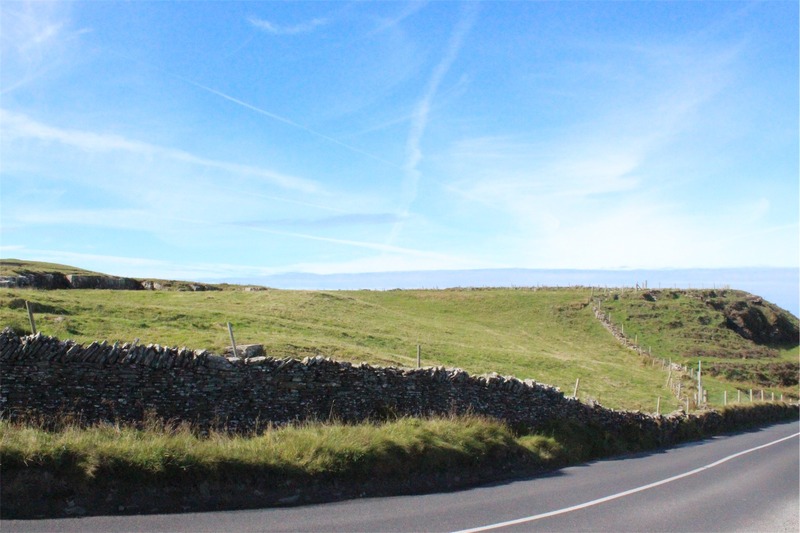 The weather had now turned and the cloudless days, whilst beautiful, were cold. 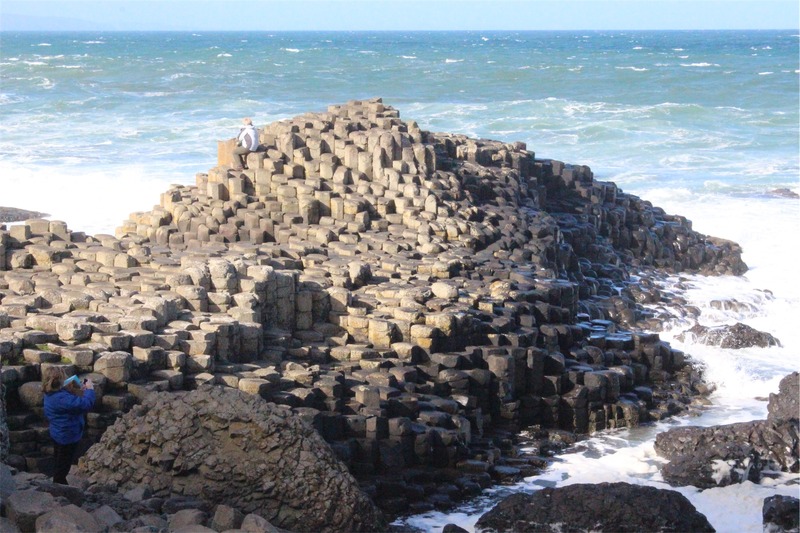 Our first destination was the Dark Hedges, only an hour outside of Belfast. 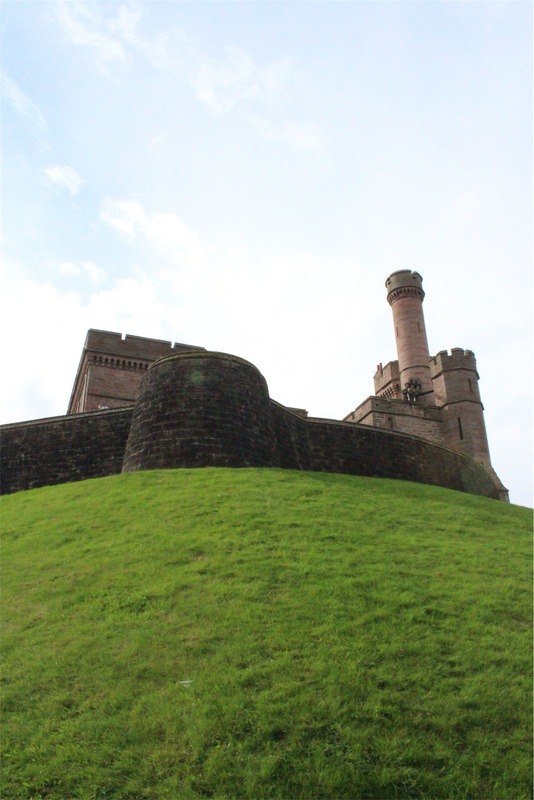 We should point out that the initial reason we went there was to see the filming location for the Game of Thrones TV series. Regardless of the pop culture reference, it was amazing. 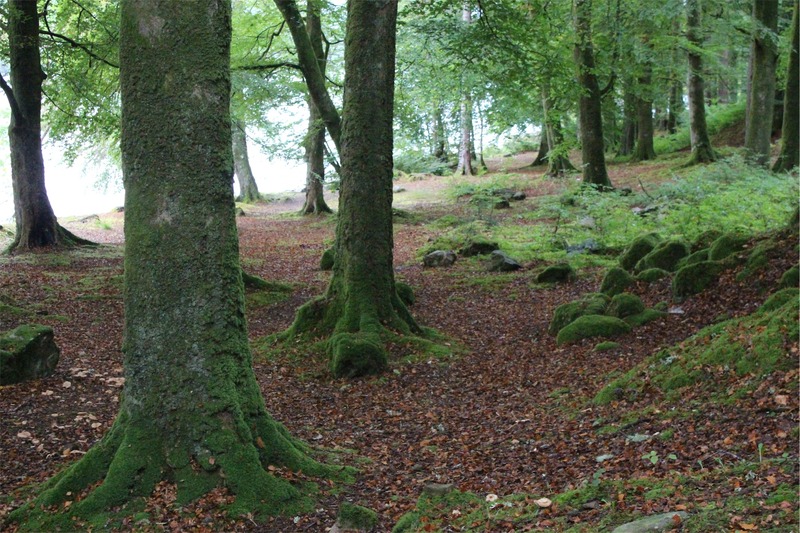 The Dark Hedges is a beautiful avenue of beech trees, planted by the Stuart family in the eighteenth century. Two hundred years later, the Dark Hedges have become one of the most photographed natural phenomena in Northern Ireland. 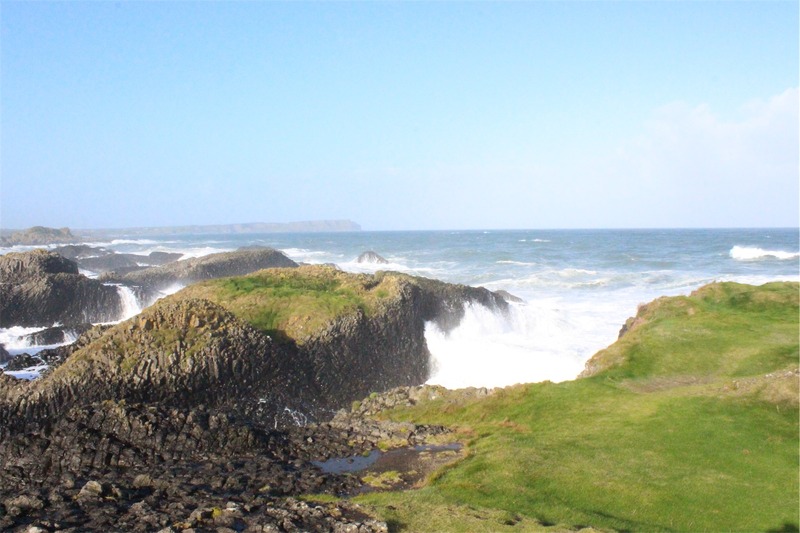 Ballintoy is situated in one of the most picturesque parts of the North Antrim Coast between the Giant’s Causeway and Carrick-a-Rede Rope Bridge. 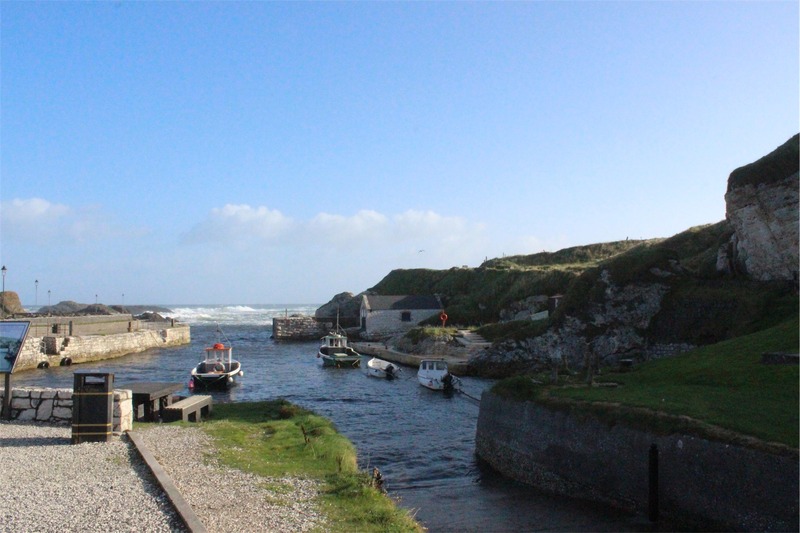 This stunning harbour location has been used for exterior Pyke shots and as the Iron Islands in Game of Thrones. 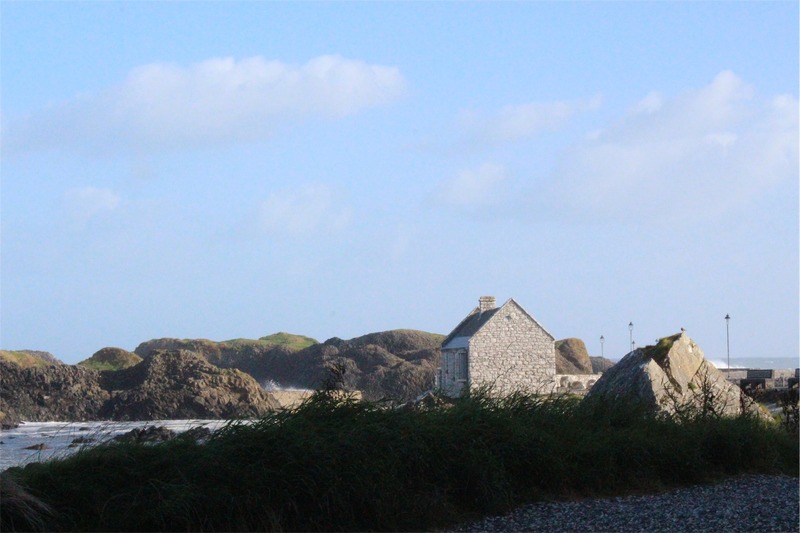 We spent a lot of time at the harbour exploring the rocky coastline. 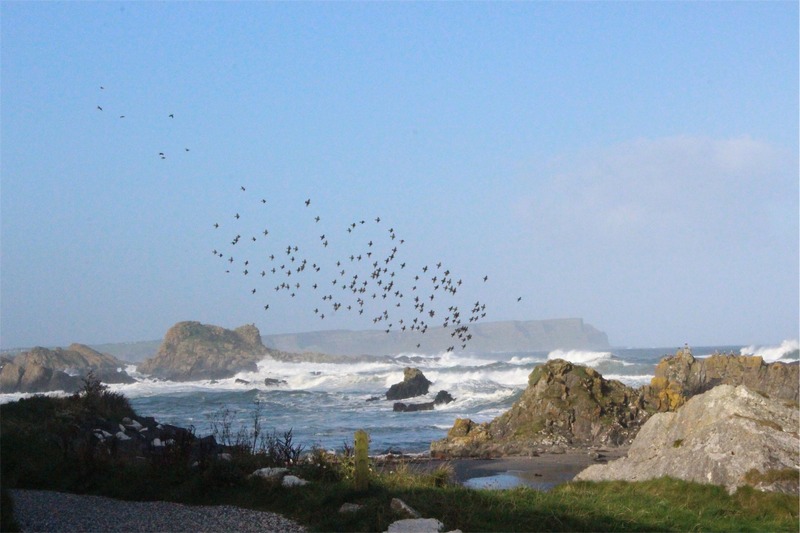 The noise of the wind, ocean and birds was deafening, particularly as the waves crashed onto the rocky shore. Despite this it was incredibly relaxing and strangely calming. 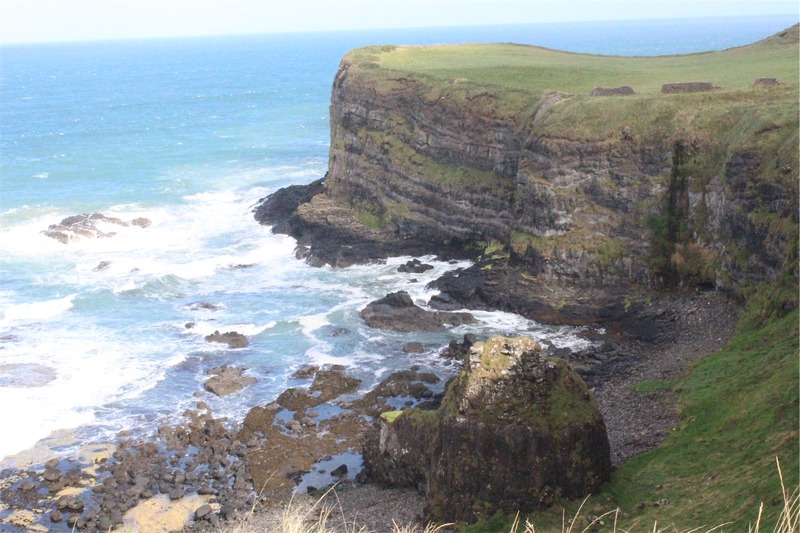 As we continued along the North Antrim Coast we made our way to Larrybane headland. 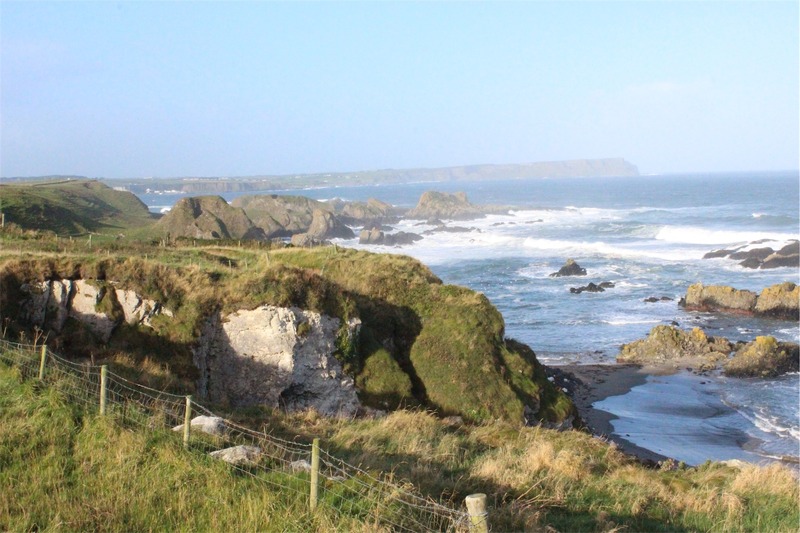 Larrybane was featured in Game of Thrones being the location of Renly Baratheon’s camp site in Season 2. 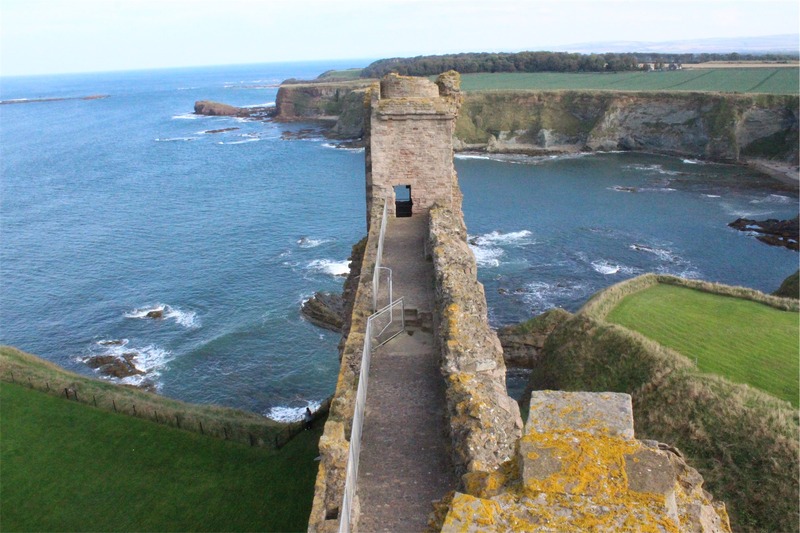 The coastline constantly surprised us with spots like the White Bay viewpoint and Castle Dunseverick. 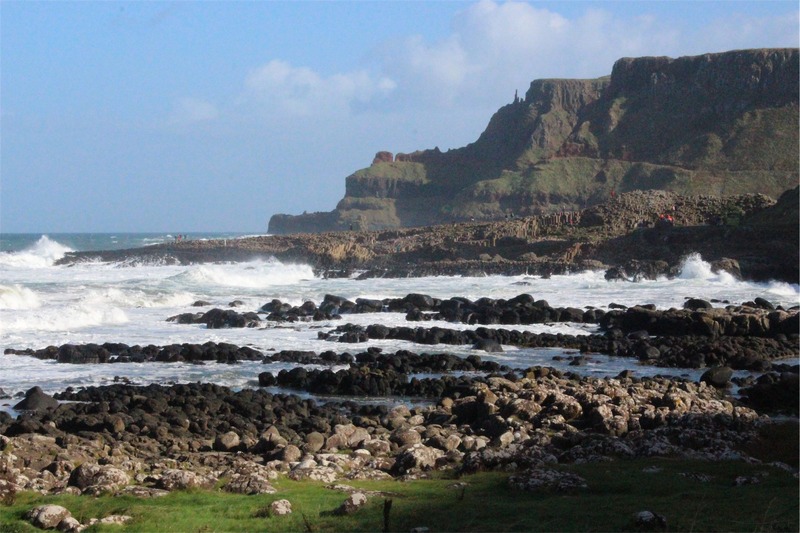 We had to stop a number of times to enjoy the scenery and take photos before reaching the Giant’s Causeway. 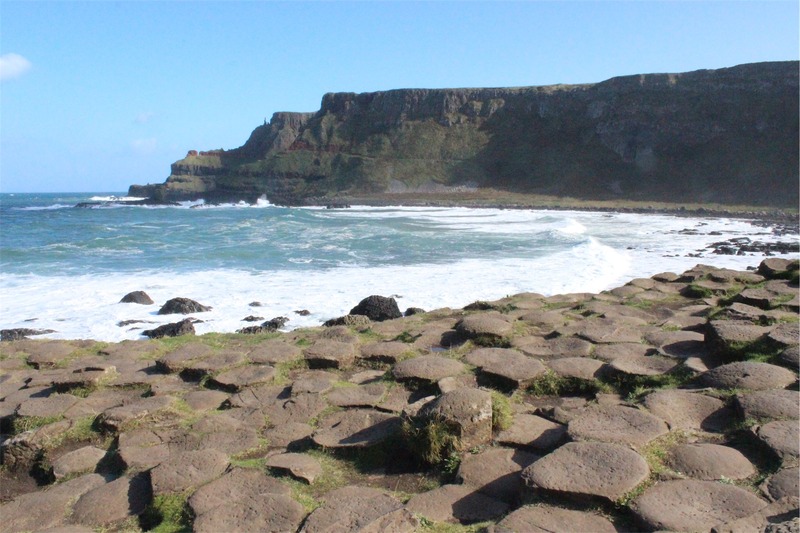 The Giants Causeway is a Unesco listed heritage site that is a result of intense volcanic and geological activity. 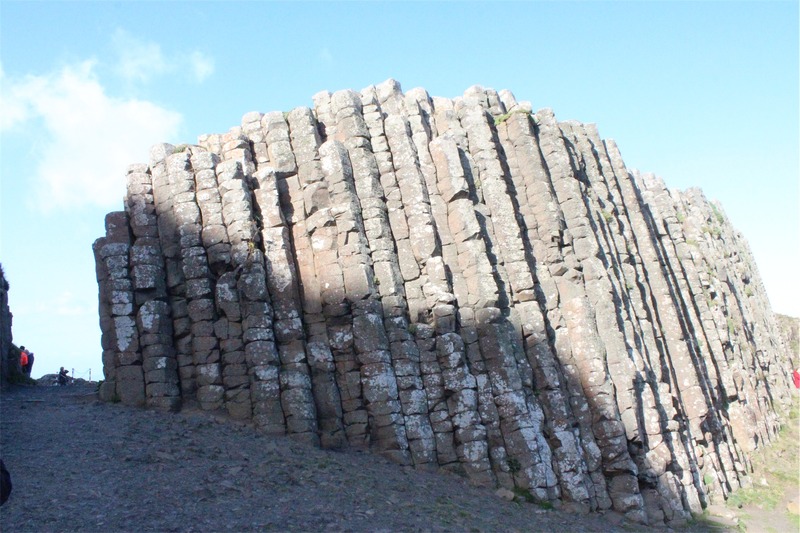 It is believed that the causeway is a 60 million year old legacy to the cooling and shrinking of successive lava flows. 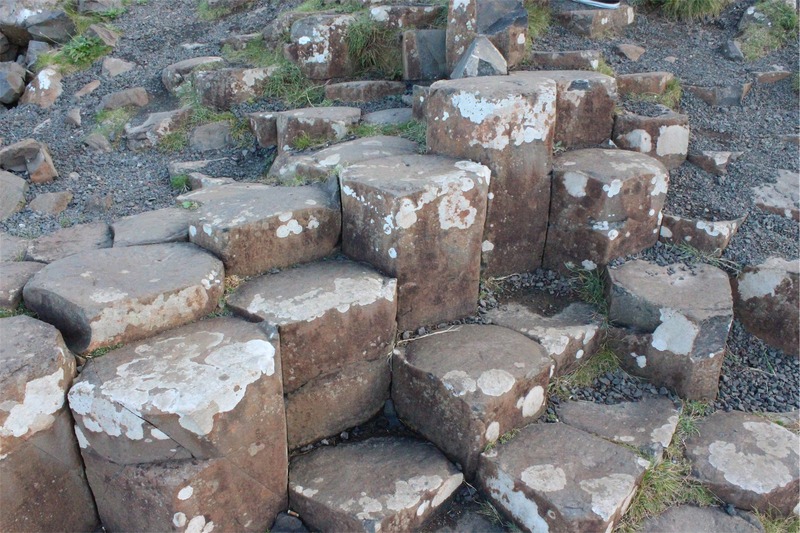 Or it could be that the mighty giant, Finn McCool, wanted to build a way to get to Scotland to have a ‘discussion’ with the giant Benandonner in Scotland who was taunting him. 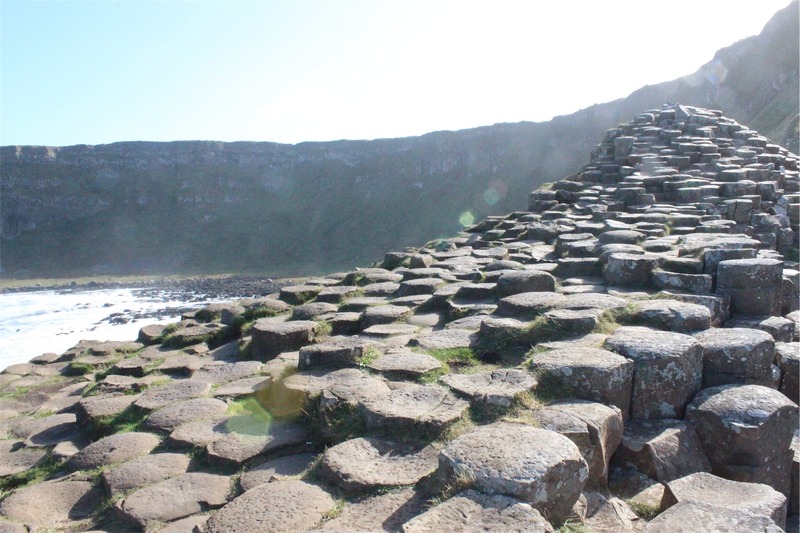 Regardless of science or legend, the Causeway is mind-blowing and a very unique landscape. 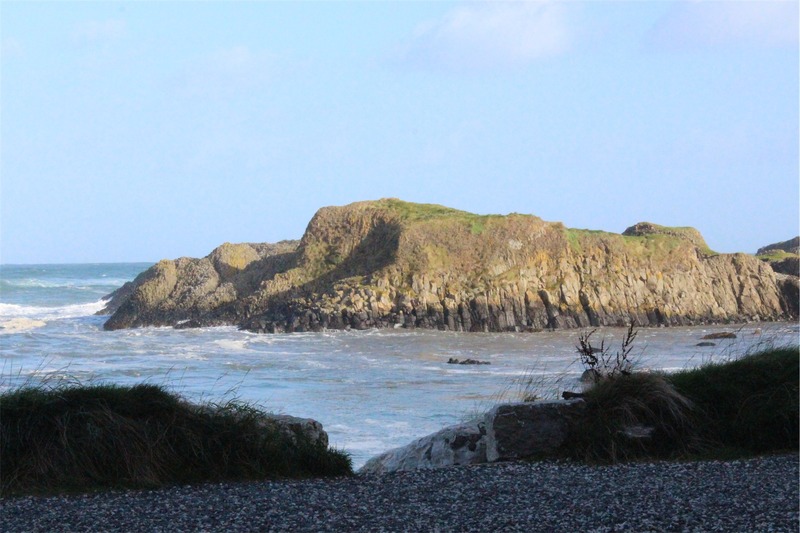 The shapes seem alien, nestled in a spectacular coastal setting. 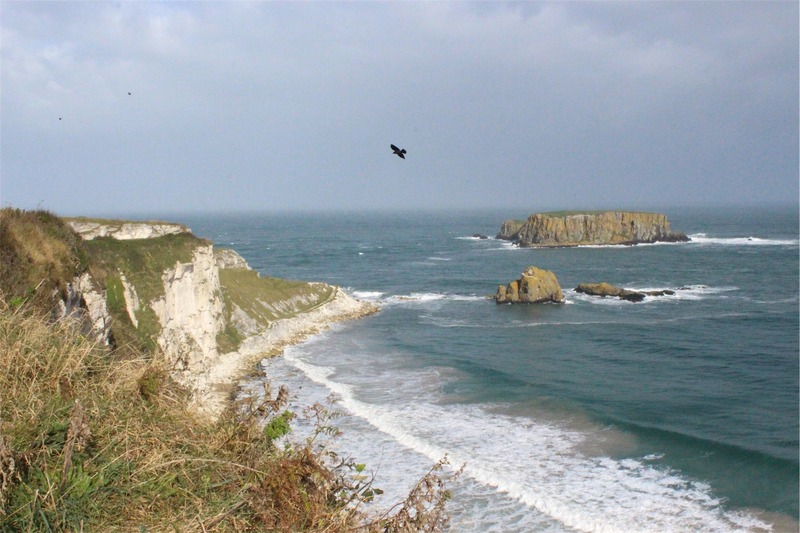 Our experience with the National Trust of UK has been fantastic. Everything was well set out, easy to navigate and well maintained. 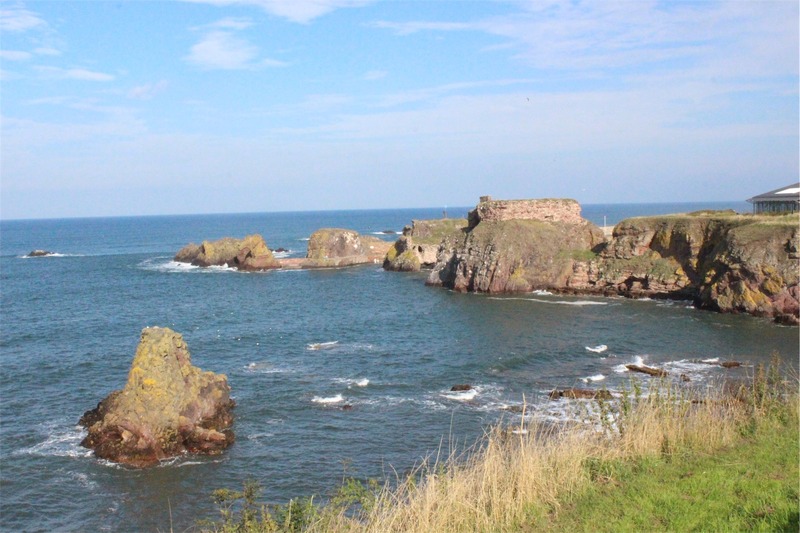 For a 9 pound adult entry fee, we could experience the visitors centre (with exhibits and movies), self-guided tour and shuttle bus to the causeway itself. 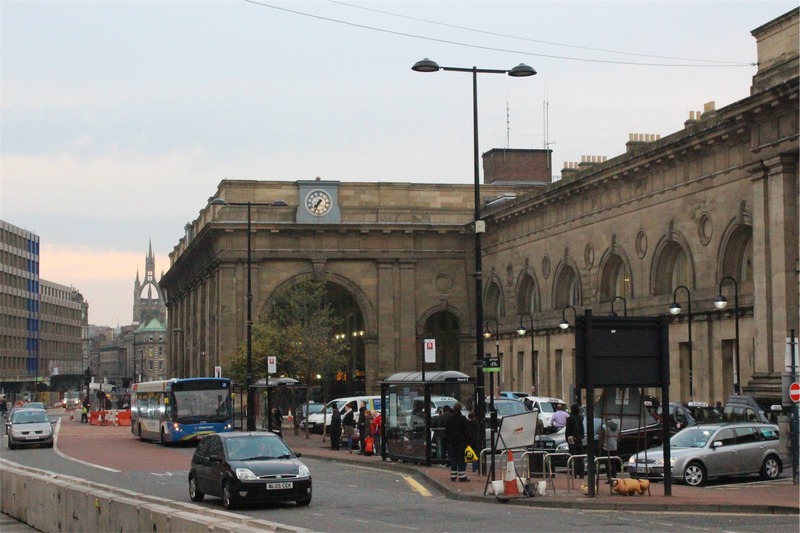 The shuttle bus saves time, but it is a great walk. We enjoyed the walk down and the bus back up the hill. 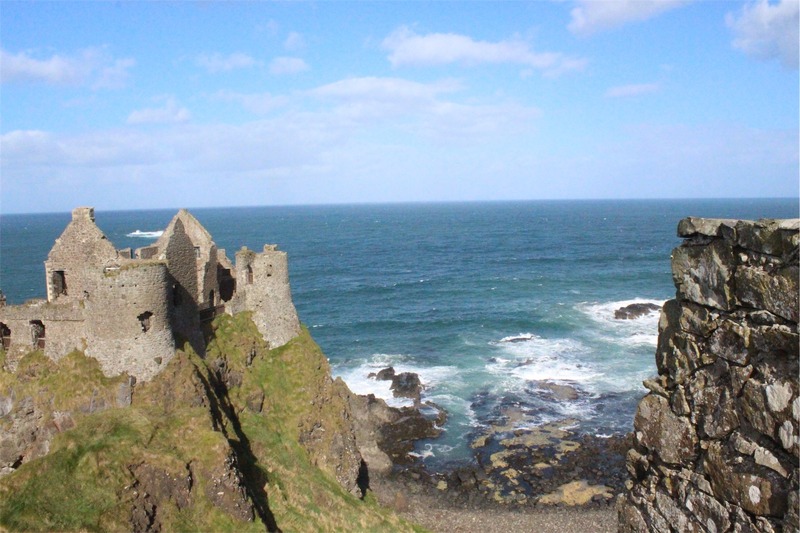 After leaving, we headed west towards Dunluce Castle to see more amazing landscapes. 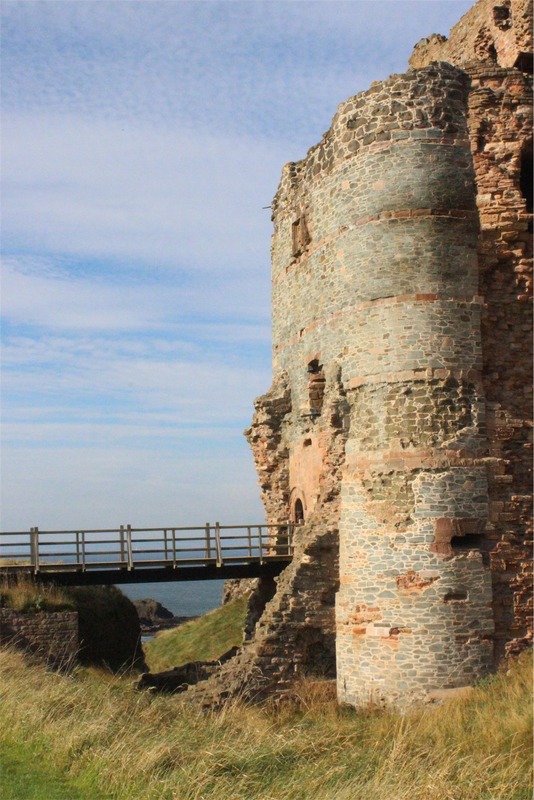 The castle traces back to the 13th century but is now mostly in ruins. 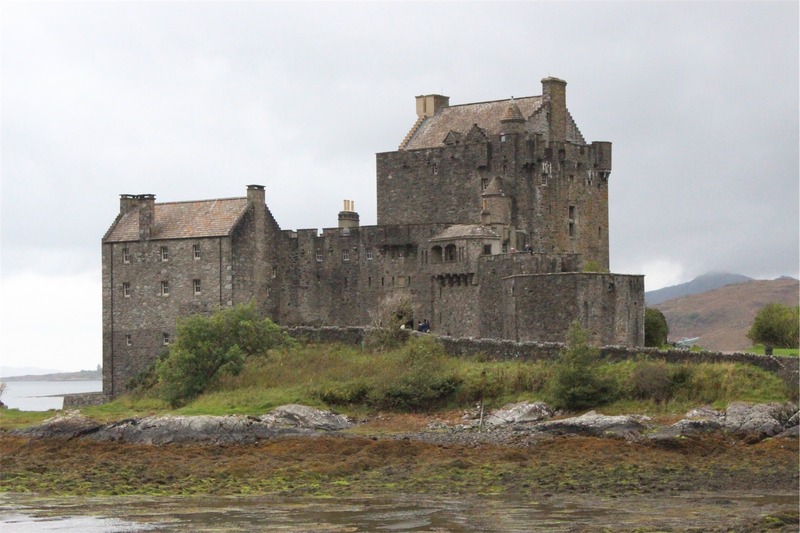 It features in Game of Thrones as castle for the House of Greyjoy, though almost unrecognisable due to CGI enhancement. 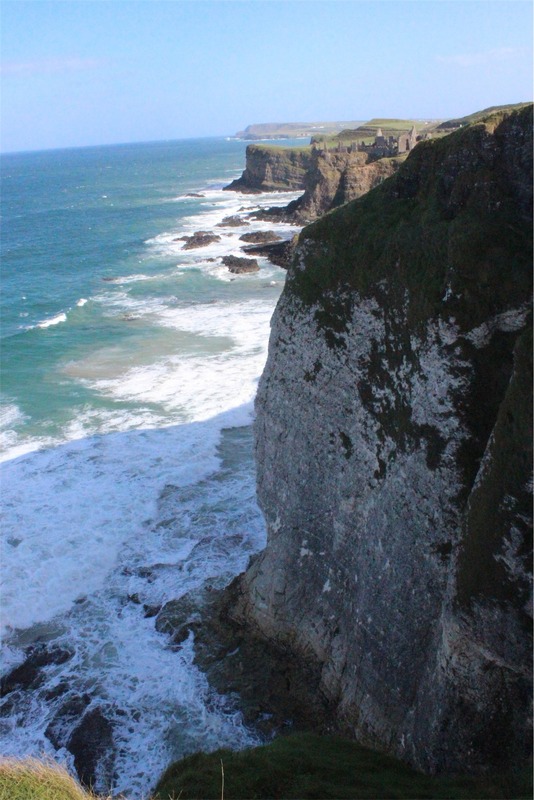 Stretching along the coast from Dunluce Castle are the unique limestone cliffs of the White Rocks. 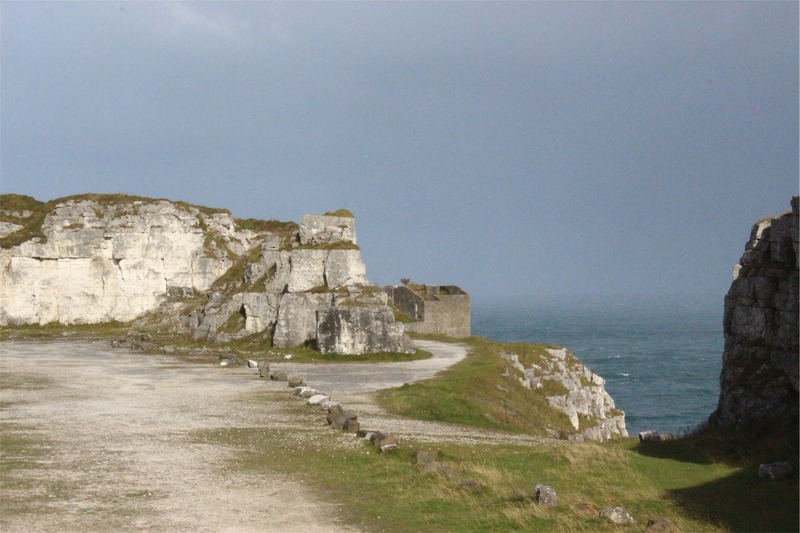 These soft sedimentary rocks have been carved through centuries into a labyrinth of caves and arches. 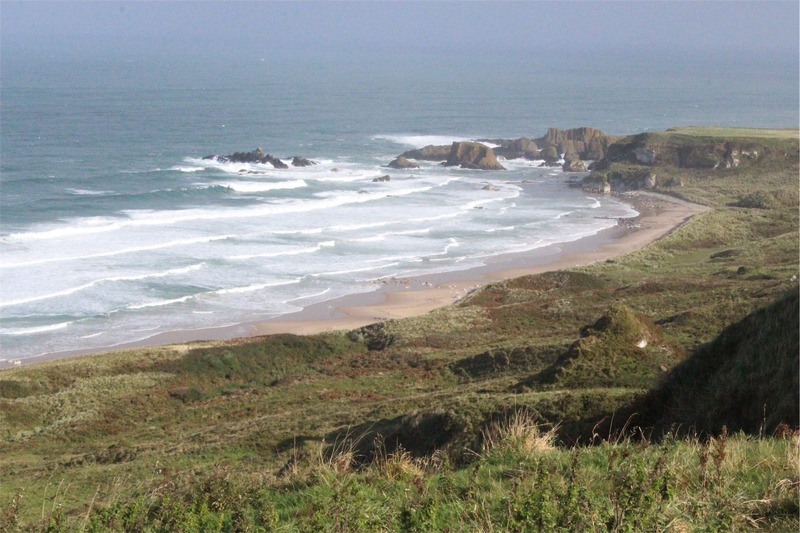 We found a small car park at a lookout on the coast and decided to have our lunch there. 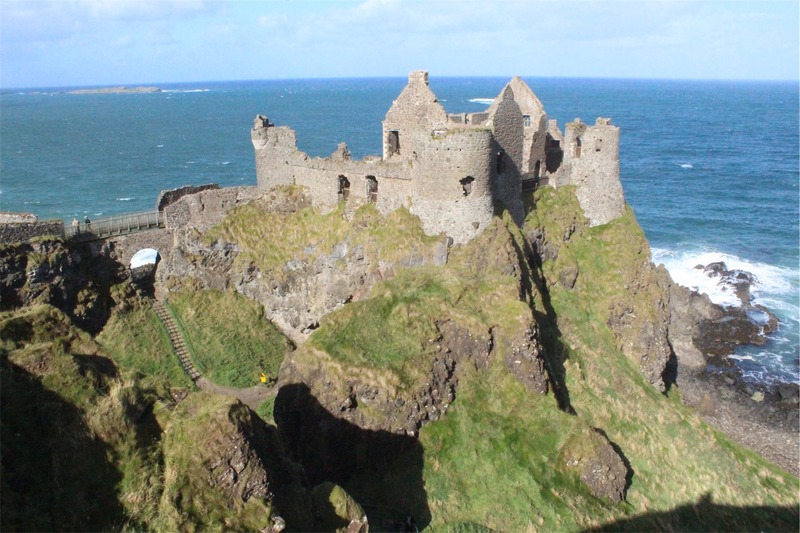 We were pleasantly surprised to find that we were able to get glimpses back towards Dunluce Castle. 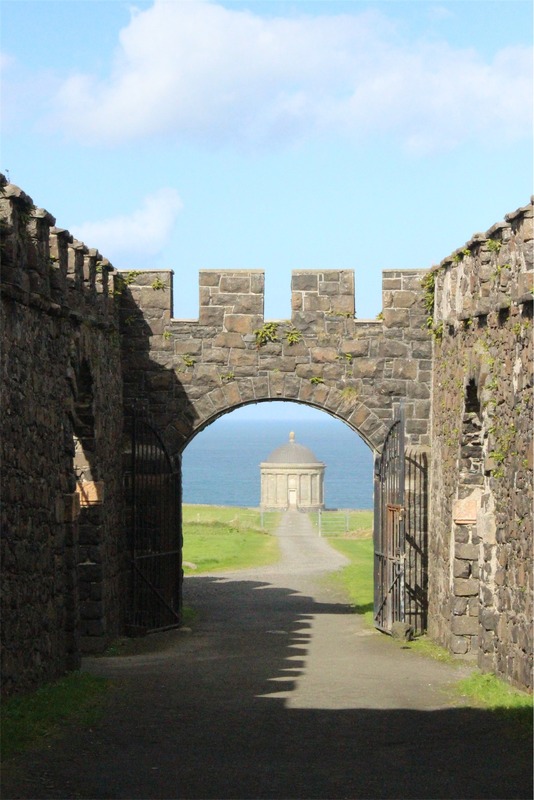 Our next stop on the itinerary was Downhill Demesne, Hezlett House and the Mussenden Temple. 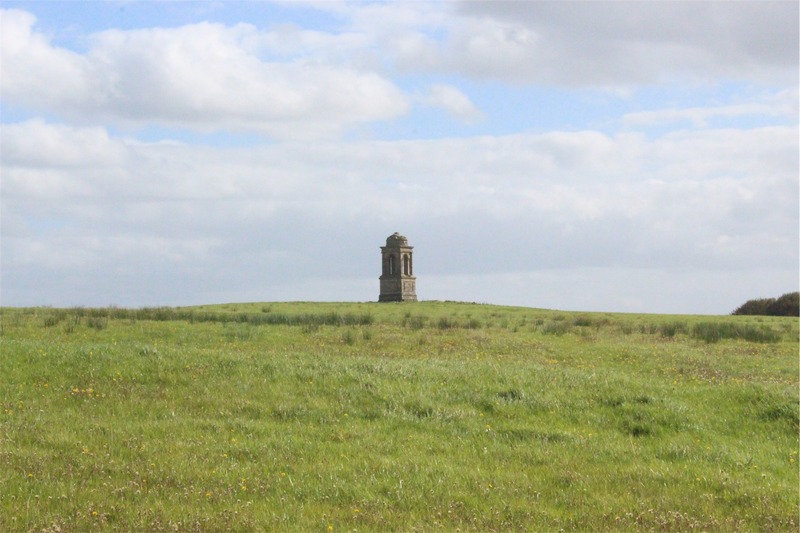 They’re all located on an immense grassy field with the house the crowning point and the temple perched on the edge of a 120 foot high cliff. 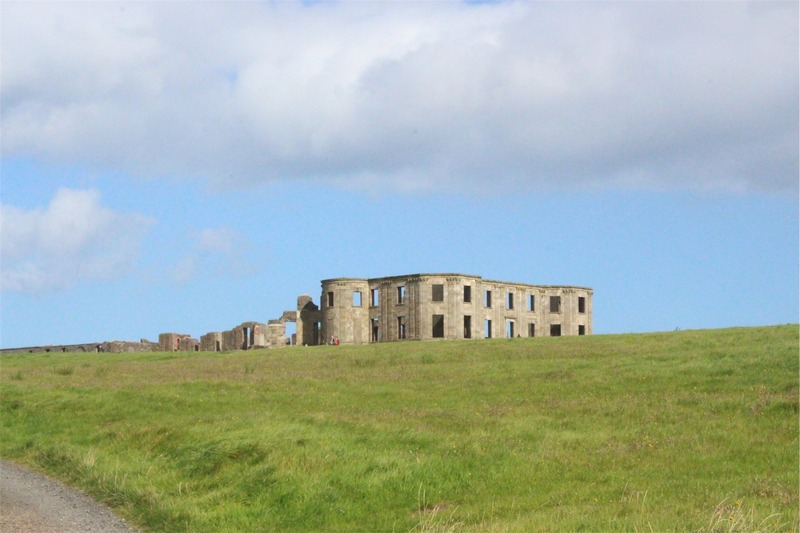 The house was a marvel of design and architecture until destroyed by fire around 1850. 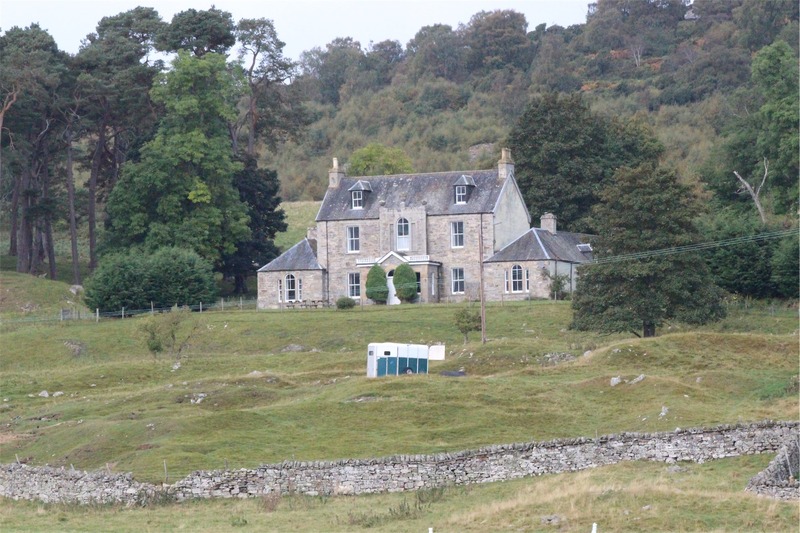 It currently sits a gutted facade, grass as its carpet and sheep living in the servants quarters. 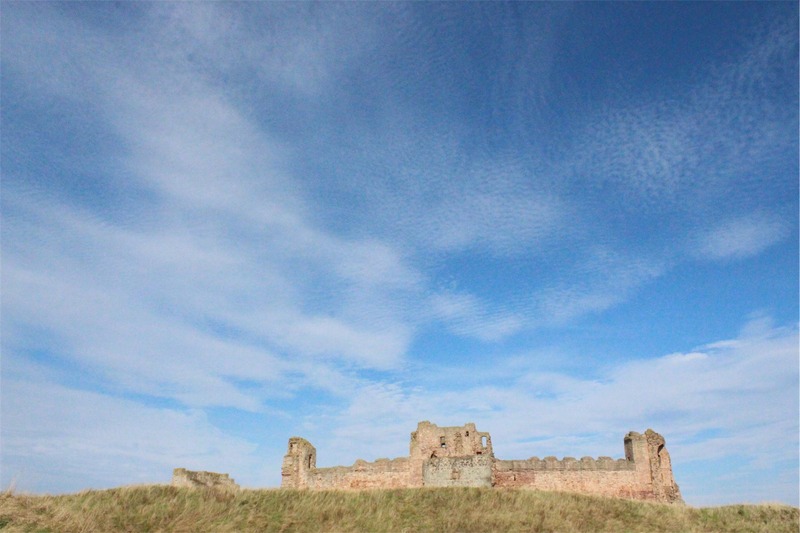 The bright green, sky blue and fluffy white clouds made for fantastic photos. Entry was free, the area was well maintained and you could easily roam through the gardens all day. 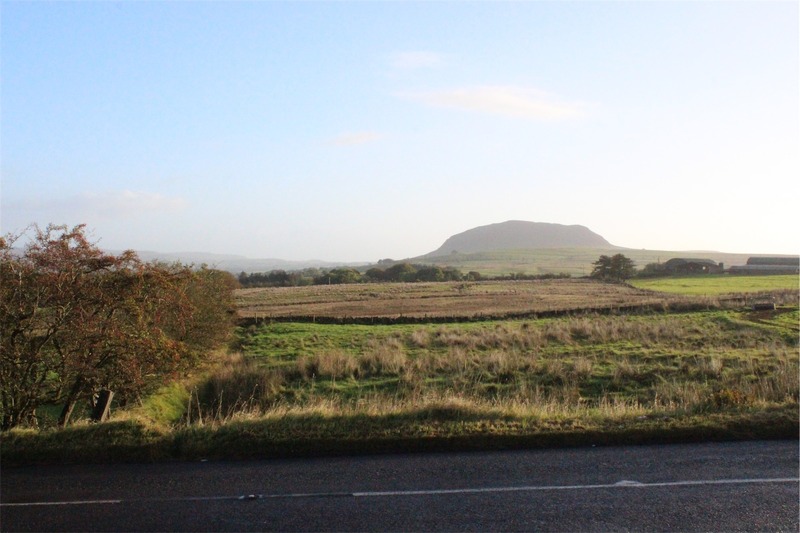 Thirty minutes outside Sligo, our final destination for the night, we spotted Benbulbin. 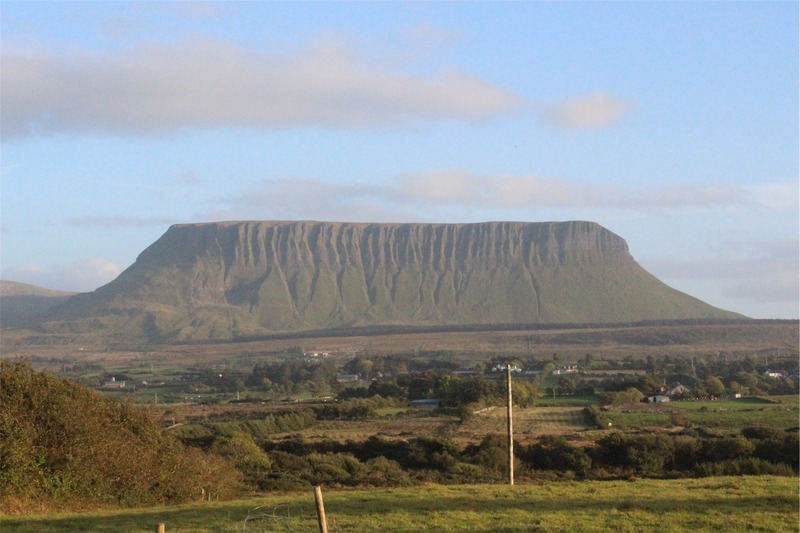 Benbulbin was shaped during the ice age, when Ireland was under glaciers. 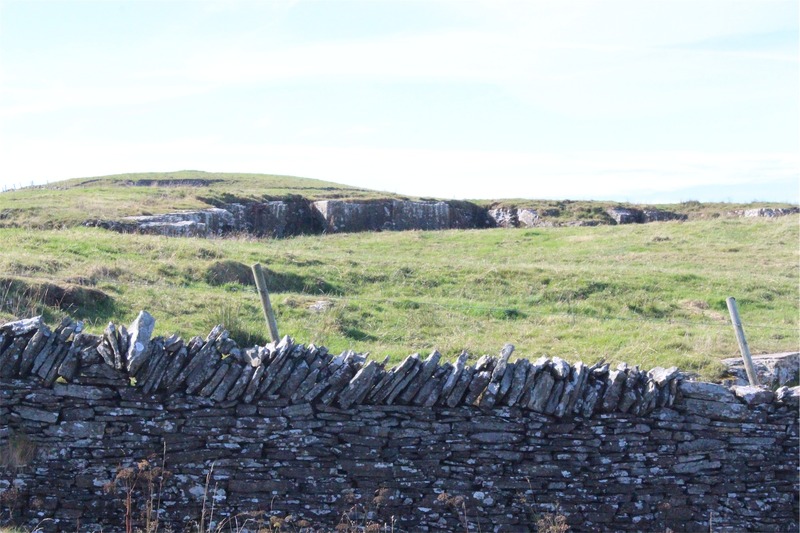 Originally it was a large plateau. 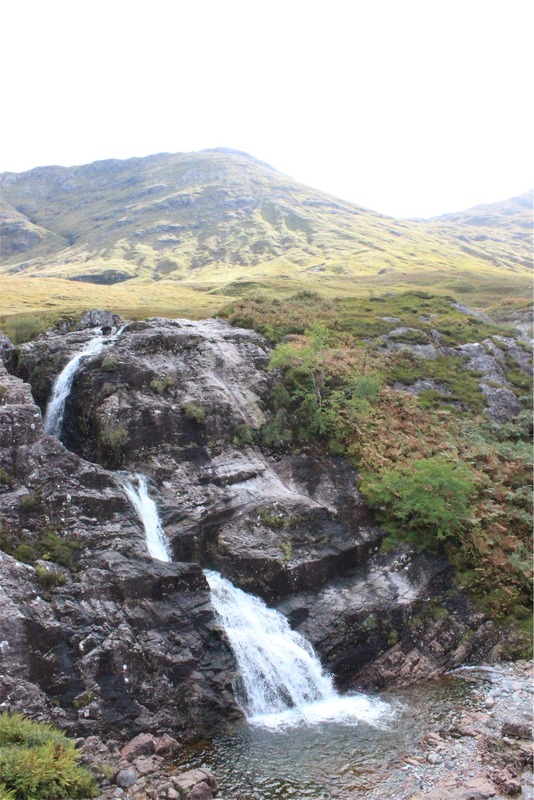 Glaciers moving from the northeast to southwest shaped it into its present distinct formation. 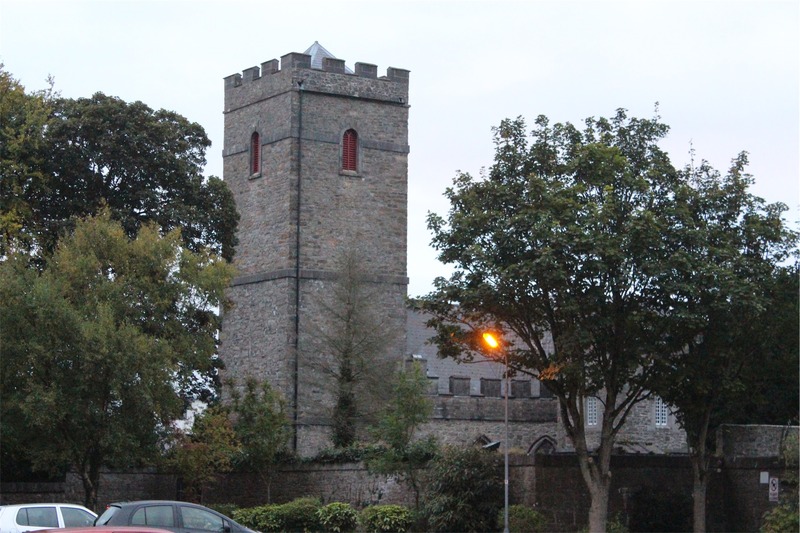 Just before we reached Sligo, we saw St Columba’s Church of Ireland in Drumcliff the location of W.B. 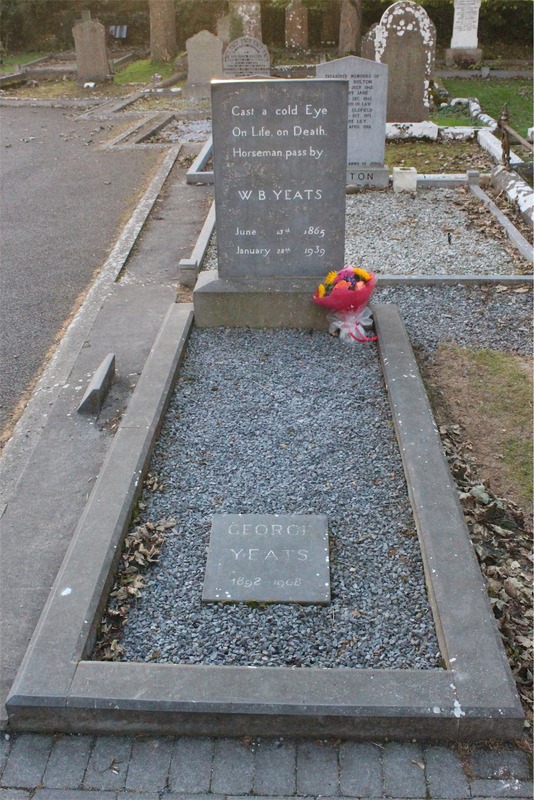 Yeats grave. 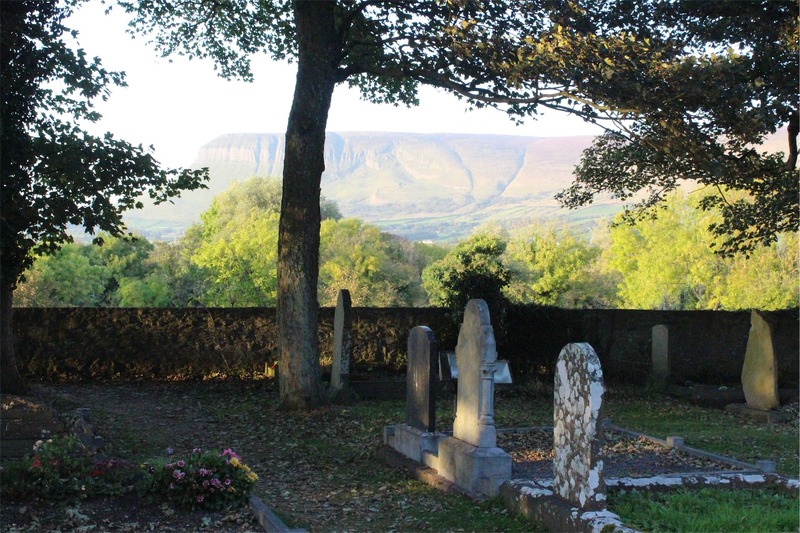 There is still contention regarding the authenticity of Yeats’ remains, initially scattered in an ossuary in France in 1946 before being repatriated by his wife back to Ireland. 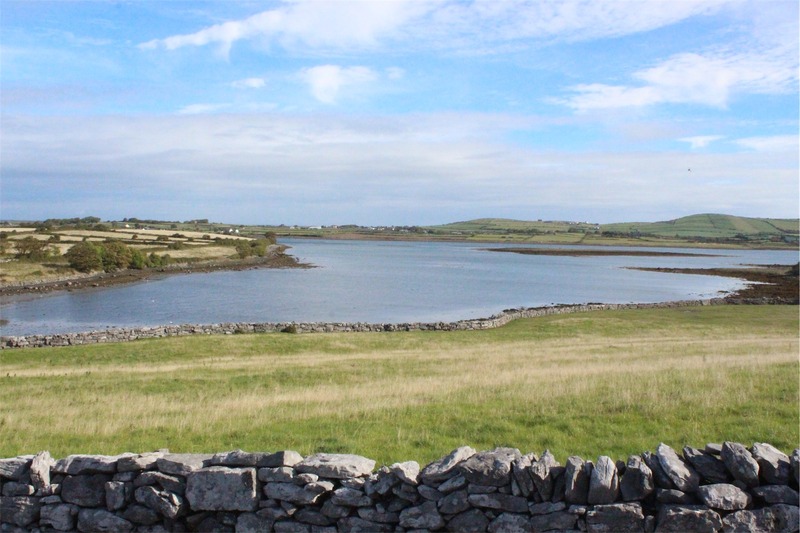 Finally we reached Sligo, checked into our hotel and had dinner at the restaurant on site. We retired early, exhausted after a long day with the promise of another huge day of beautiful scenery ahead of us. 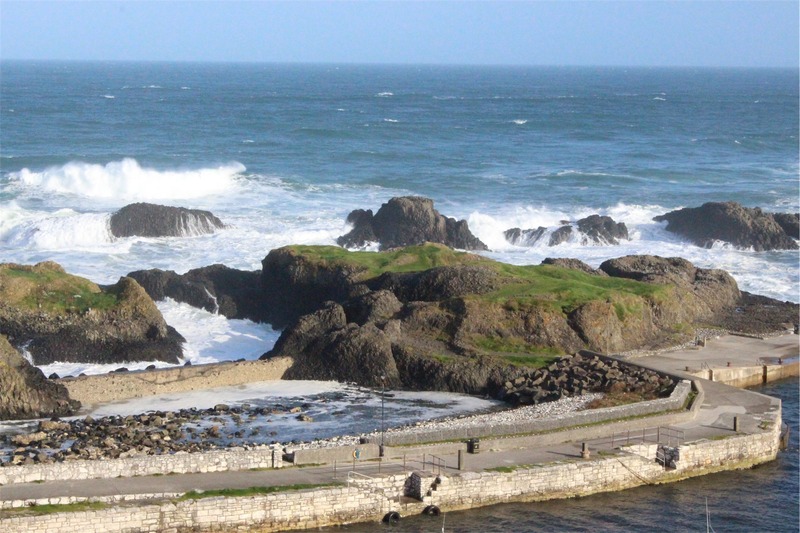 For the Ireland leg of our journey, we had to catch a ferry from Scotland to Belfast. 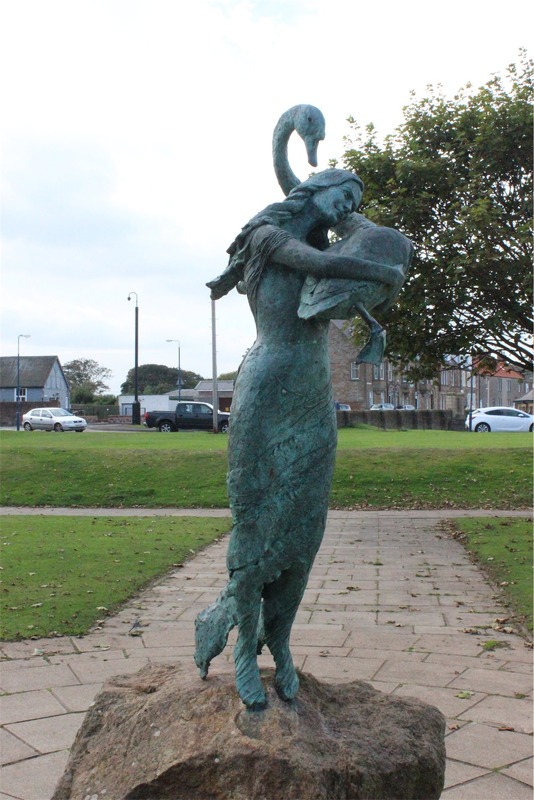 We arrived at the ferry terminal in Troon (Scotland) early and found a place to have some breakfast. We drove onto the ferry and once the car had been locked up below, we made ourselves comfortable in the lounge for the trip. It was looking like a grey drizzly day however, the ferry trip was very quick, arriving in Larne (Northern Ireland) just two hours later and before we knew it we were instructed to make our way to our vehicles. 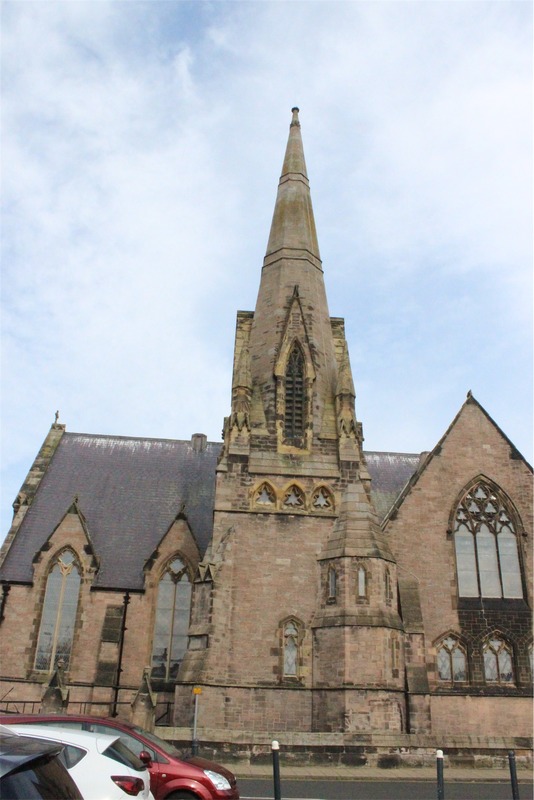 We were impressed by how organised the whole process was, quick, efficient and very well managed. 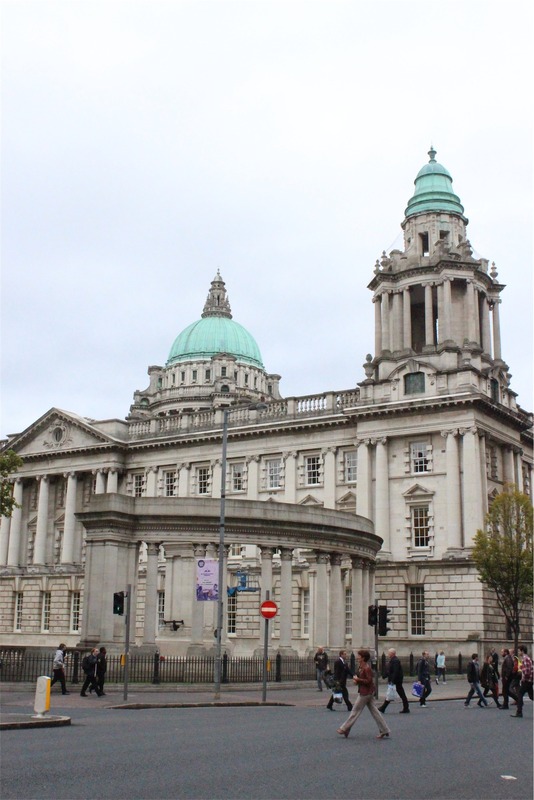 It took an hour from the ferry terminal to arrive in Belfast. 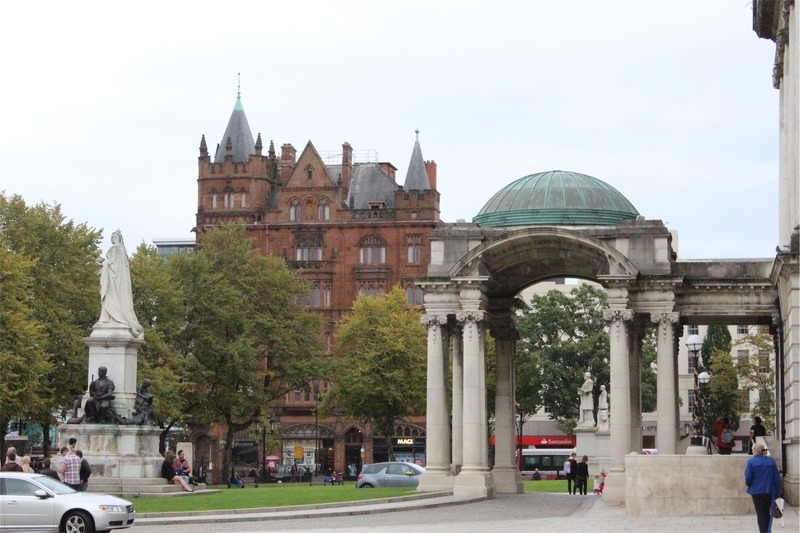 We checked into our hotel, which was quite central and once settled we planned our walking itinerary for the day. The walk ended up being huge covering a large part of the city. 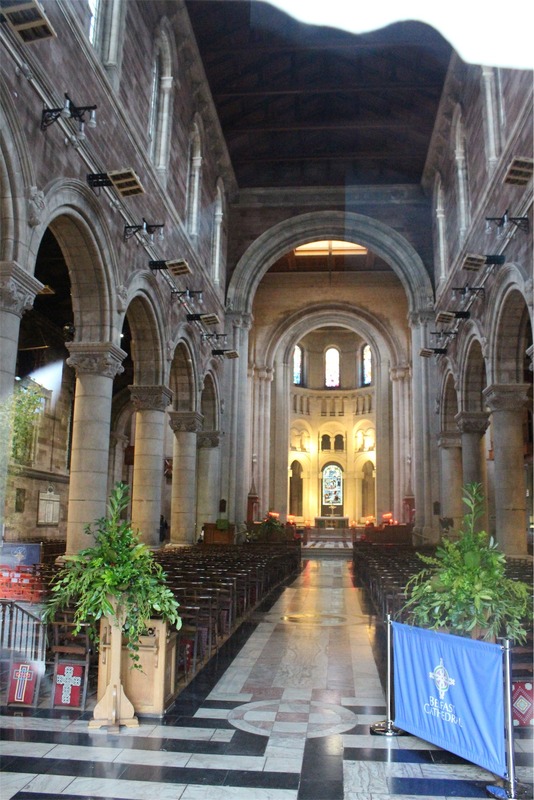 We loved the old buildings, so much history and character in a small space. 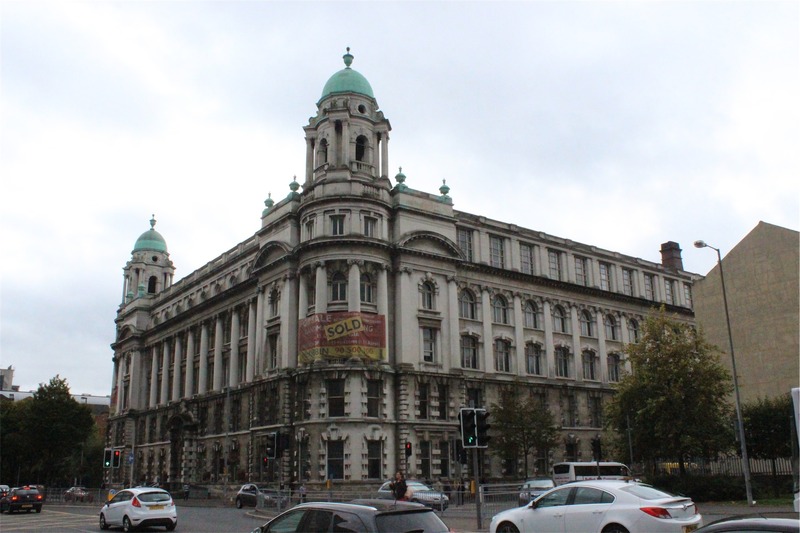 A building on College Square. 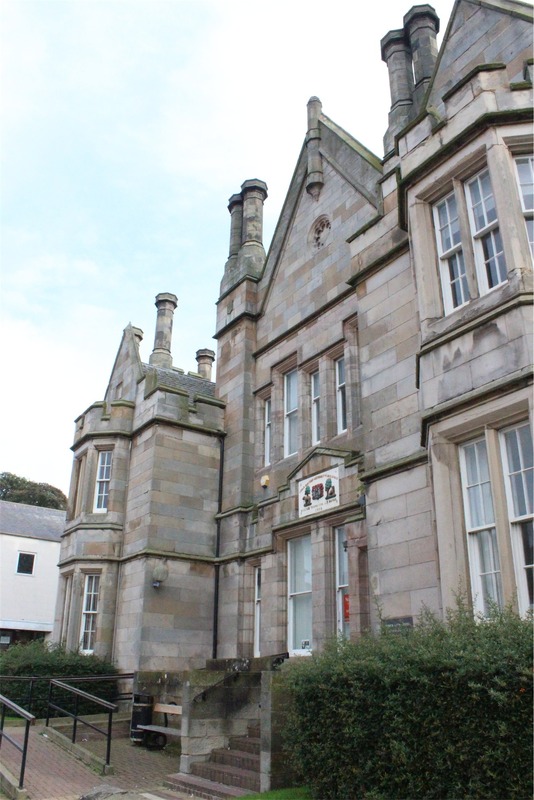 Assembly Buildings Conference Centre was built in 1905 as the headquarters of the Presbyterian Church in Ireland. 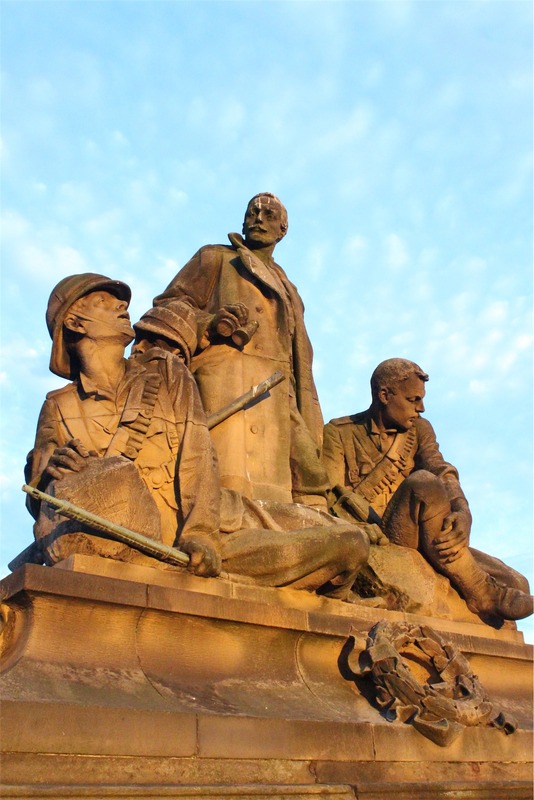 City Hall and City Hall’s Garden of Remembrance. After 82 days of walking, Bec’s Converse finally had to be retired. So we did some retail therapy in the main shopping mall and grabbed some replacements. We headed back to the hotel, dropped of our shopping and made our way to the conveniently located pub across the road for dinner. After enjoying a lovely breakfast with our host, we took in the scenery at the front door. 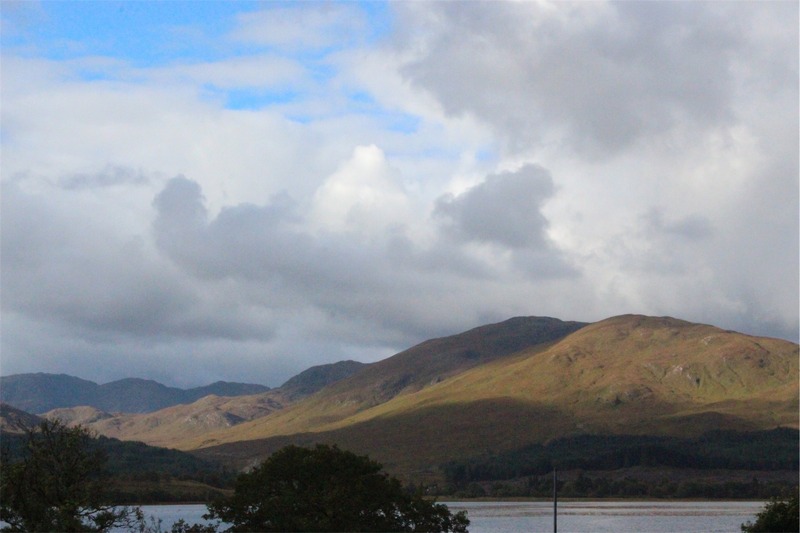 Our BnB was across the road from the loch and the first photo below was the view from our bedroom window. 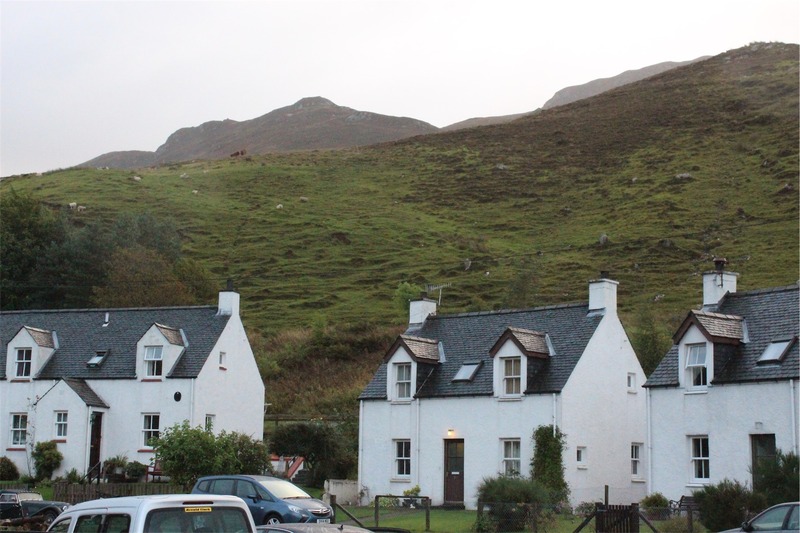 The second photo is the BnB in Dornie that we stayed in. 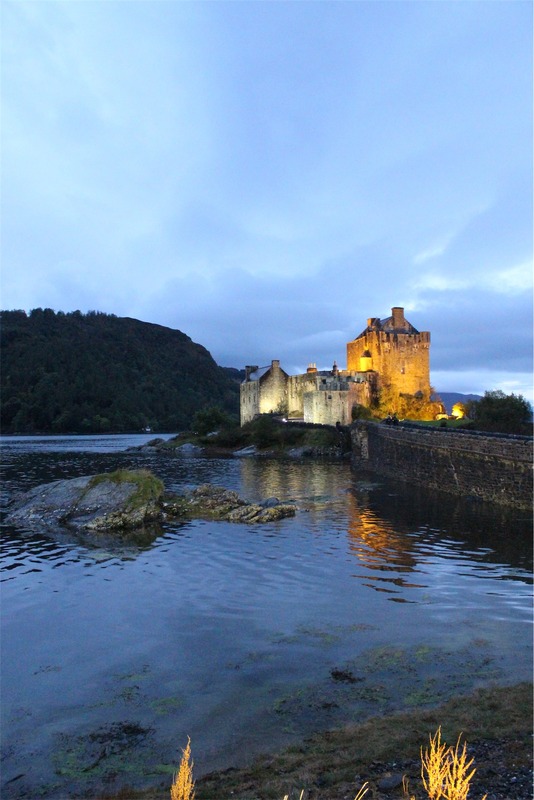 To get to our next destination, Glenfinnan, we had to drive past Eilean Donan. Since we were in the area, we thought we might stop and take another thousand photos. 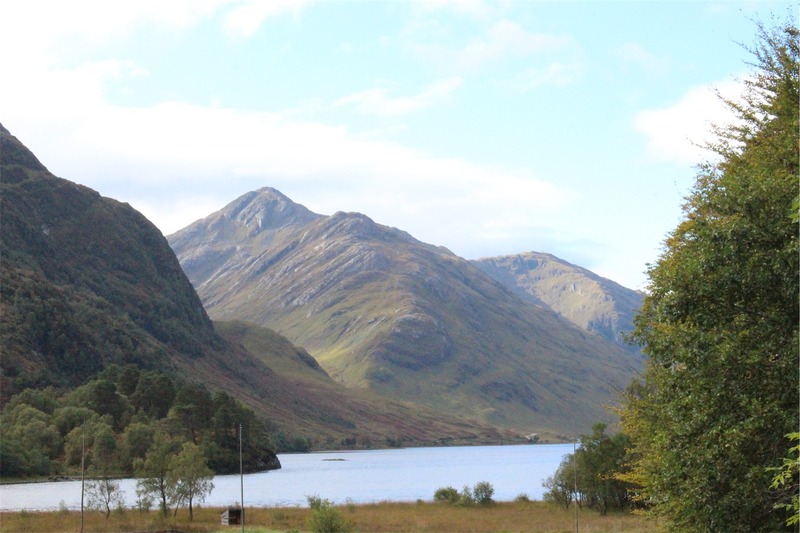 The scenery between Dornie and Glenfinnan was incredible – different to what we had seen so far in Scotland, but no less beautiful. 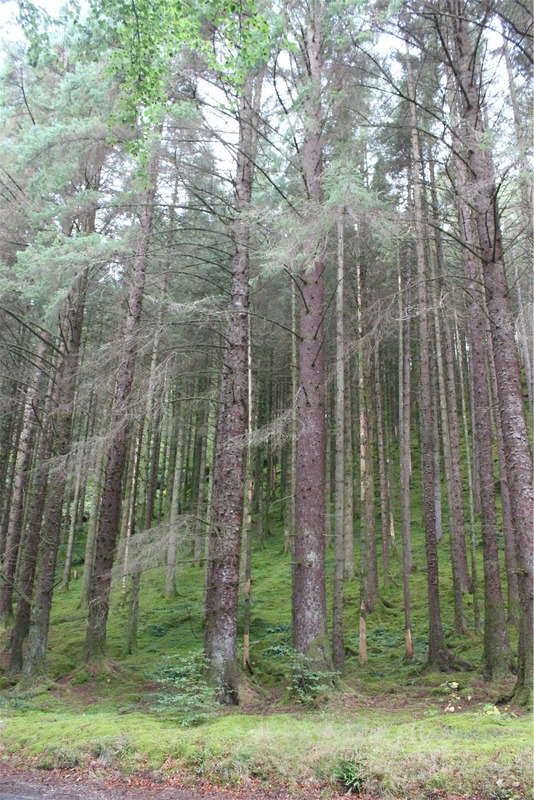 We even found a secret clearing in a forest on the side of the road in the area of Loch Eil. It was magical. We stopped and had a cup of tea and took lots of photos. 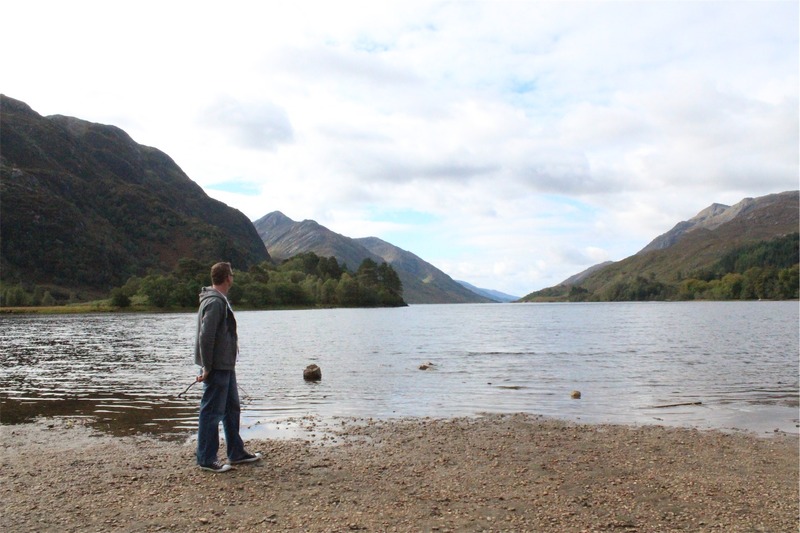 Keith wanted to see the village of Glenfinnan and stand on the shores of Loch Shiel. 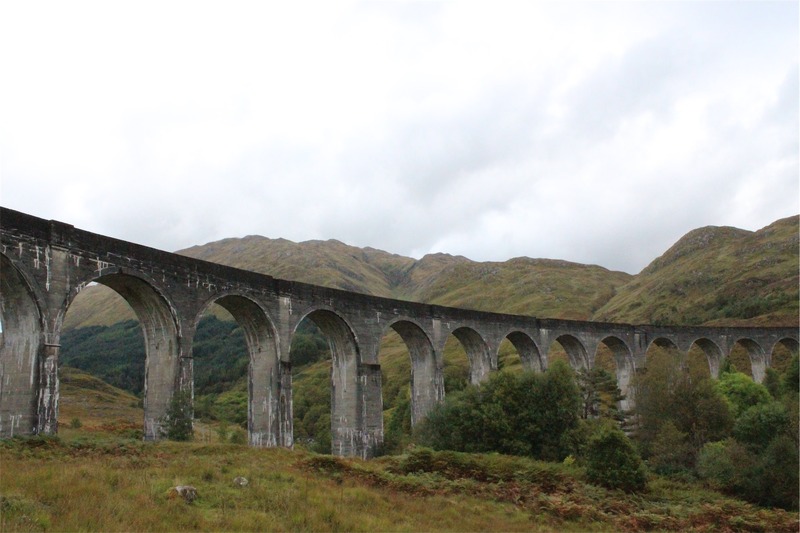 When Bec found out that it was also home to the Glenfinnan Viaduct – famous for scenes in Harry Potter involving the Hogwarts Express train – we HAD to go there. Sometimes things fall into place. 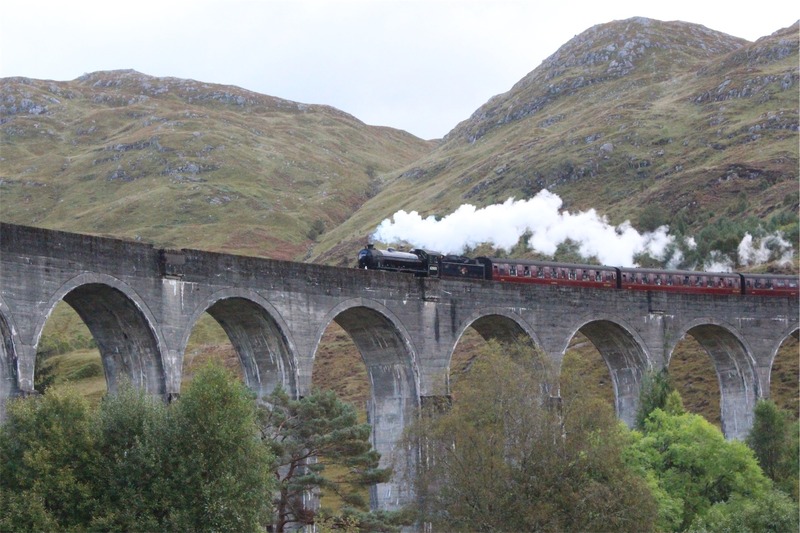 We arrived about fifteen minutes before a daily event – a steam train crossing the viaduct. 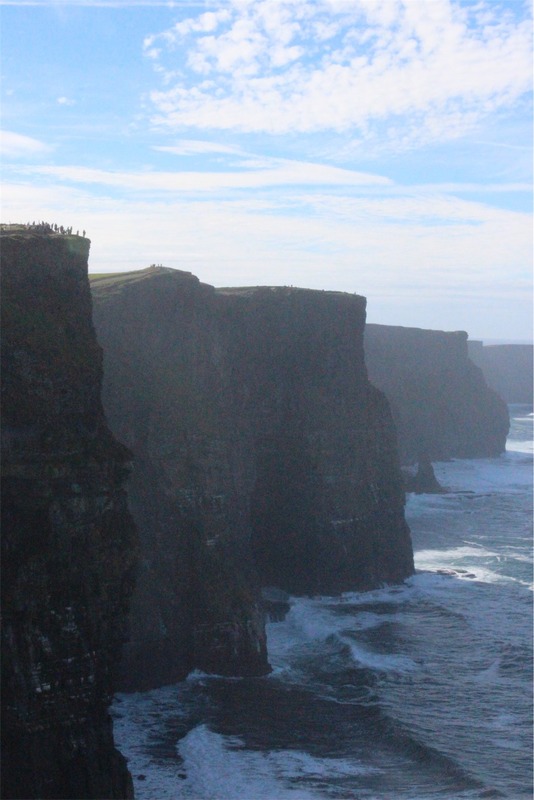 People had come from all over the world specifically to see this and we happened to be there at the right time. It was surreal. Keith took lots of photos and Bec shed a little tear in happiness. 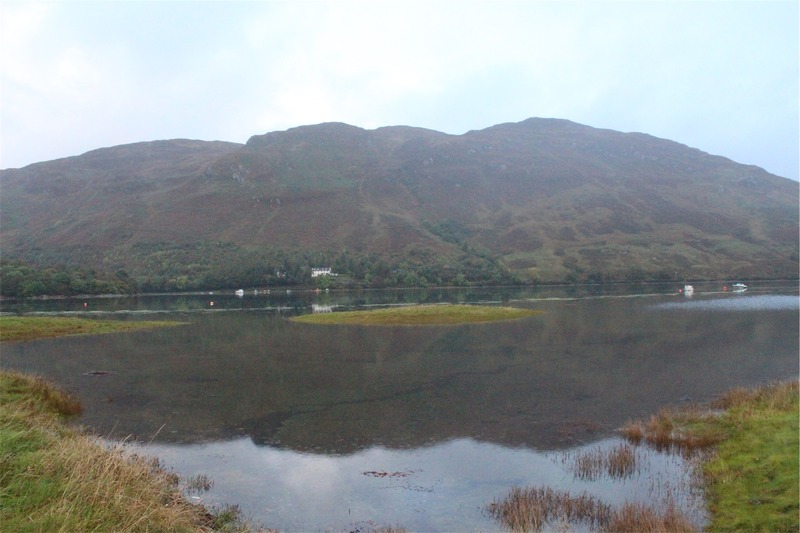 Ten minutes walk away from the viaduct was Loch Shiel. 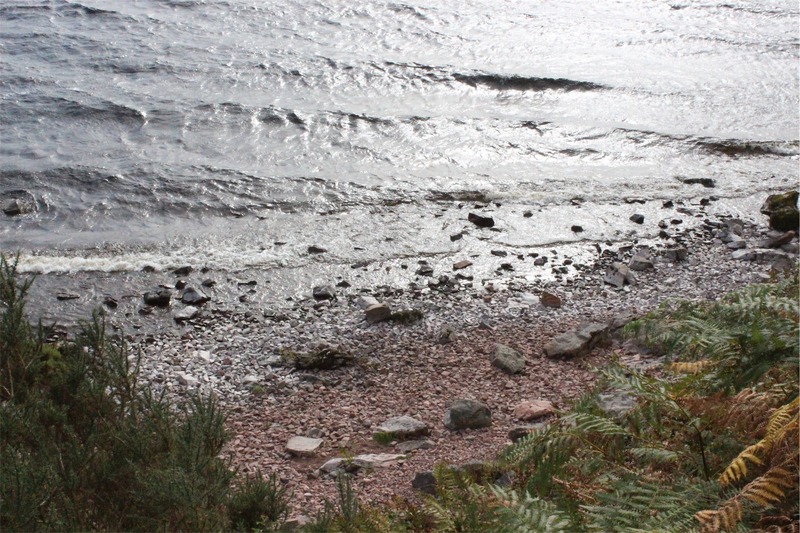 Keith got his chance to stand on the shore. 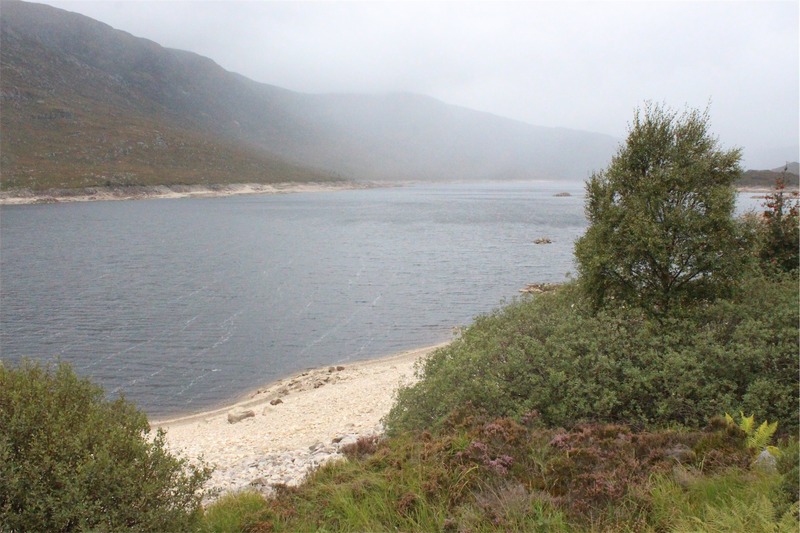 While standing on the shore of Loch Shiel, the bleak grey day gave way to a stunning blue sky. 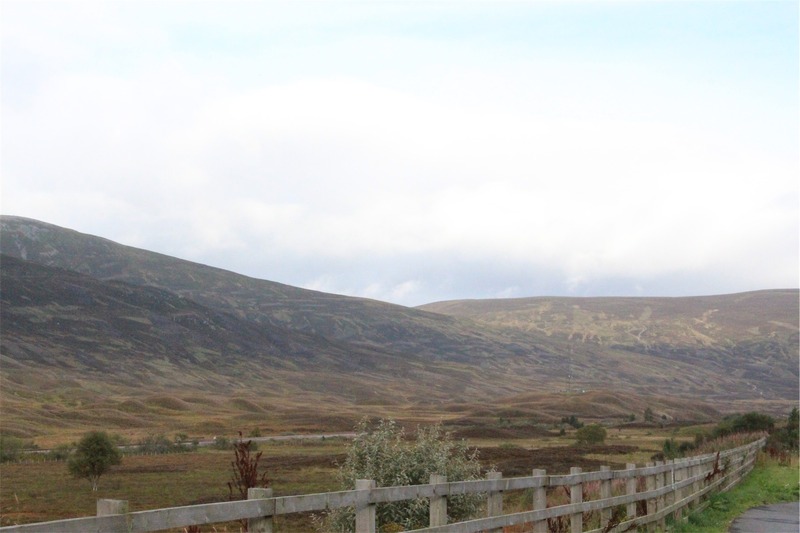 The landscapes on our drive to Glasgow were nothing short of amazing. Today was one of our favourite days, but also one of the longest. 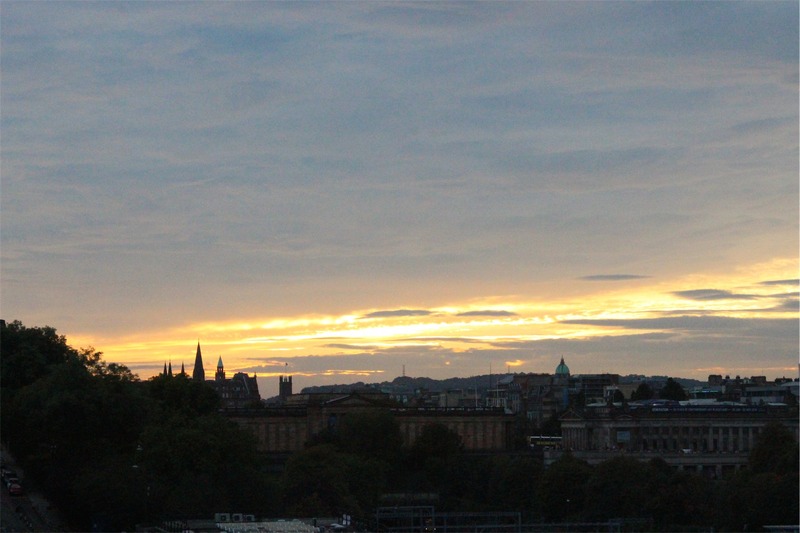 We reached Glasgow just as night fell (around 7:30pm). We checked in, had some dinner, wrote a blog post and planned the next day. 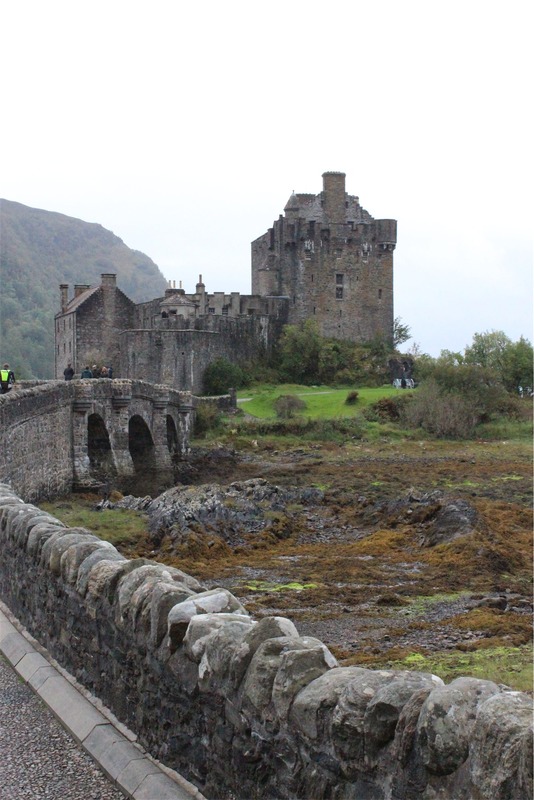 Fortunately during our trip so far there hadn’t been much on our itinerary that we had missed. 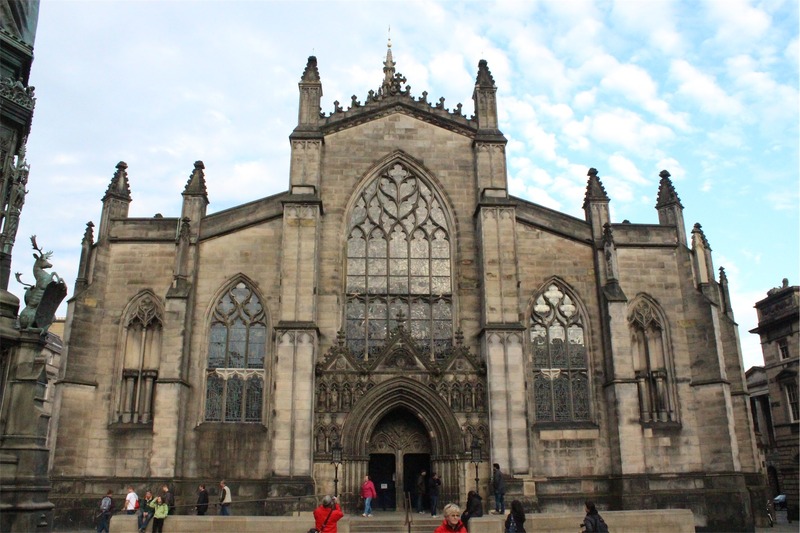 On this occasion time had beaten us and we just didn’t have an opportunity to explore Glasgow. 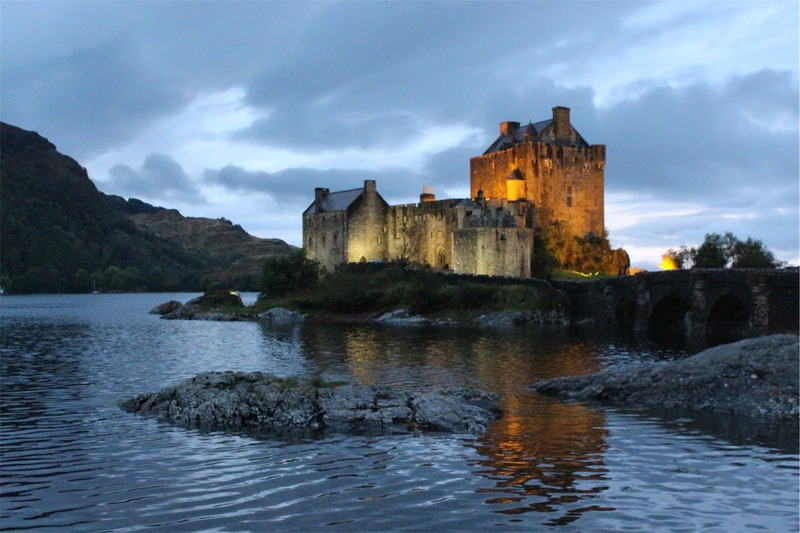 Definitely one for the list of places to see when we come back to the UK. 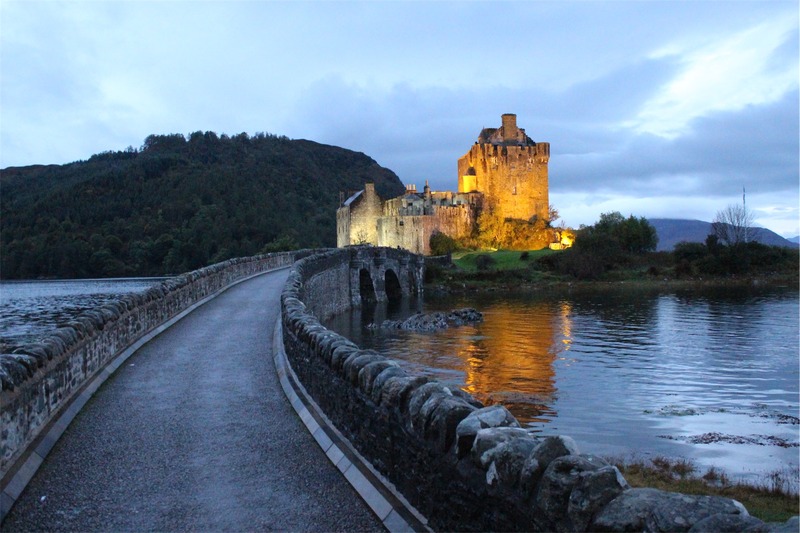 We had about six hours of driving today to reach our final destination of Dornie, however, we were really excited about exploring some of the best scenery in Scotland. 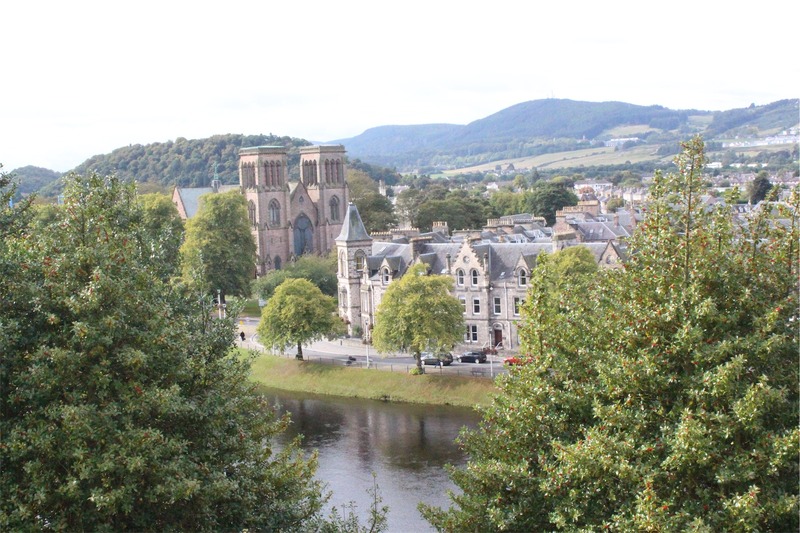 After leaving Edinburgh we made our way North past Perth through Killiecrankie and into the Cairngorms National Park with our first stop being at Inverness. 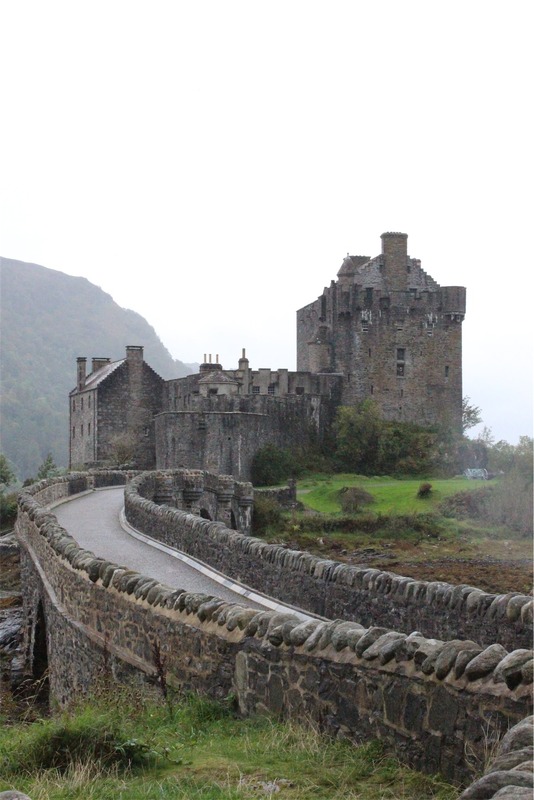 The scenery was constantly changing between dense woods and hidden castles to sparse rolling mountains covered in fog and heather. We had to stop every half an hour or so to get more photos. 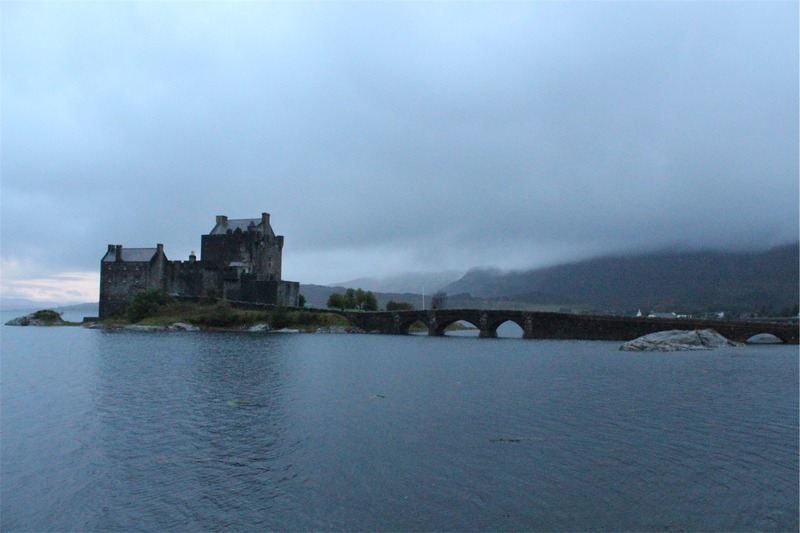 We were starting to feel the change in weather now that we were in the middle of autumn. 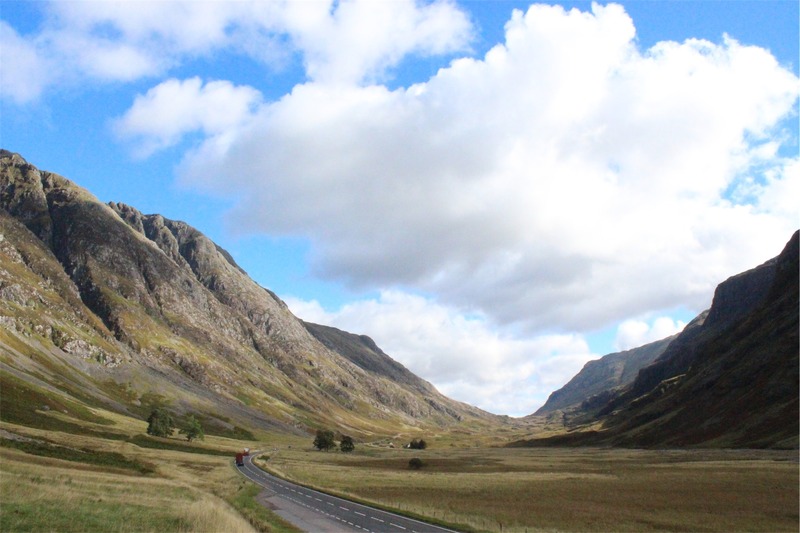 The stops became more frequent as we needed cups of tea to warm up and enjoy the scenery. One of the memorable stops we made was at a random information centre (mostly for the toilet after all those cups of tea). 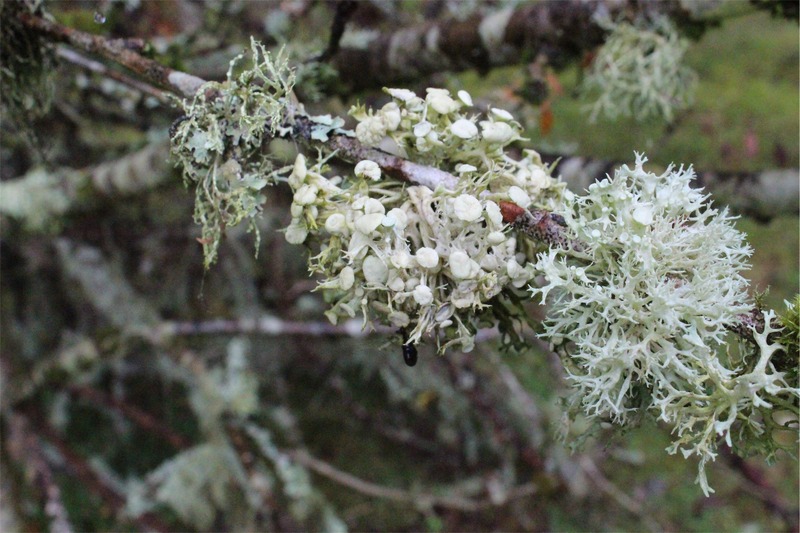 The centre was nestled in the middle of a damp forest that had crazy moss and weird little flowers growing everywhere on tall trees that blocked out the weak sun. 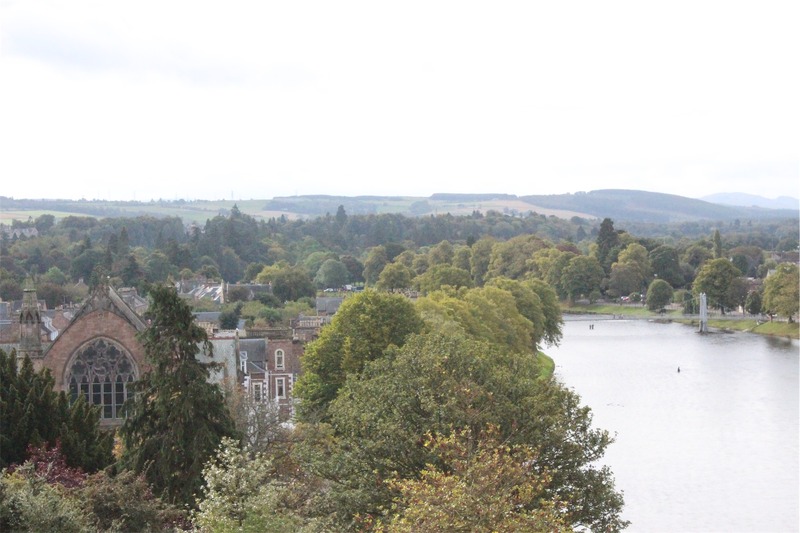 We reached Inverness really keen for breakfast. We found a car park in a shopping centre and headed out to find a cafe. The cafe we found was great, but didn’t have poached eggs on toast to quench Bec’s craving. However, they did have Eggs Benedict…so we introduced them to Aussie humour, ordering Eggs Benedict without the Benedict! 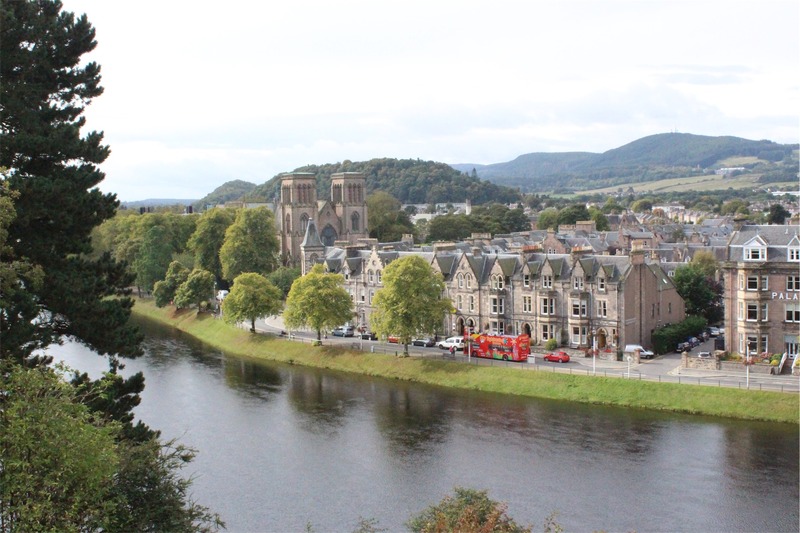 After enjoying breakie, we explored further finding Inverness Castle. 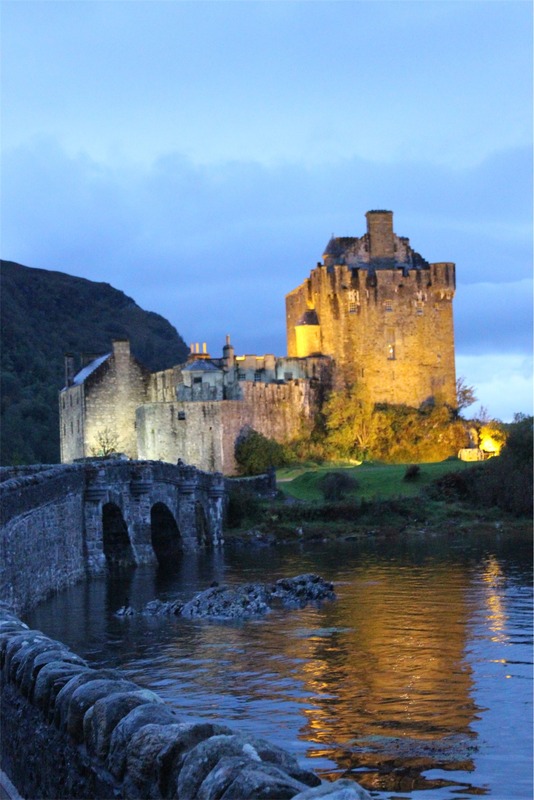 The Castle, of course, is perched on top of the city and has amazing views of the river and the city beyond. 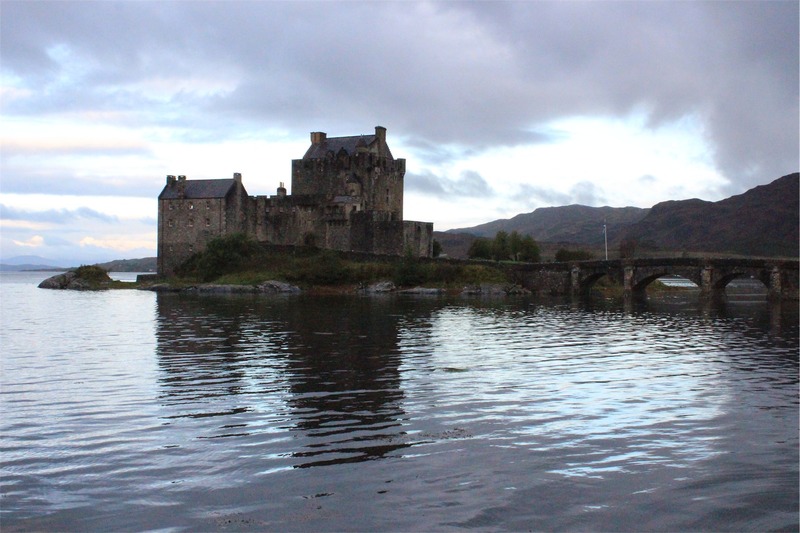 In fact, the strangest thing we realised about the river was that although it was quite wide, it was extremely shallow – there were fishermen in the middle of the river wearing rubber pants! 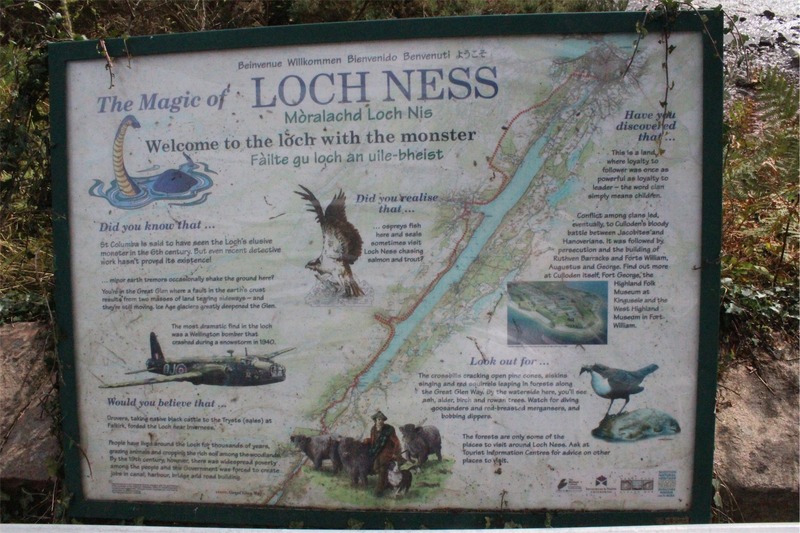 With a full belly and an urge to find sea monsters, we set off for Loch Ness. Every thirty seconds Keith was sure he saw the monster, but then realised it was a false alarm. 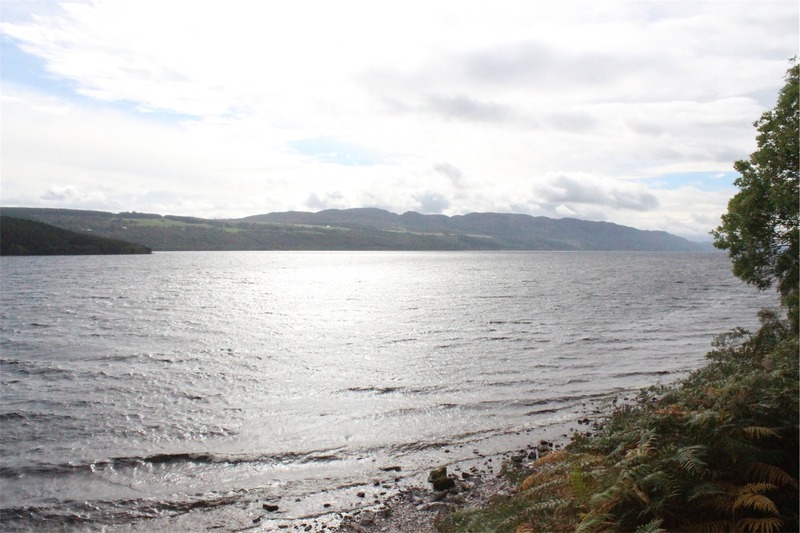 Regardless of the lack of giant sea creatures, Loch Ness was spectacular. We took lots of photos and stopped in at the visitors centre. 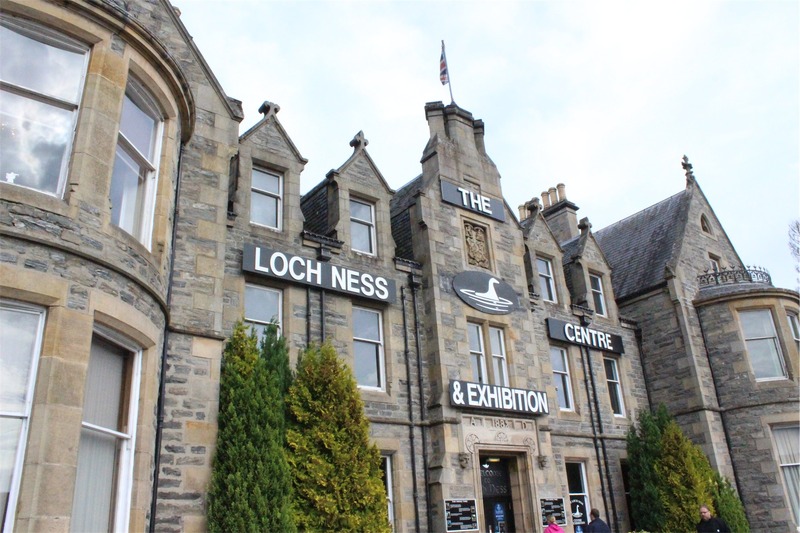 While it was sad that we didn’t see Nessy, it was unbelievable what they wanted to charge us to see an exhibition at the visitors centre – so we sought tea and scones elsewhere. 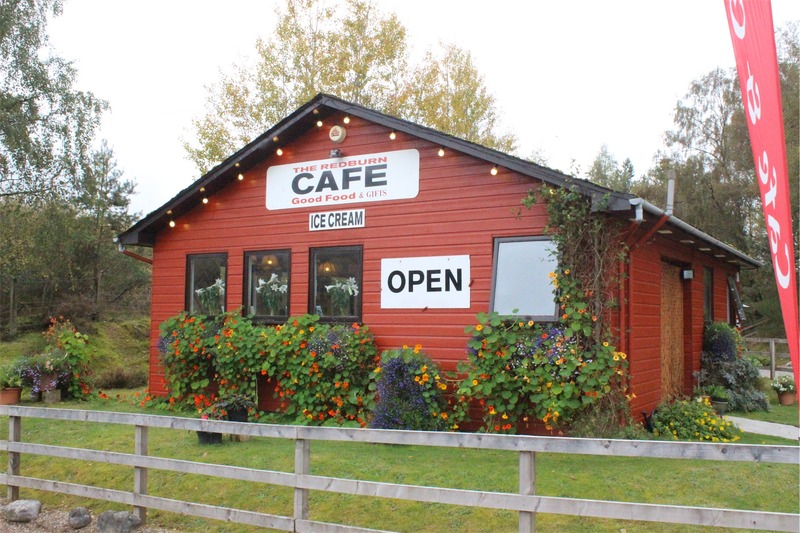 About half an hour away from the Loch Ness Visitors Centre, we found the perfect place for tea and scones – The Redburn Cafe. If you are ever in the area, this should be a must stop on your list. The people that own the Redburn Cafe are lovely and welcoming, everything is home made on site with local produce. 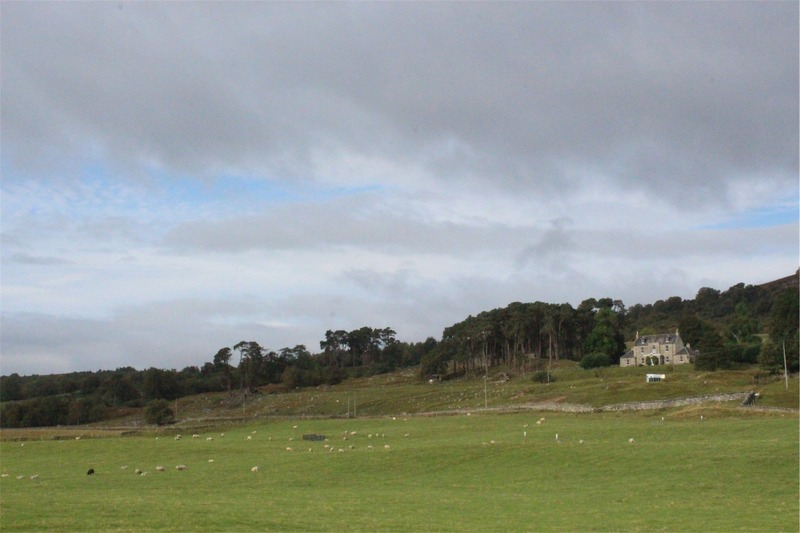 The cafe has been purpose built for tourists on their property, a property that is also home to some Highland Coos. 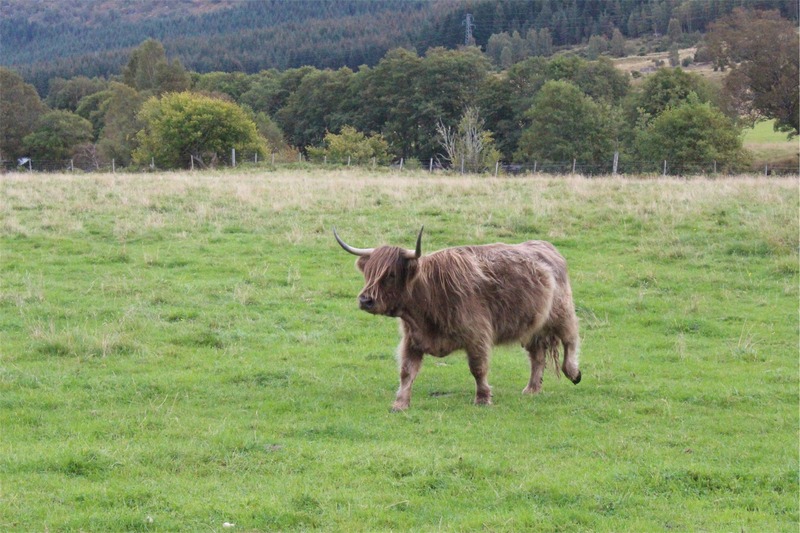 Until this point, Highland Coos were about as real as Nessy since we hadn’t seen any. When we mentioned them to the owners, they actually went and got them to come over to us, enticing them to the fence with some food! We couldn’t believe our eyes. 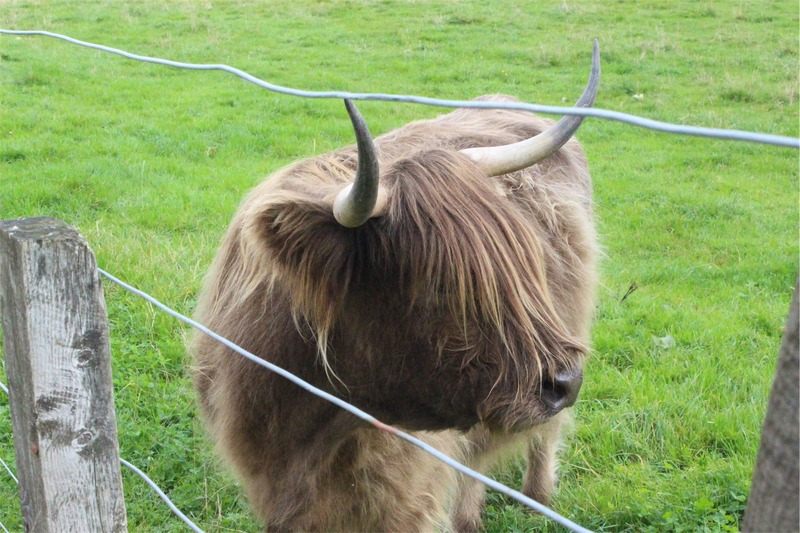 They were so cute with their huge horns and emo fringes. 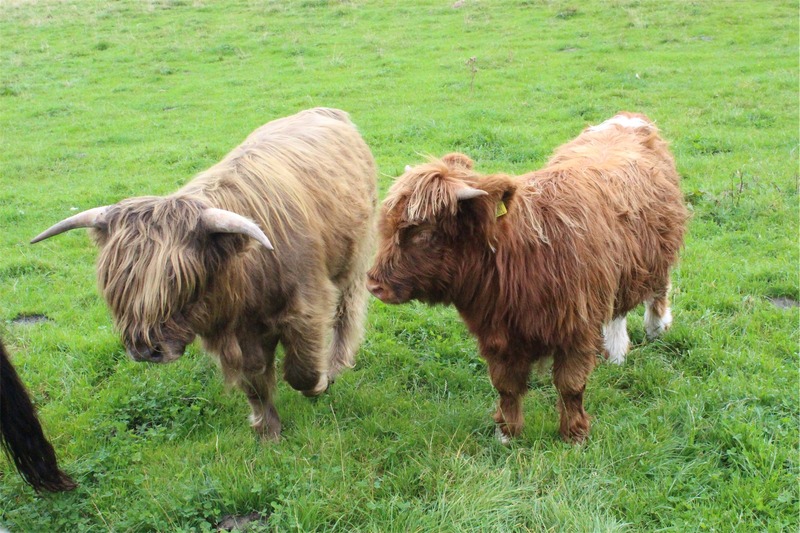 By the way, they aren’t some mythical beast – Coo is the way the Scottish say “cow”. 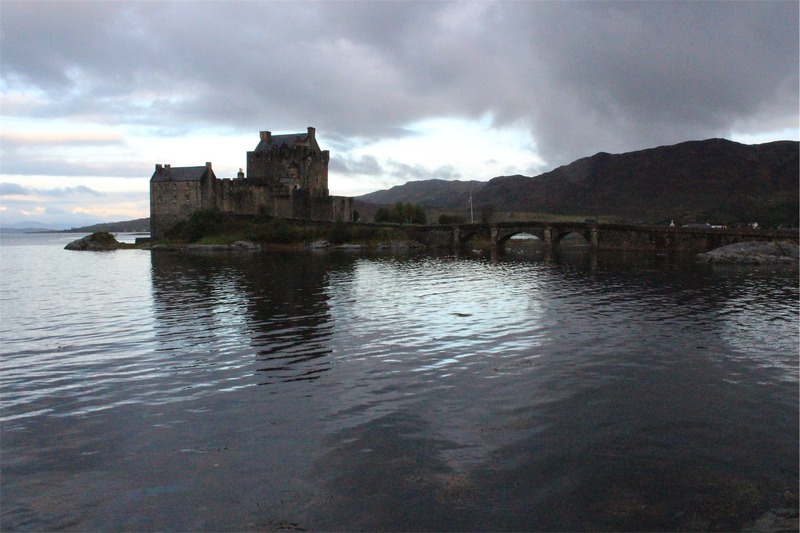 After leaving the cafe, we only had about another 45 minutes to our final destination for the day – Dornie. 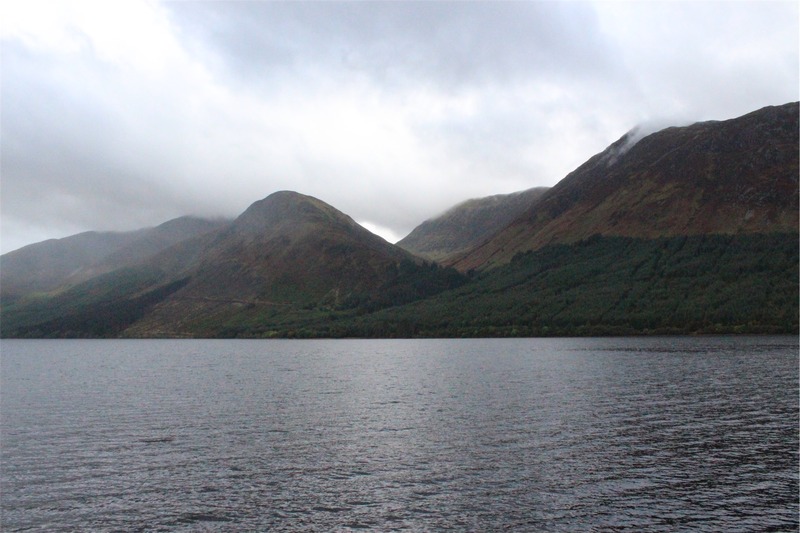 Again, the landscape changed and we loved seeing the huge mountains and numerous lochs. 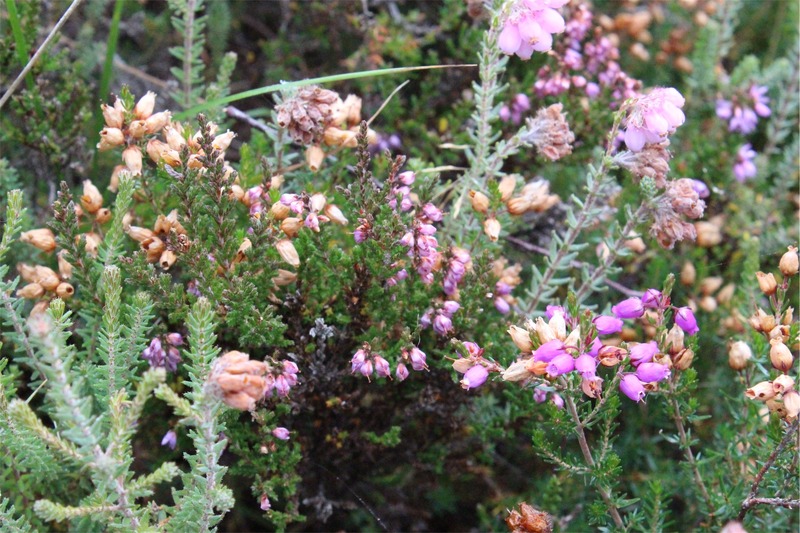 We even got to see the famous Scottish heather up close. 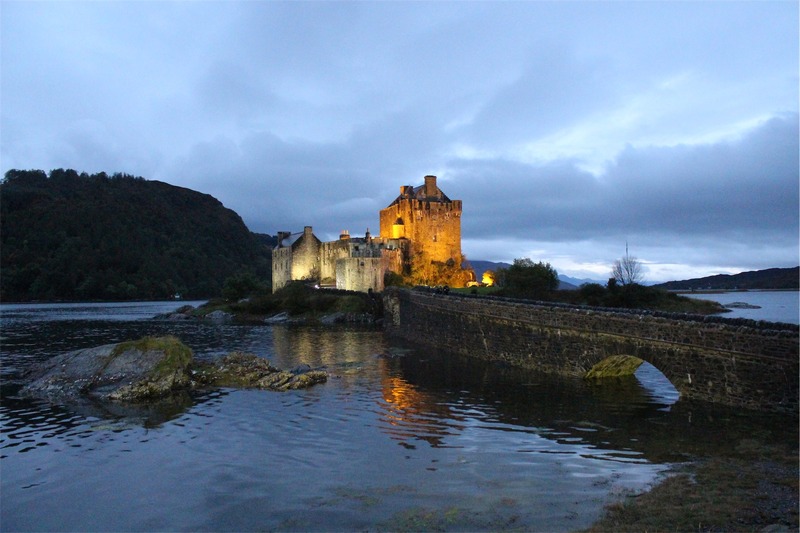 Eilean Donan is a small tidal island where three lochs meet, Loch Duich, Loch Long and Loch Alsh, in the western Highlands of Scotland; since the castle’s restoration in the early 20th Century, a footbridge has connected the island to the mainland. 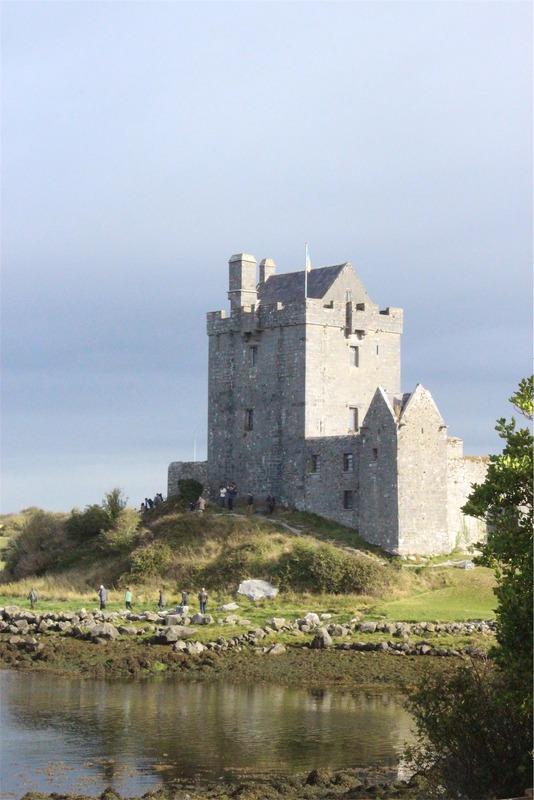 In the 13th century the first castle was built on the island, but over the years has been destroyed and rebuilt many times. More importantly, and the reason why Keith was so excited to come here, there were a few movies filmed here. 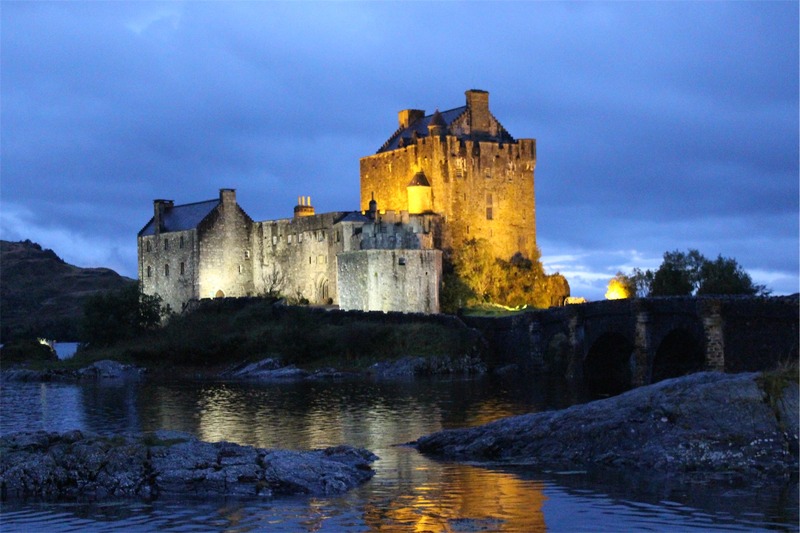 The movie ‘Highlander’ (Keith’s favourite movie) was filmed here as well as some scenes from the Bond movie – ‘The World is Not Enough’. 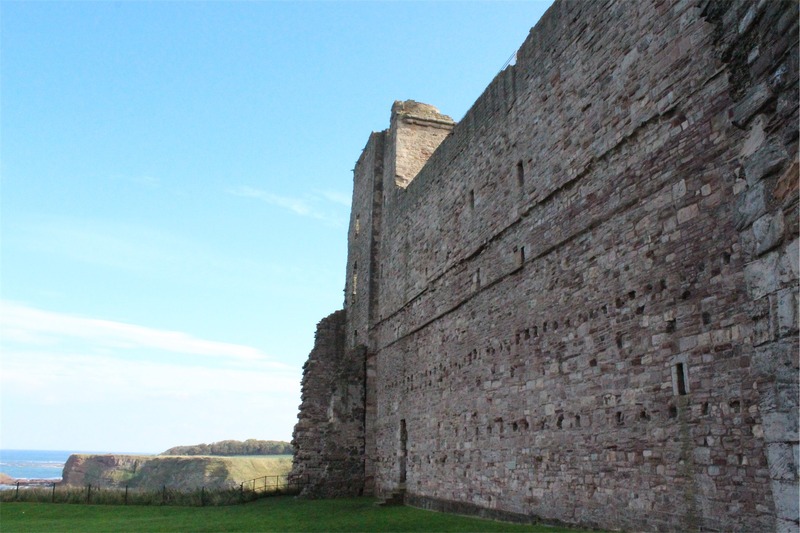 We explored the whole castle and the museum like rooms they have set up for visitors. After taking thousands of photos, we headed off to check in to our accommodation. We decided to get some dinner and had a choice of two pubs, being the only places open in the area. We had a great meal at the pub we chose and met a mother and daughter from our home town back in Australia! They had travelled to this village for the same reason we had. 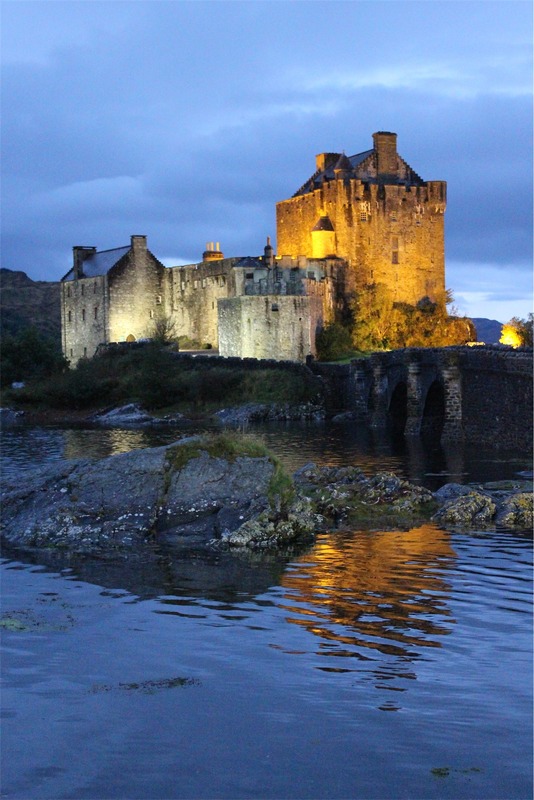 After dinner we headed back down to the castle to take a thousand more photos – to our surprise it was lit up at nighttime and looked amazing! Happy with the photos we headed back to our cute little B&B and enjoyed chatting with the owner – an expat that had been in Dornie for 30 years, but was originally from Melbourne! We went to bed, deciding to go back in the morning to take another thousand photos… just in case. 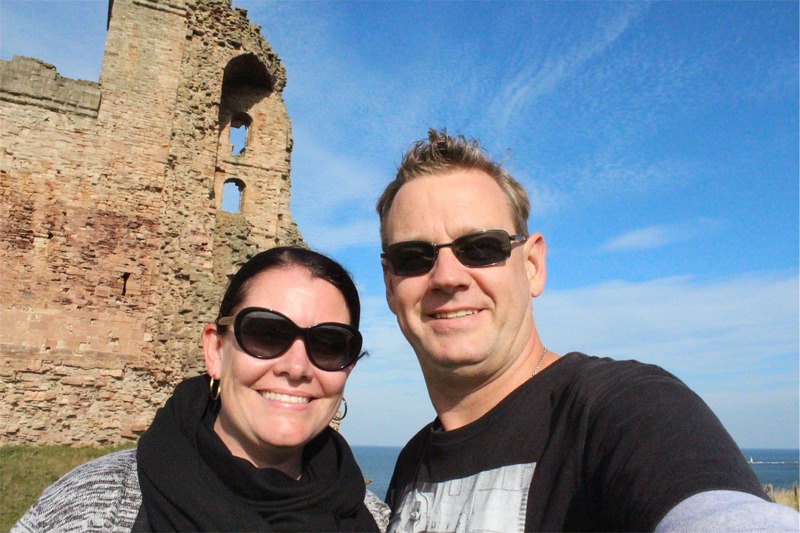 After leaving Castle Tantallon, we finally made it to Edinburgh. 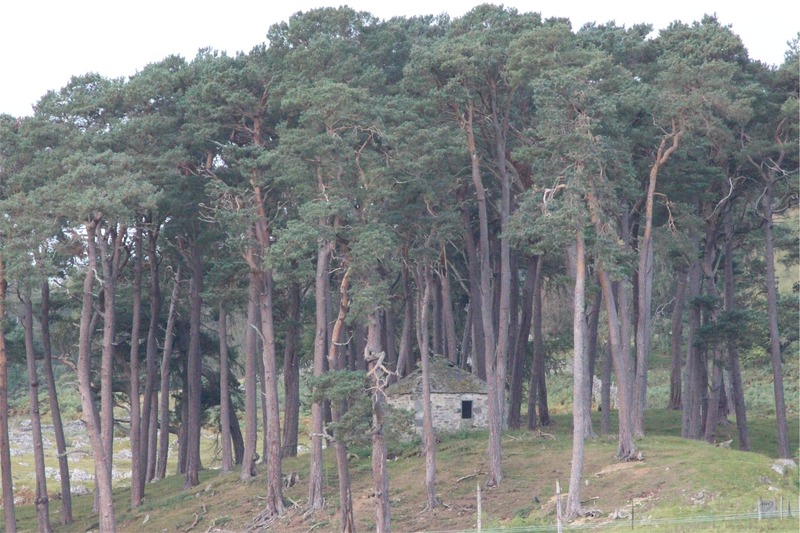 The change in architecture was noticeable even as we drove into the outskirts of the city. 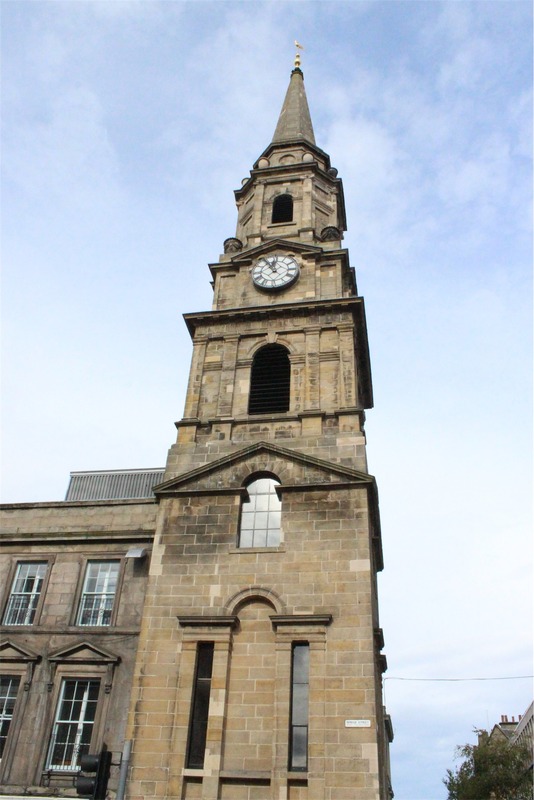 Approximately 20 minutes away from the centre of Edinburgh we discovered a cute little church called the Portobello And Joppa Parish Church. 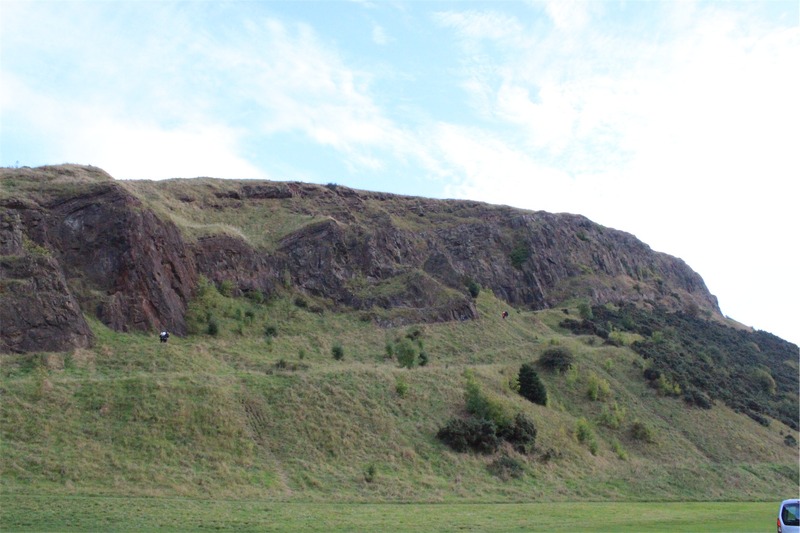 Arthur’s Seat located in Holyrood Park only 10 minutes from the city, is named after King Arthur and from its peak gives an impressive view of the city. 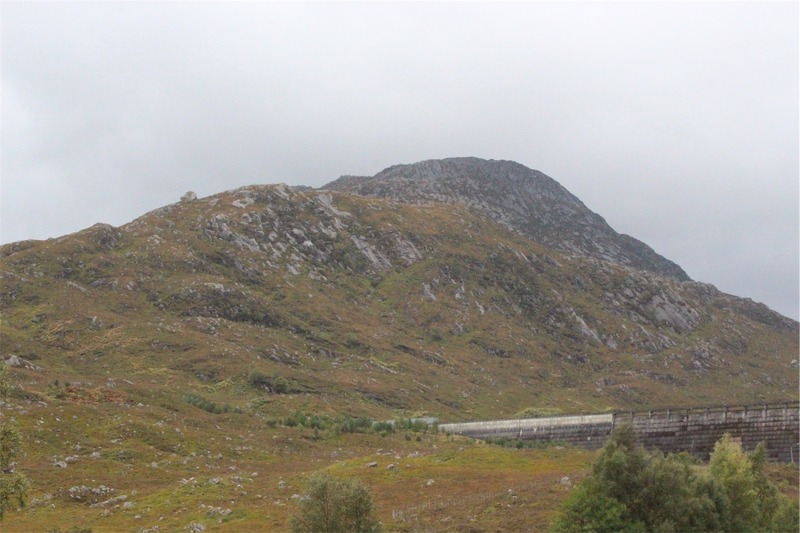 Unfortunately it would be dark by the time it would take to walk to the top, we decided not to attempt the climb. We finally found our way into the centre of the city after an incredible day. Unfortunately we were losing daylight fast, it was already 5:50pm and sunset wasn’t far away at 7:10 pm. We quickly found an advantageous free parking spot (the benefit of arriving after 5 pm) and we began our exploration of the city. 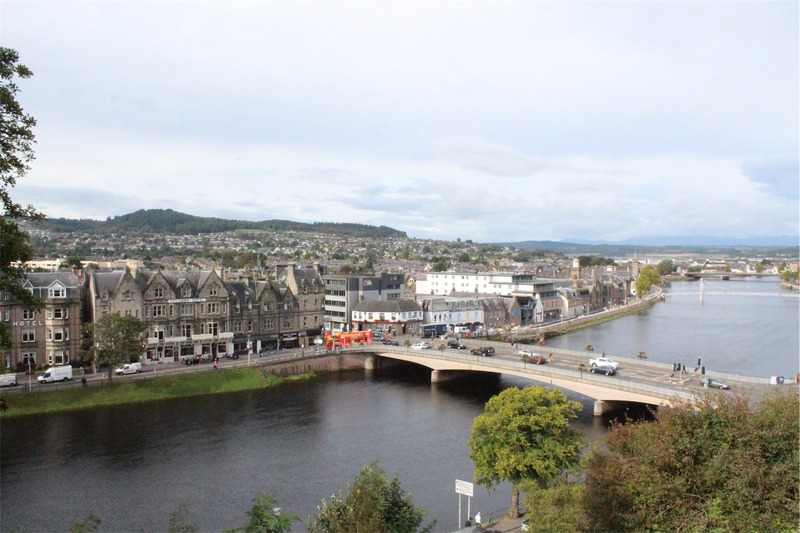 Looking down North Bridge toward The Balmoral Hotel. The Woollen Mill looking down Cockburn Street. 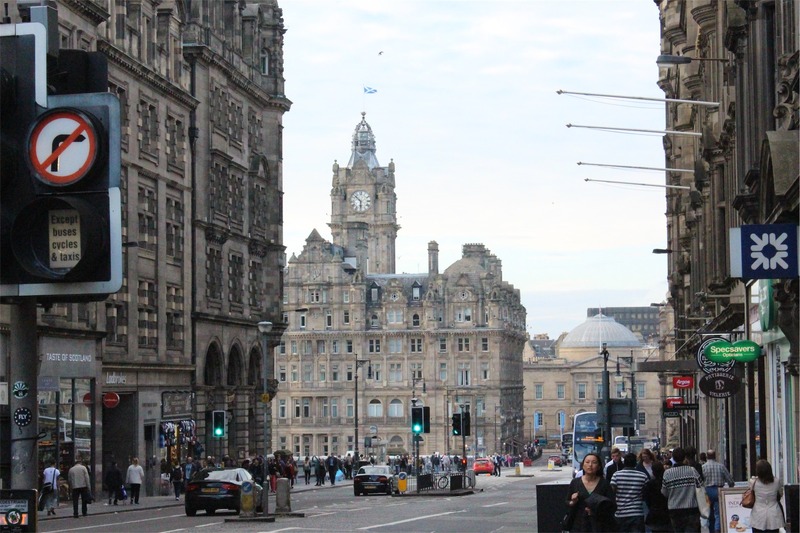 Looking up the Royal Mile towards Edinburgh Castle. 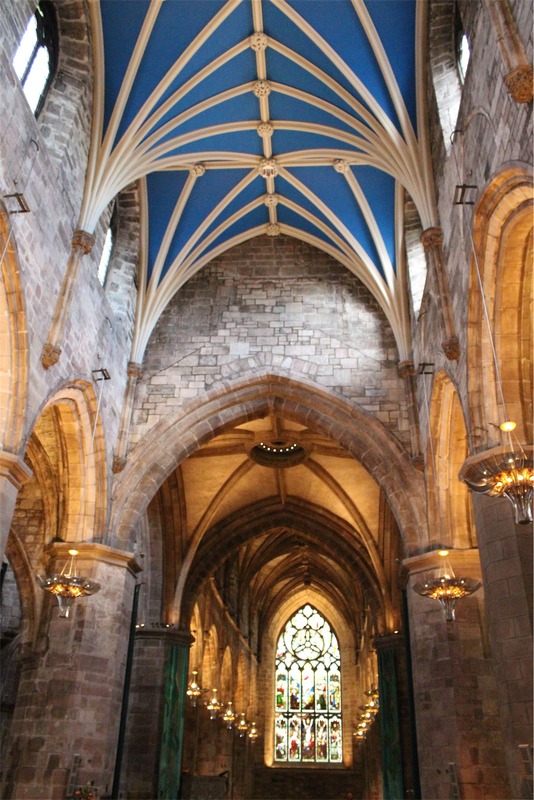 The St Giles Cathedral. 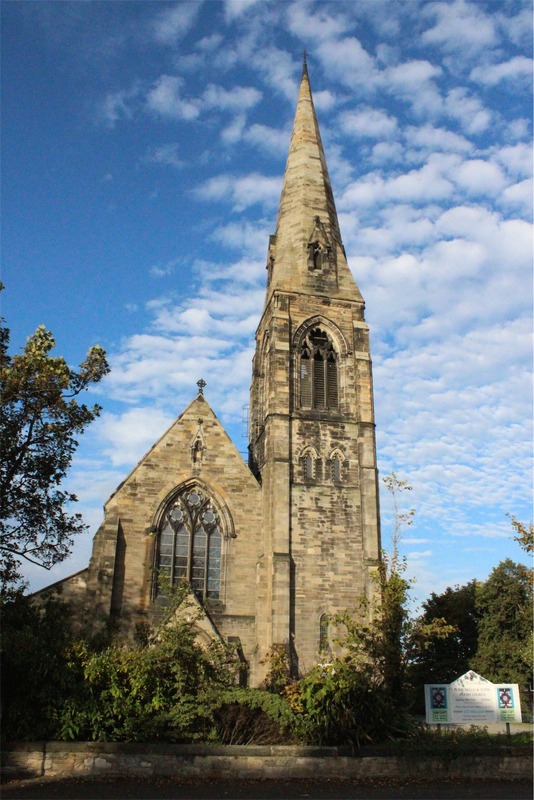 The present church dates from the late 14th century, though it was extensively restored in the 19th century. 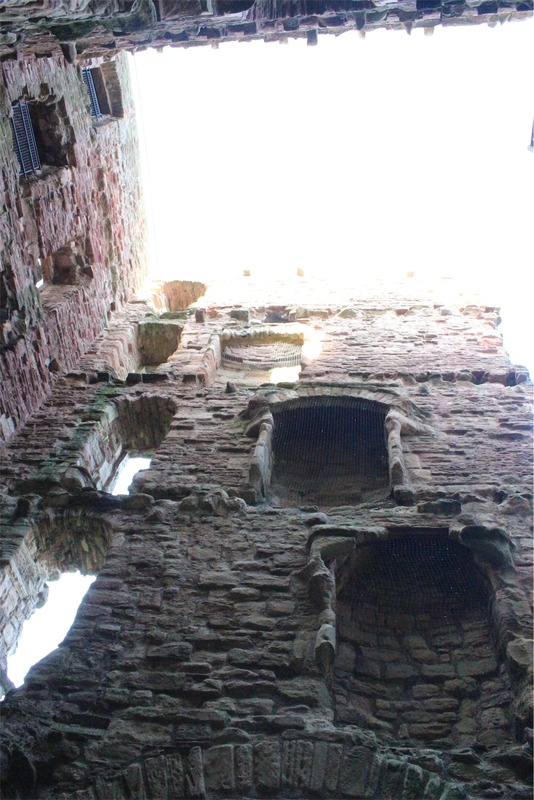 The oldest parts of the building are four massive central pillars, often said to date from 1124. 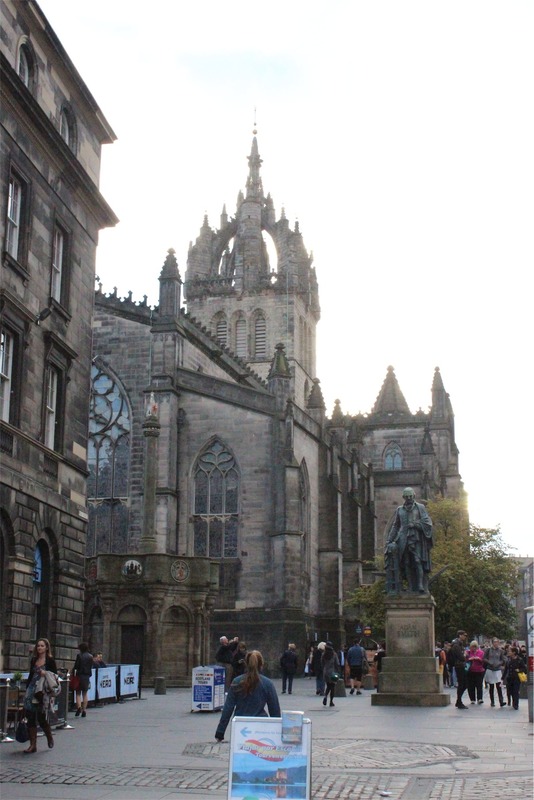 Outside the Cathedral is West Parliament Square, and perched right in the middle is a statue of Walter Montague Douglas Scott, 5th Duke of Buccleuch by sculptor William Birnie Rhind. 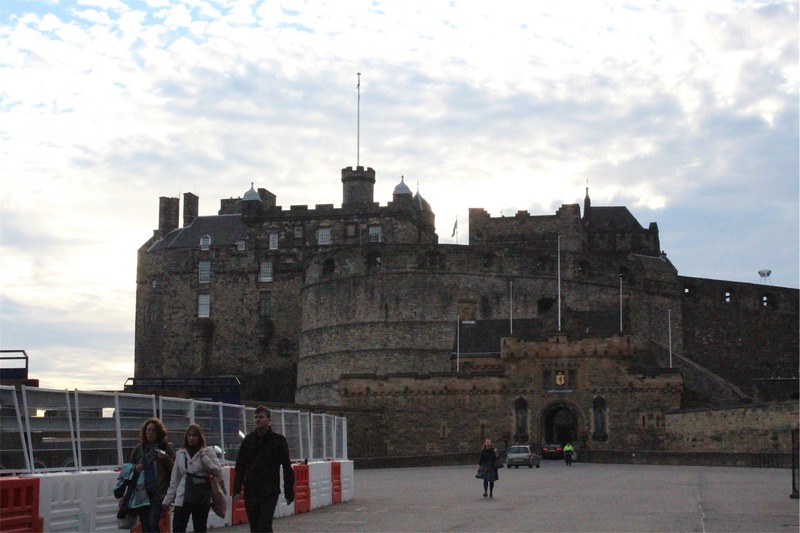 The main casualty of running behind schedule today was the opportunity to extensively look through Edinburgh Castle. 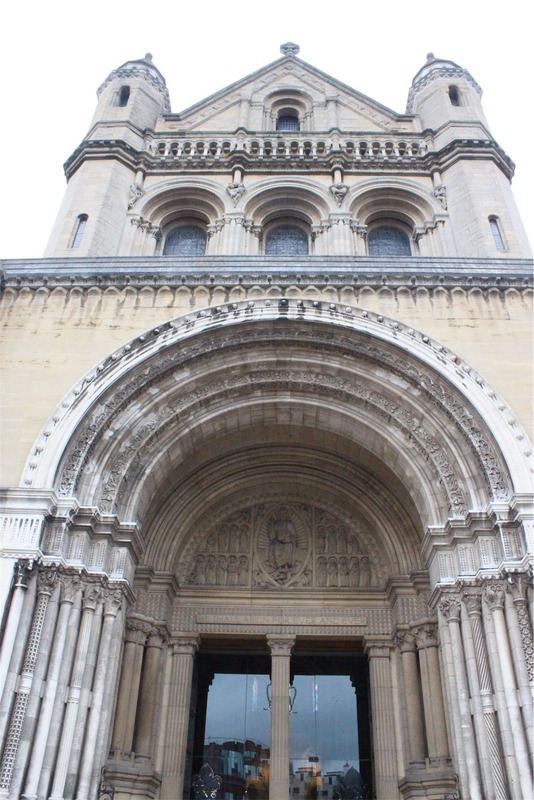 We tried to get in, but security guards told us that the last visitors had been admitted at 4 pm. 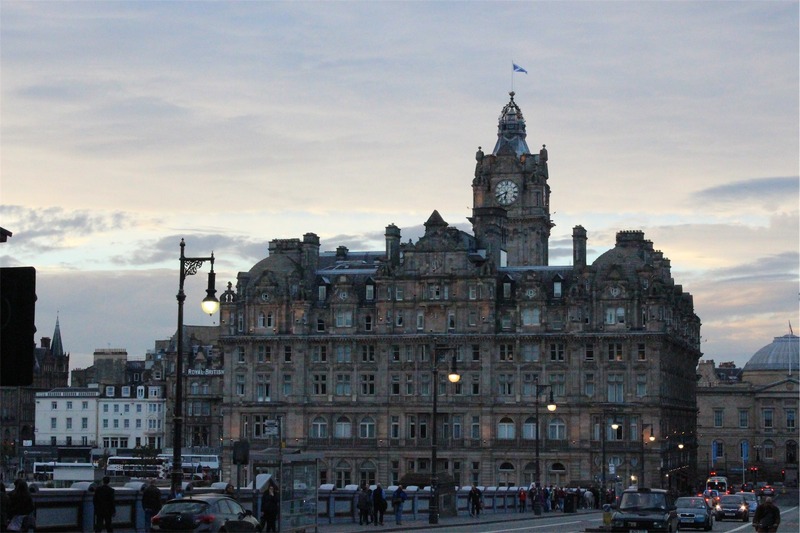 One of many reasons why we would love to return to this beautiful city. 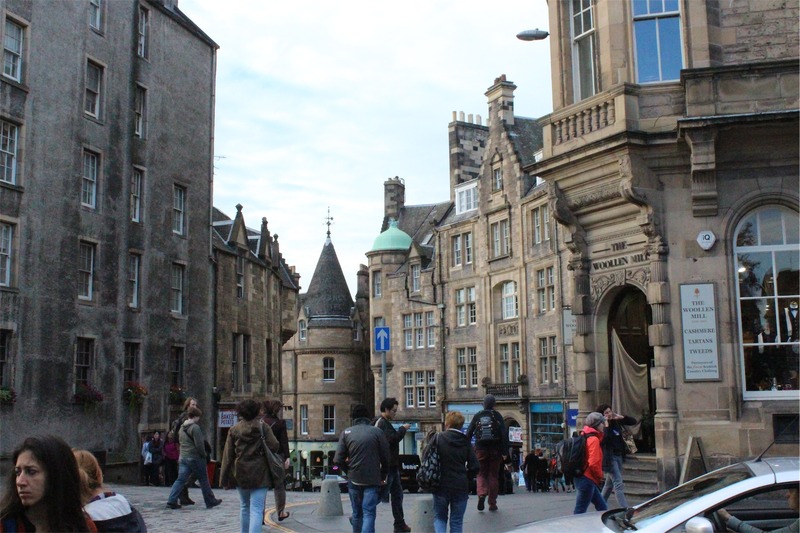 The Hub, at the top of Edinburgh’s Royal Mile, is the home of the Edinburgh International Festival. 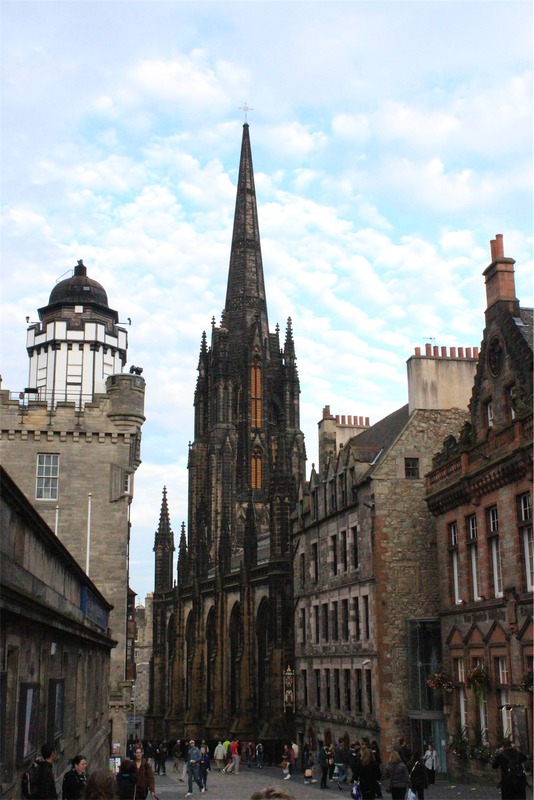 Its gothic spire, the highest point in central Edinburgh, towers over the surrounding buildings. 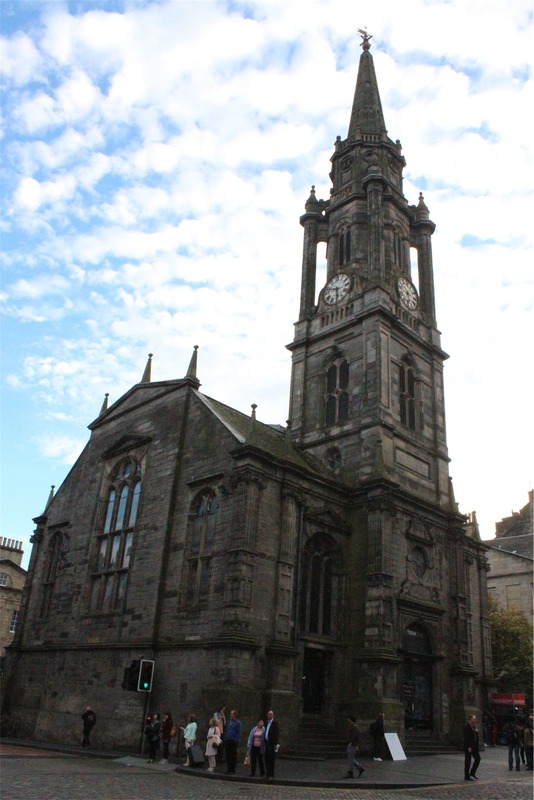 The Hub was originally built for the Church of Scotland constructed between 1842 and 1845. 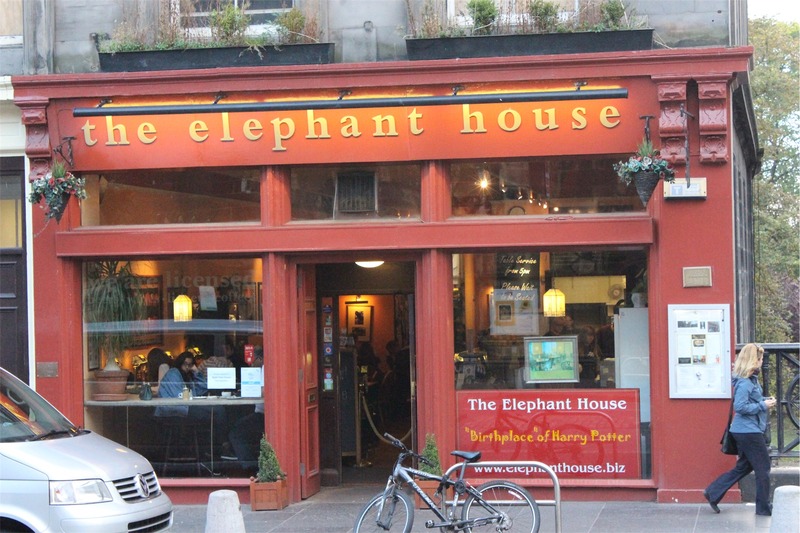 The Elephant House, opened in 1995, was made famous as the place of inspiration for J.K. Rowling, who sat writing much of her early novels in the back room overlooking Edinburgh Castle. 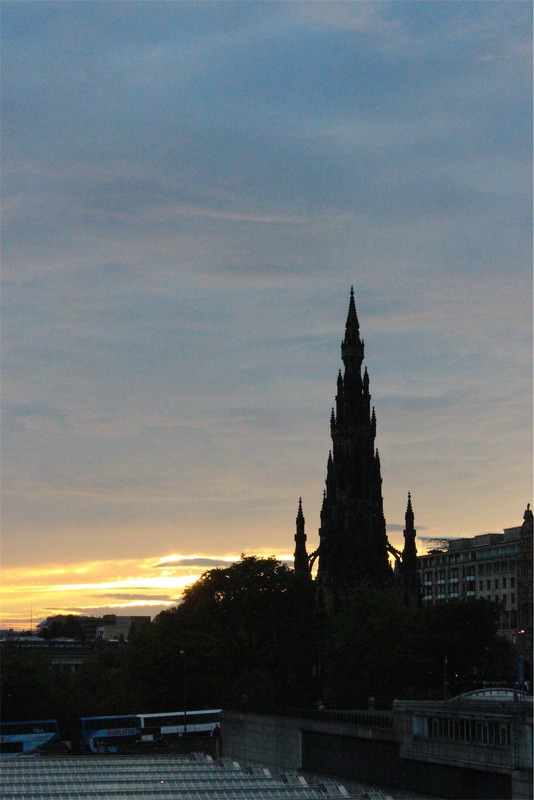 We made our way back to North Bridge to see the sunset. The view from the bridge was spectacular! After such an amazing day we headed back to the car, via a cafe to have tea and scones, before checking into the hotel and happily resting our weary feet. 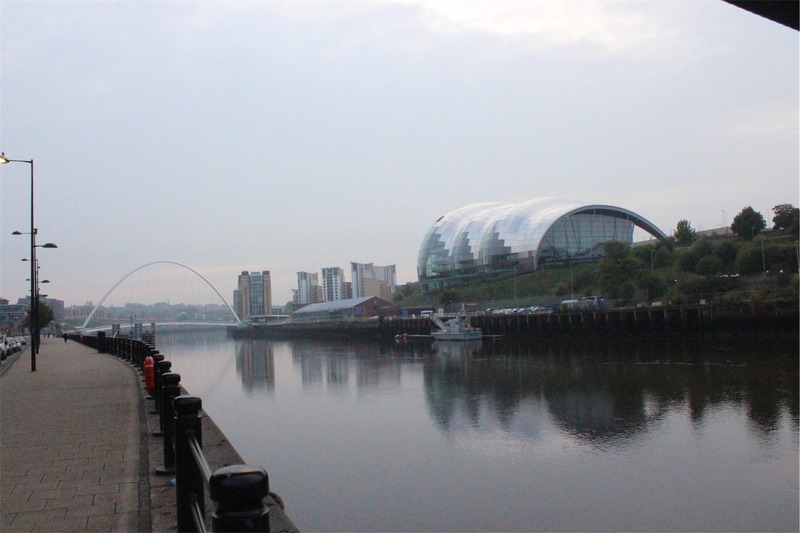 We decided to get an early start on our sightseeing around Newcastle before having breakfast and checking out of the hotel. 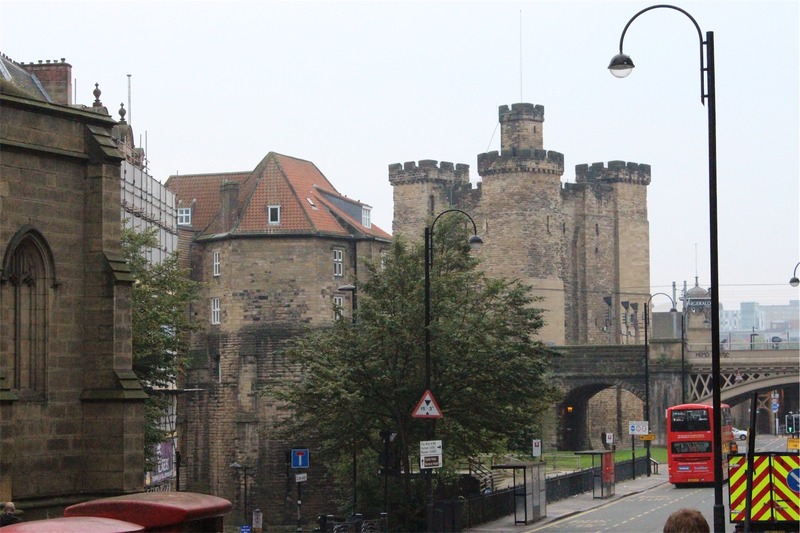 A long walk through Newcastle revealed some treasures we didn’t know to expect and ticked off some sights we had read about previously. 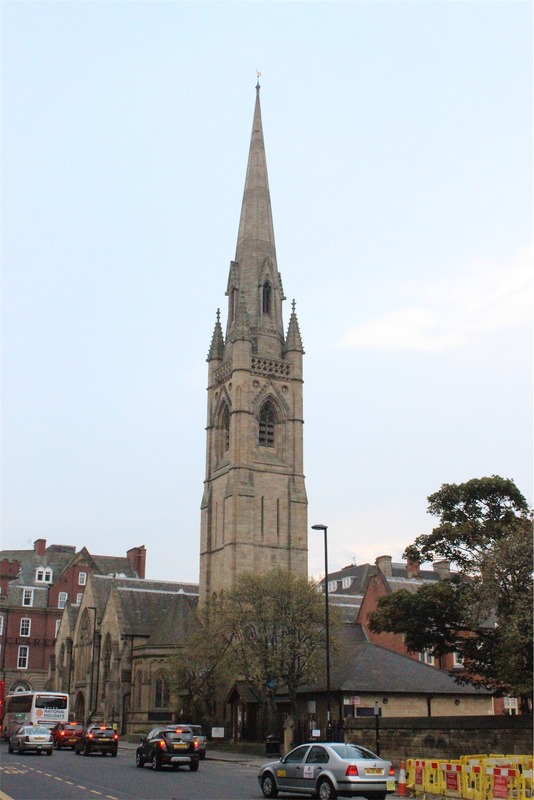 The following photos show some of these sights – St Mary’s Cathedral (first 2), Cathedral Church of St Nicholas (next 2), All Saint’s Church, a building on Quayside and the Newcastle Central Train Station. 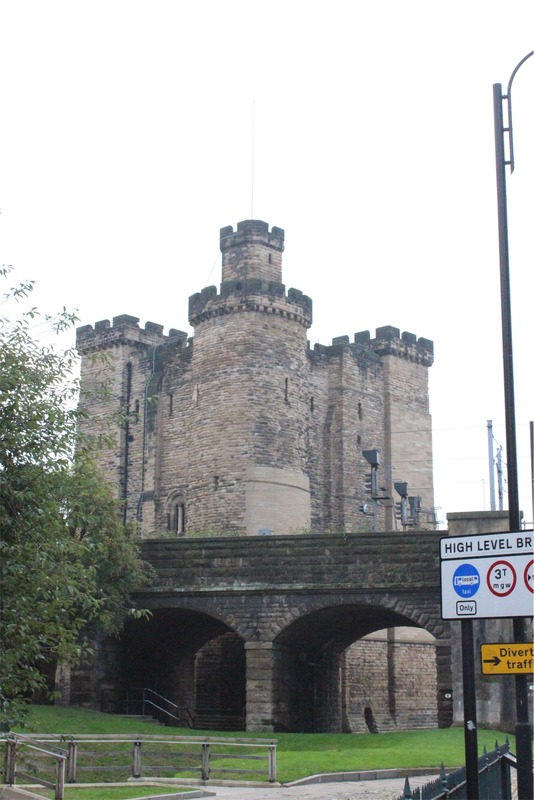 Castle Garth and Castle Keep are the key landmarks in Newcastle. 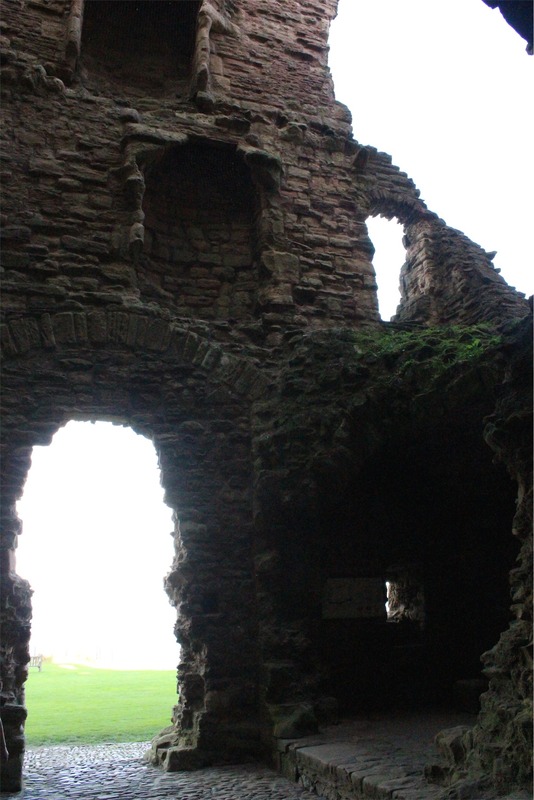 They are the ruins of the original Roman castle built in the second century AD. 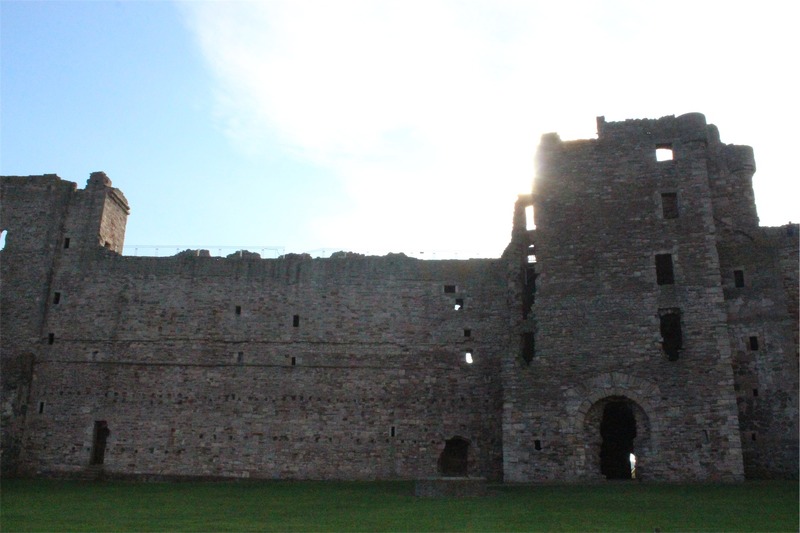 The ‘New Castle’ (which gave the town its name) was founded in 1080 by the eldest son of William the Conqueror. 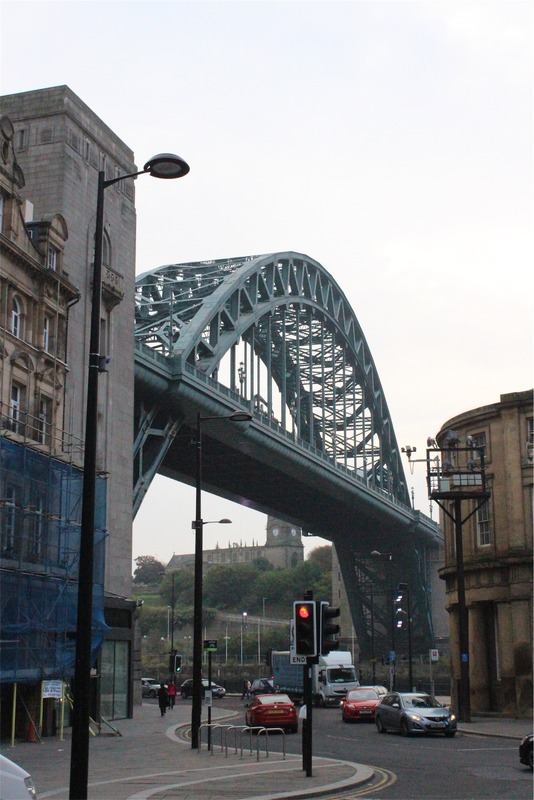 A pleasant surprise for us was finding the Seven Bridges of Newcastle. 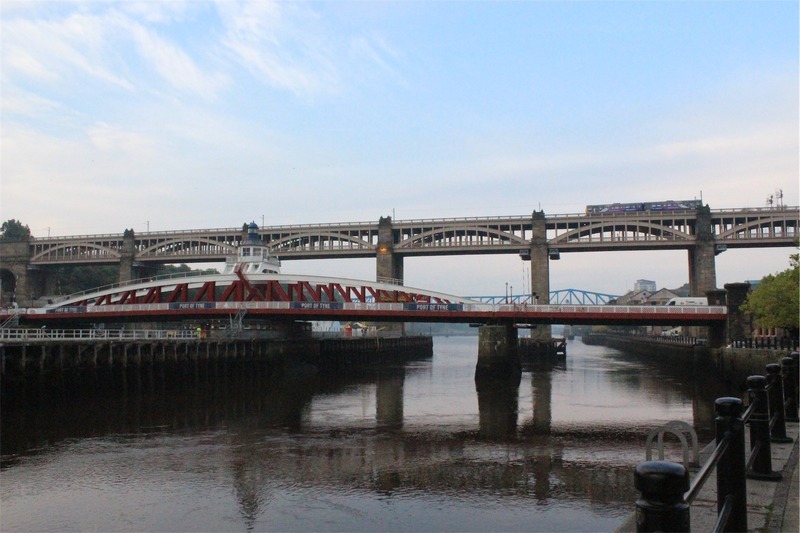 The photos below show The Tyne Bridge (remarkably like the Sydney Harbour Bridge) and The High Level Bridge. 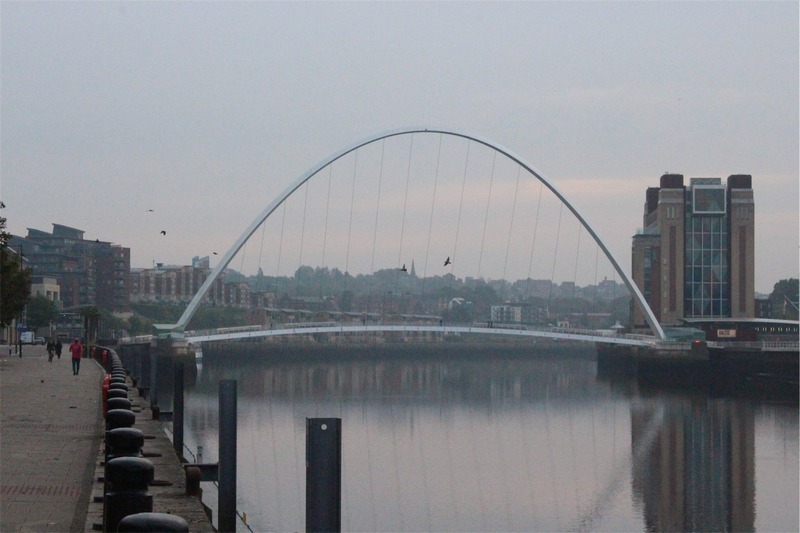 The next two photos are of the Millennium Bridge, the first one with the Sage Gateshead Music Centre looking like a metal caterpillar on the banks of the Tyne. 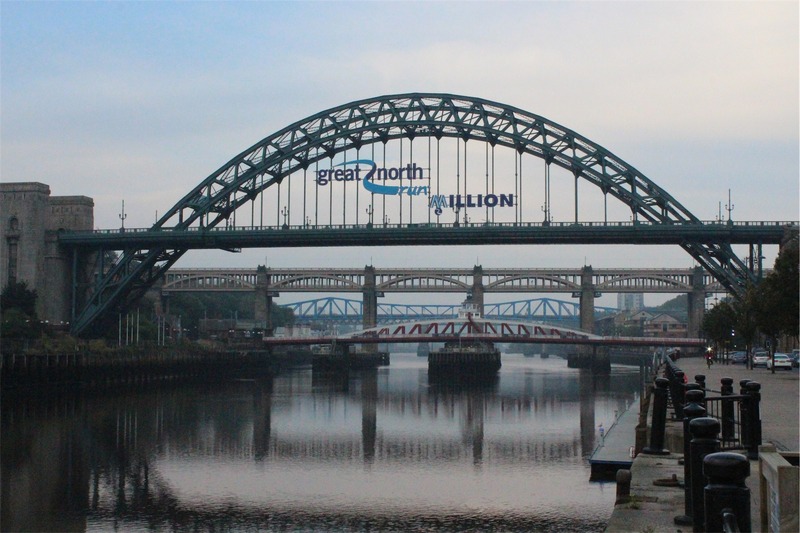 And finally a profile shot of the Tyne Bridge, Swing Bridge, High Level Bridge and Queen Elizabeth II Bridge. 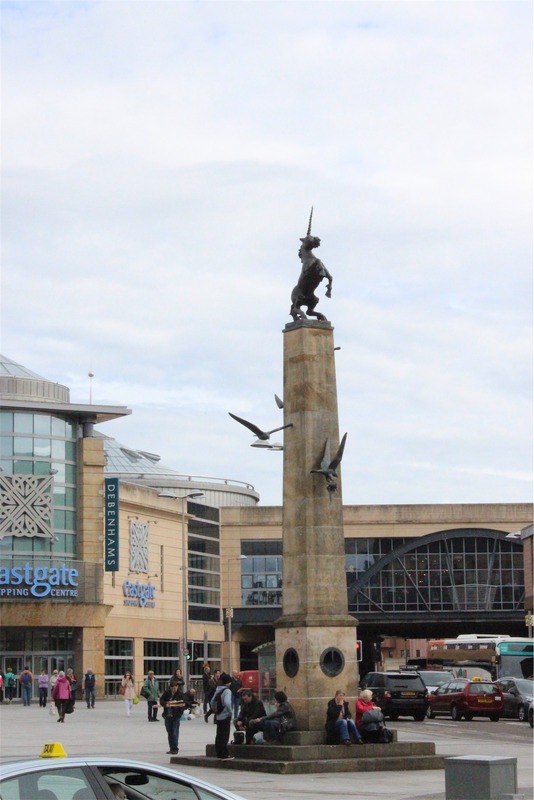 After having some breakfast and checking out of the hotel, we left Newcastle making our way towards the Scottish border. 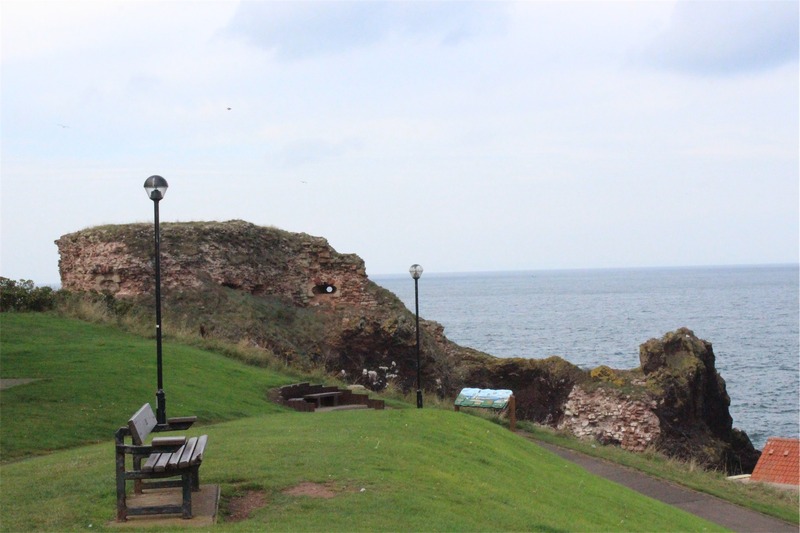 A little over an hour later Keith saw a sign advertising Berwick upon Tweed as being the Northernmost town in England, home to the ruins of the old town walls and fortress. We decided to stop in and check them out. 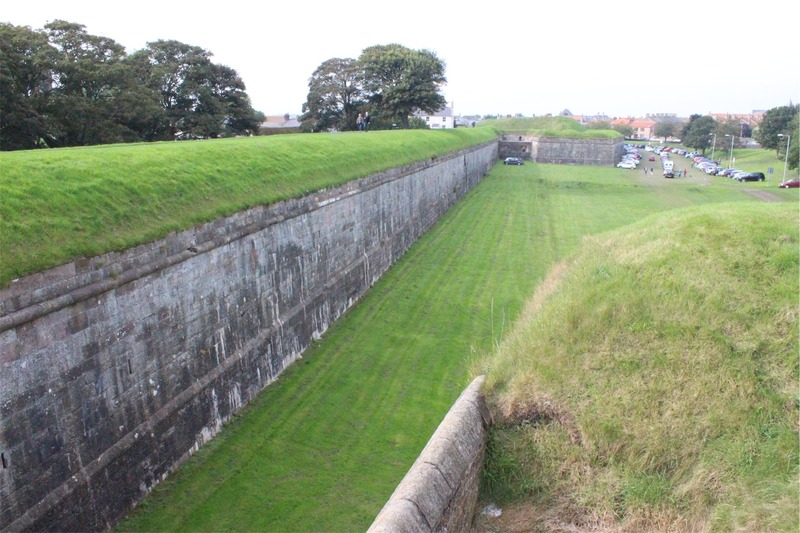 Berwick upon Tweed was a busy little town. 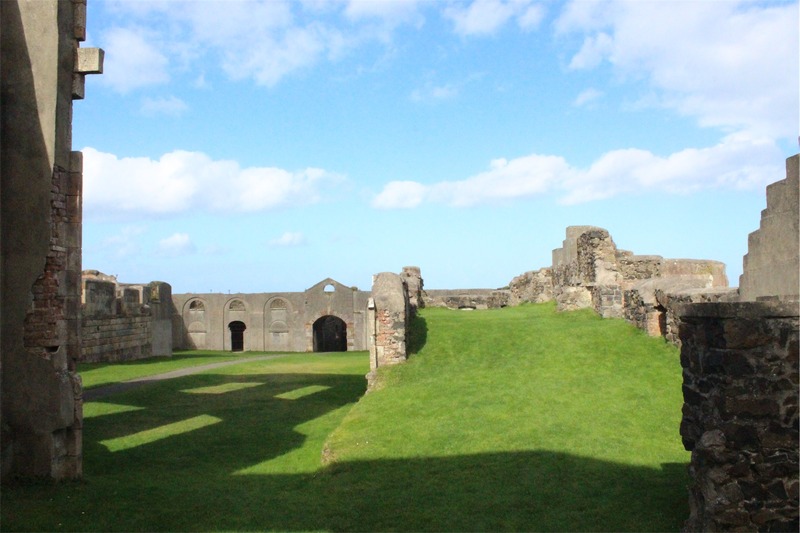 We found some free car parking near St Andrews Church and went for a short stroll past the Church and Council Offices up to the Town Wall ruins. 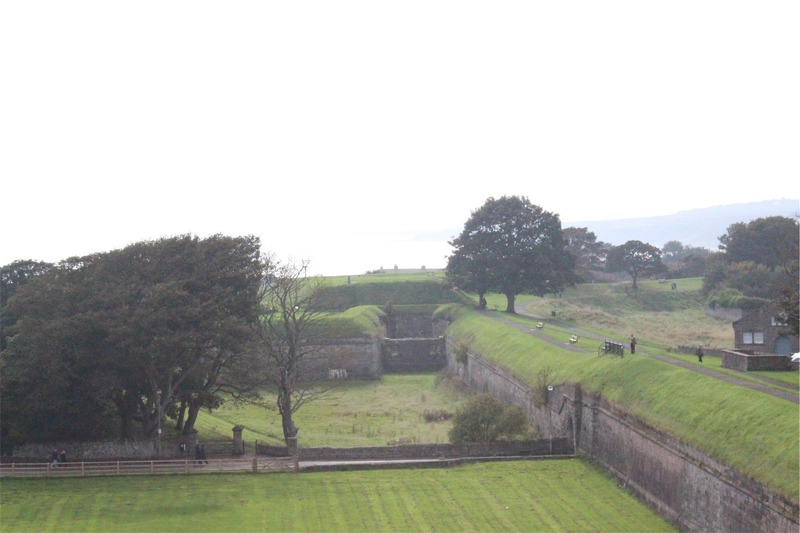 The last two pictures above are of the old Fortress and a creepy looking cemetery. 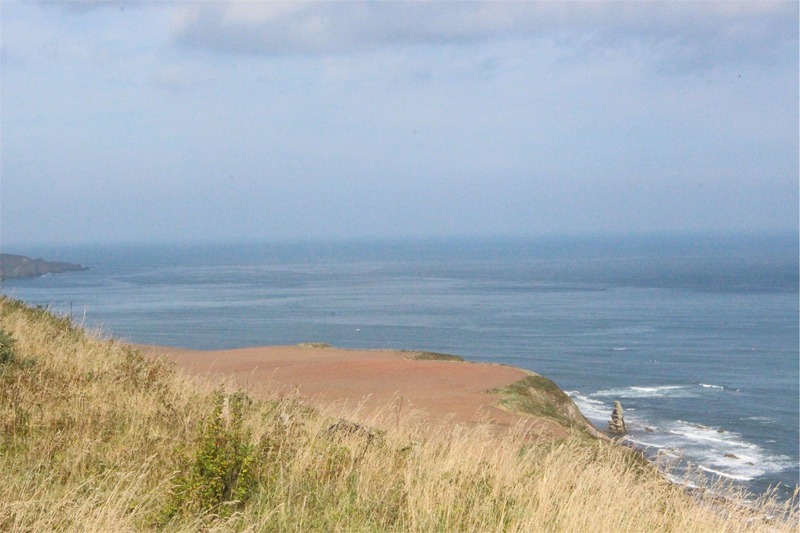 After leaving Berwick upon Tweed driving along the coastal road, it wasn’t long before we realised we had just driven across the Scottish border. 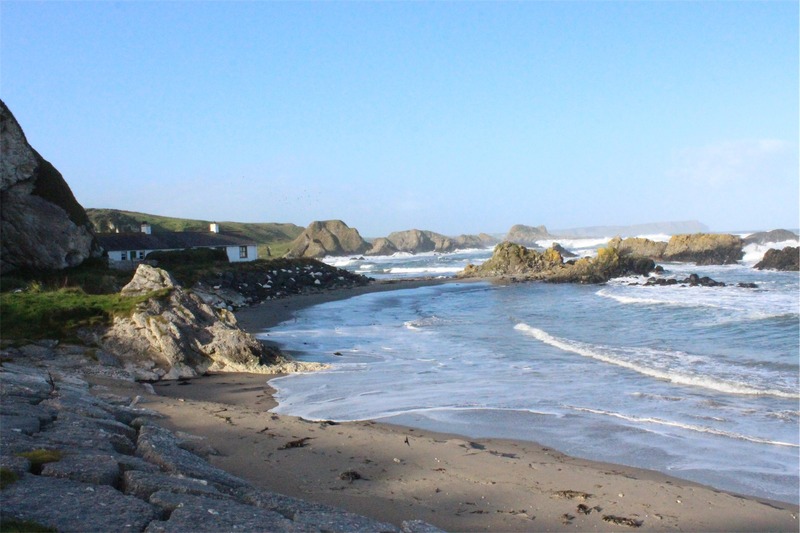 These photos are of Hilton Bay, just across the border on the Scottish side. 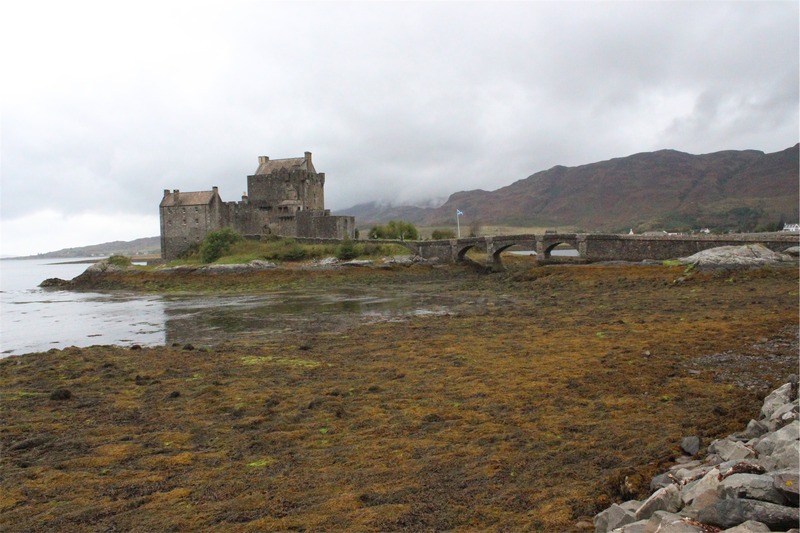 We continued driving along the southeast coast of Scotland making our way to Edinburgh. 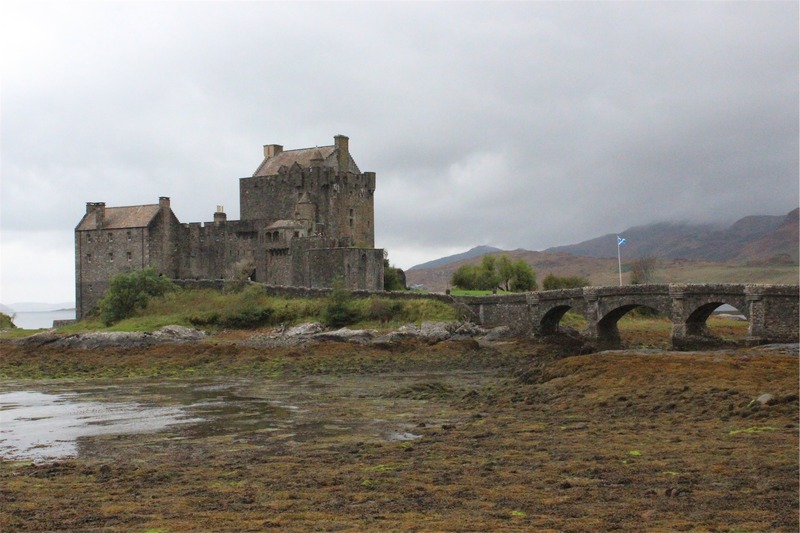 Since it was close to lunch time, we looked for a little Scottish pub to have a meal. 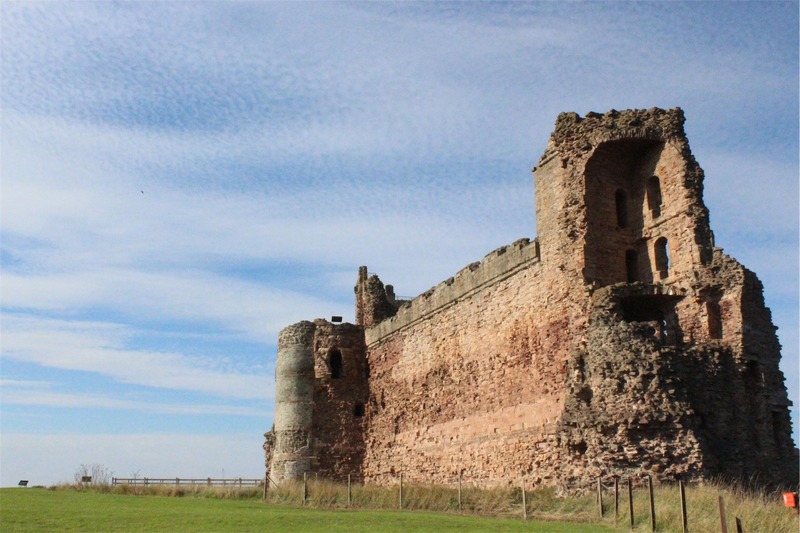 Driving through Dunbar we spotted the Castle Hotel and decided that it would do the trick. 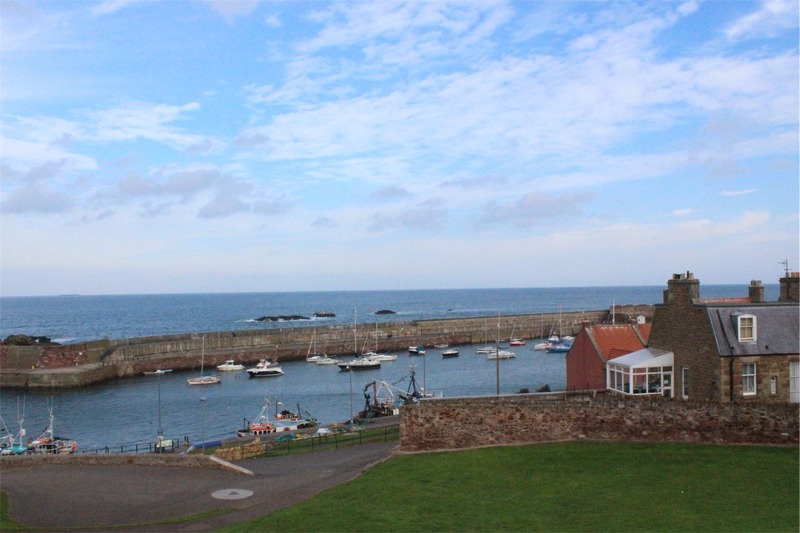 Dunbar is a sleepy coastal town full of charm with a history of conflict. 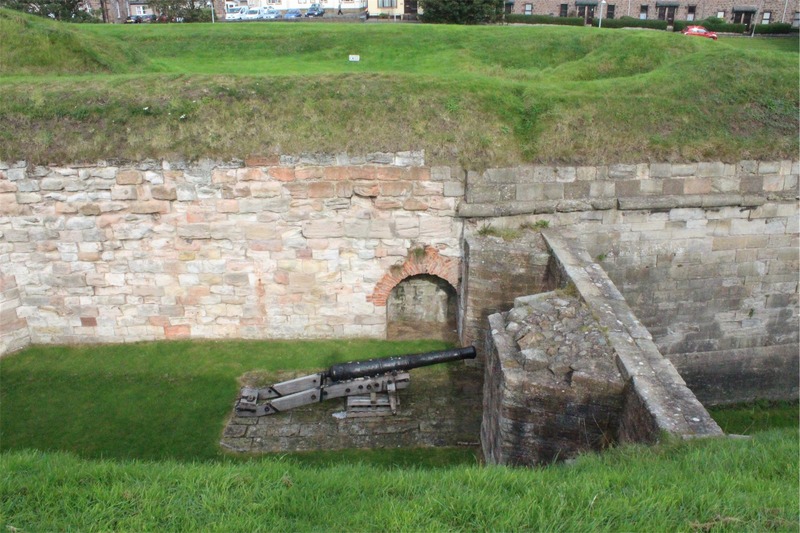 There is a small port there that used to be the site of one of the most mighty fortresses in Scotland. 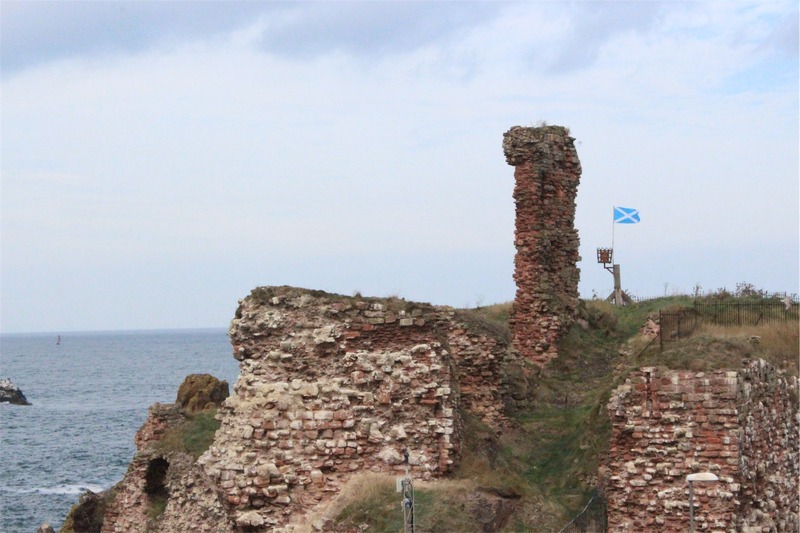 We went for a short walk and found a good view of the port and ruins of the castle. 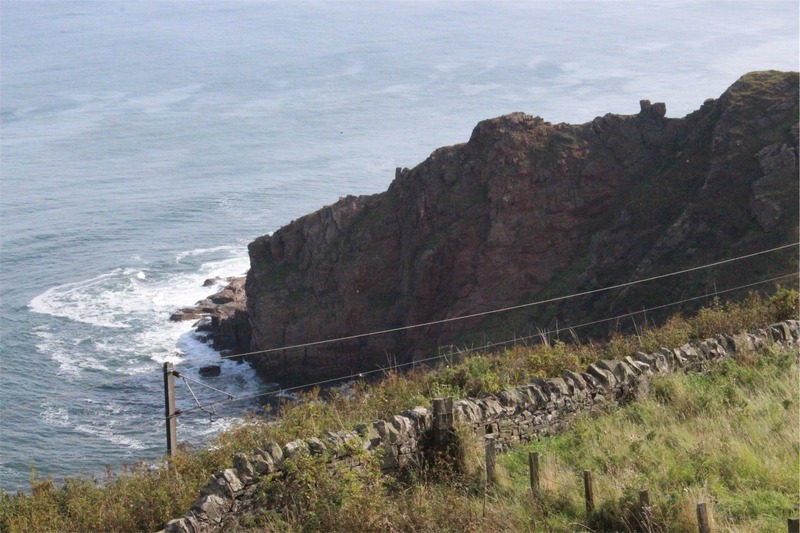 After lunch we continued on our way to Edinburgh via the coast. Stopping at a look out for what we thought would be a few quick photos of the Scottish cliffs and ocean, we spotted castle ruins in the distance. Keith got so excited we had to turn around and back track to see if we could get a closer look. 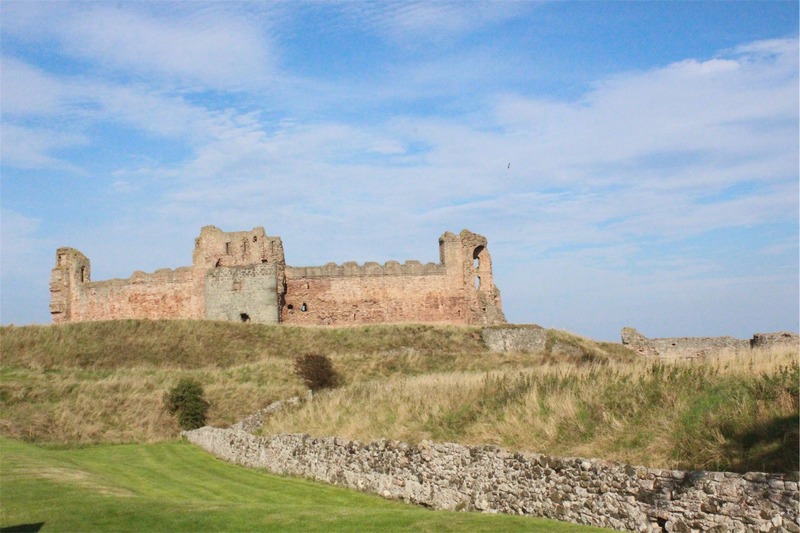 It turned out that it was Tantallon Castle which was open to tourists to walk through. 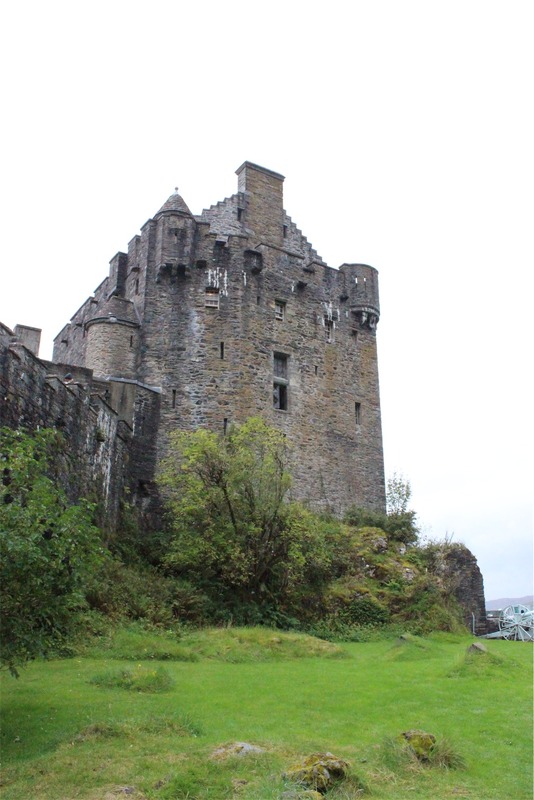 It only cost about five pounds each to enter the castle, but it was priceless. The photos speak for themselves. 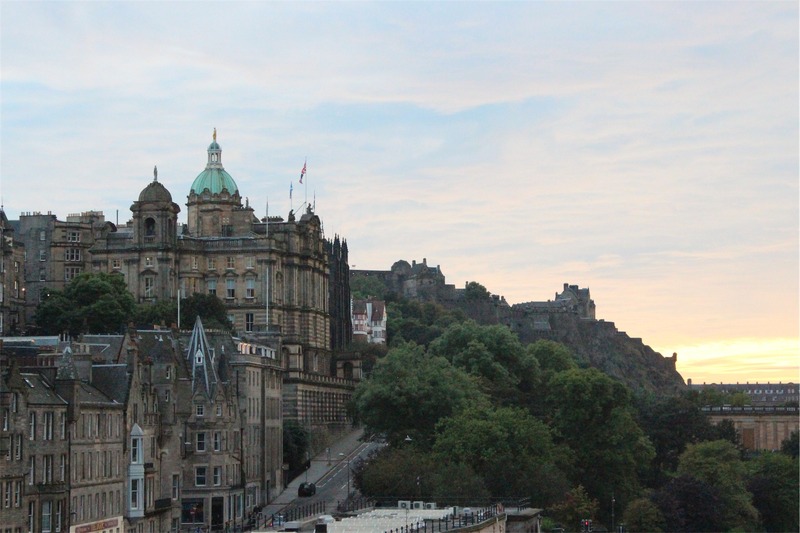 The plan for today was to make the short 2 and a half hour drive from Newcastle to Edinburgh and have plenty of time to explore the country’s capital. 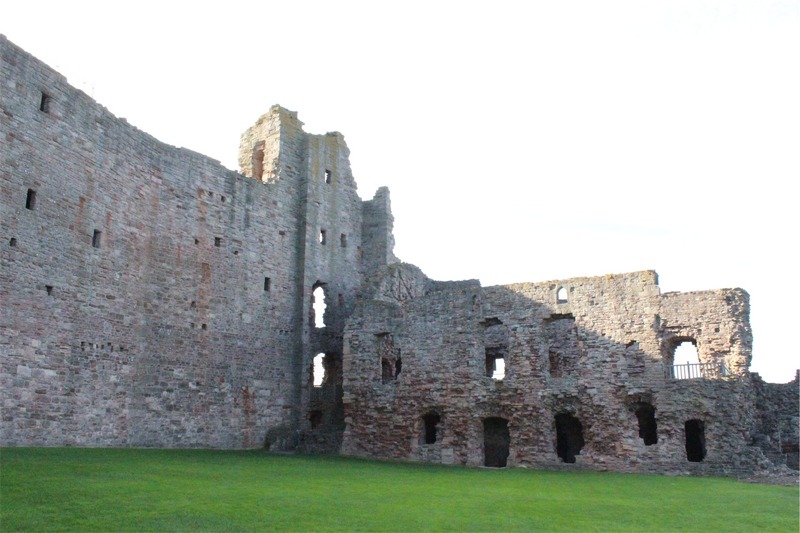 With our unexpected finds of the bridges of Newcastle, city walls of Berwick on Tweed, ruined castle of Dunbar and now the incredible Castle Tantallon, we were well behind schedule. 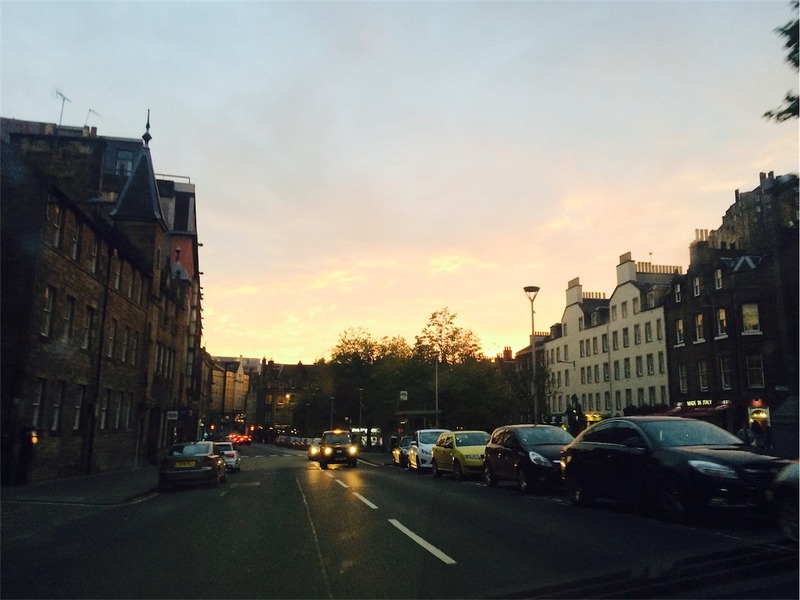 Stay tuned for our next blog post where we actually make it to Edinburgh!